See a Cuba tourists never see. 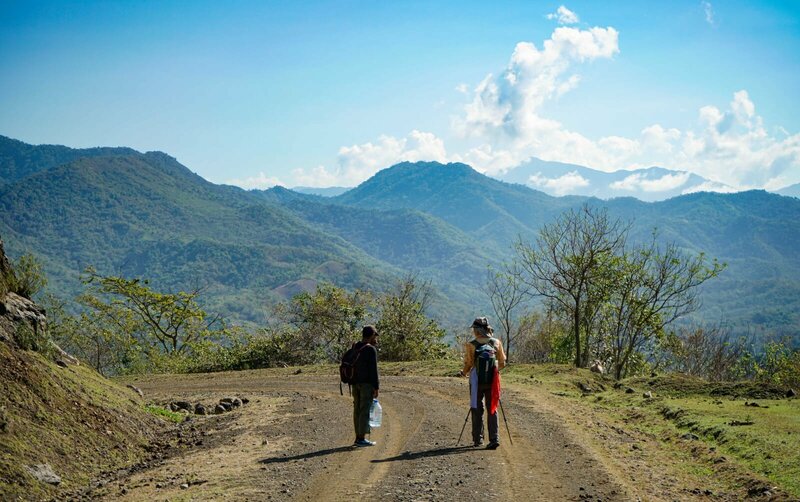 Hike la Ruta de la Revolución trek which follows the historic route of Fidel Castro and Che Guevara that started the Cuban Revolution—from landing in Cuba in a foundering boat to their famous hideout deep in the Sierra Maestra Mountains. Walk for days on wooded trails and mountain roads—see no cars, only the occasional mule cart. 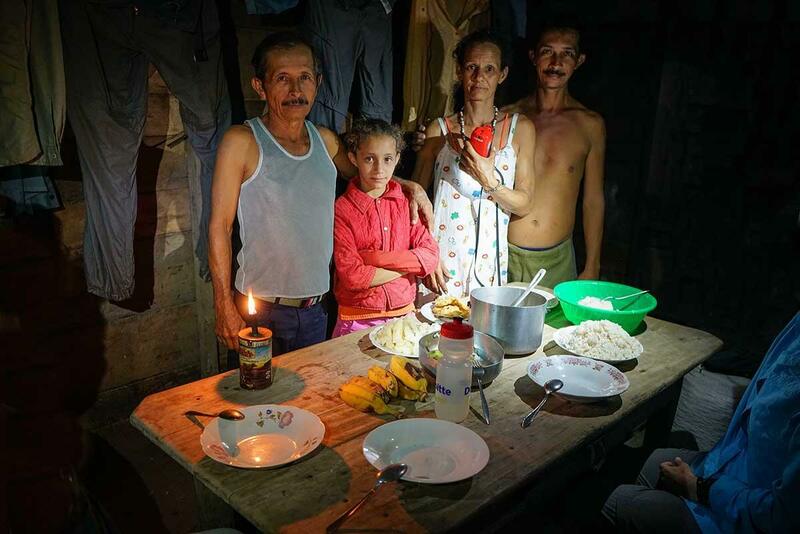 Eat dinner by oil lamp with campesino families in remote rural villages. And finally, be one of the very first to do the La Ruta de la Revolución while it’s “undiscovered” and unspoiled. 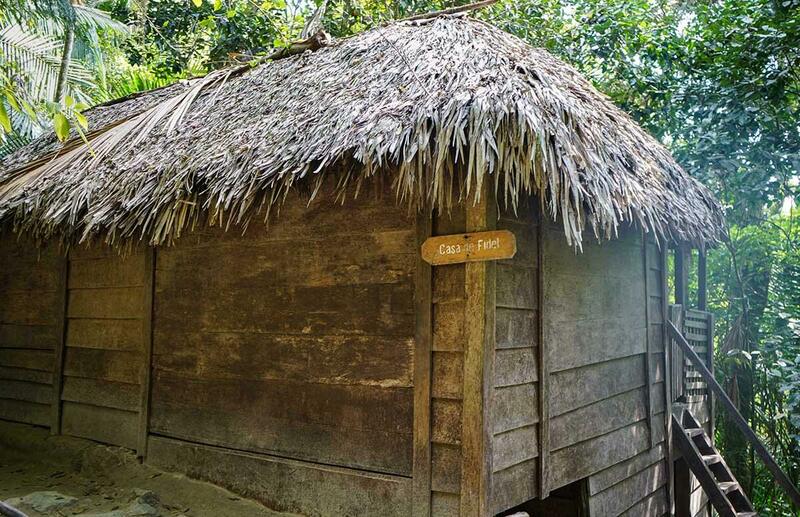 We didn’t see a non-Cuban until we reached Fidel Castro’s Comandancia de La Plata hideout deep in the Sierra Maestra Mountains. A Detailed Route Description and Photo Essay since few non-Cubans have visited this area. It documents the people and places and should give you a good feel for what La Ruta is all about. View of the Sierra Maestra Mountains from near Fidel Castro’s Comandancia de La Plata hideout and command center. You’ll see a Cuba that other tourists don’t see. This is not the touristy beaches, antique cars, and clubs of Havana. 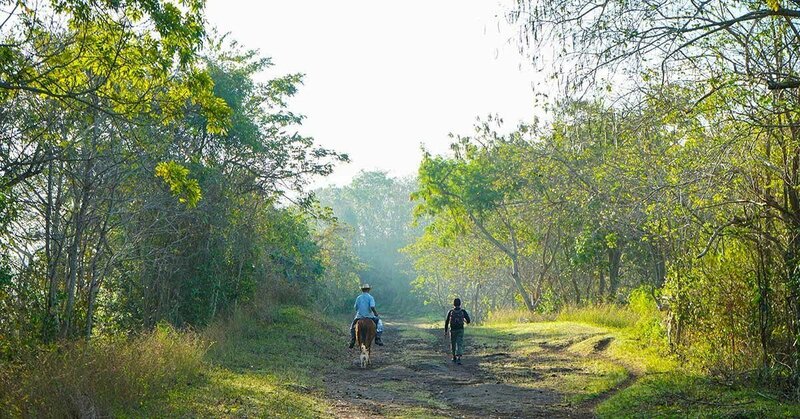 Instead you’ll walk woodland/jungle trails and remote rural roads often times accompanied by campesinos on foot or horseback as they go between small villages and the farms they work. 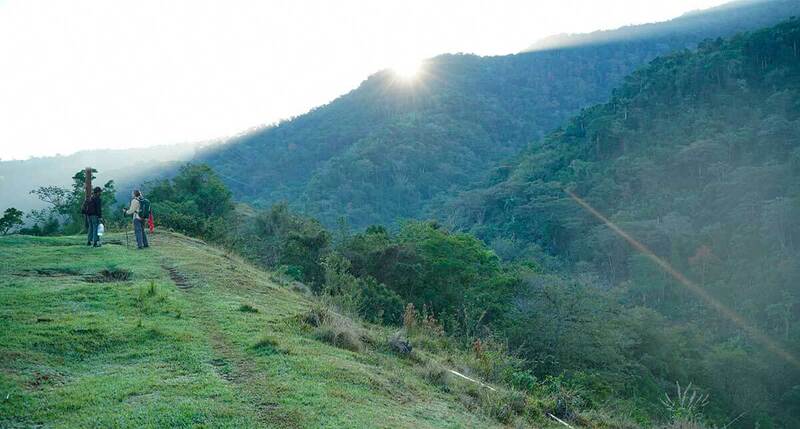 Finally, you’ll climb through coffee plantations, cross mountain streams and walk through small villages into the refreshing cool air of the Sierra Maestra Mountains. On one side, you’ll have views across the Caribbean Sea and on the other, the vast expanse of Cuba stretching northward to the horizon. La Ruta de la Revolución (red rectangle) is located in a remote part of Cuba seldom visited by tourists. It goes through two huge National Parks comprising most of Cuba’s southernmost coast. 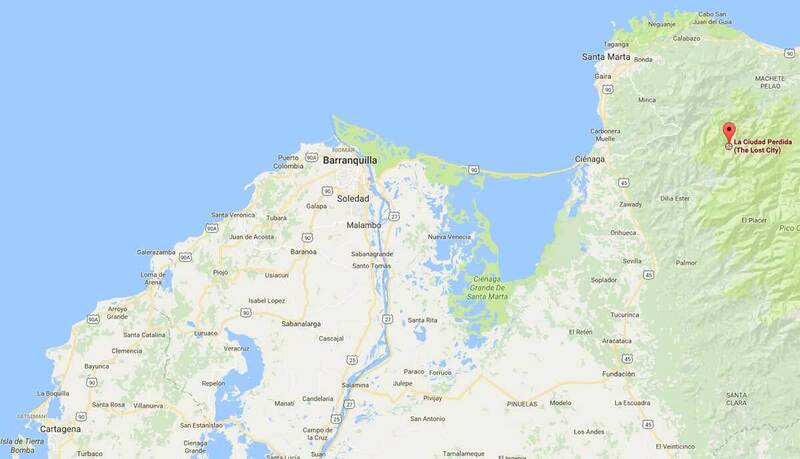 [click on map to enlarge] La Ruta de la Revolución (BLUE line) starts in far western Granma Province in the small coastal village of Playa de Las Coloradas. It is here that Fidel Castro’s boat the Granma landed in 1956. The Ruta follows through Parque Nacional Desembarco del Granma – a UNESCO World Heritage Site. It then climbs into the vast Gran Parque Nacional Sierra Maestra, home to the highest mountains in Cuba and ends at Fidel Castro’s Comandancia de La Plata hideout. Distance ~150 kilometers on a combination of trails and rural roads. 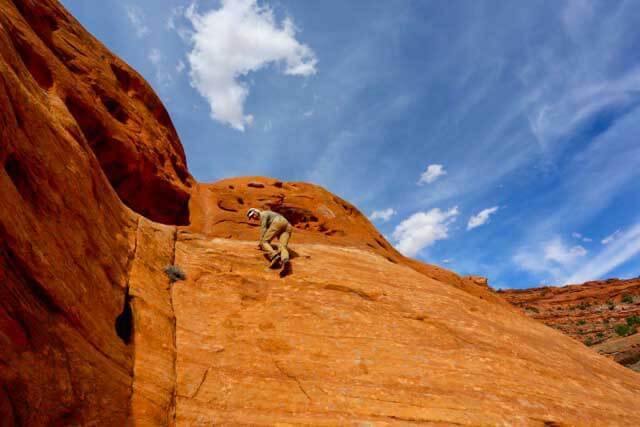 Physical intensity You need moderate hiking fitness. The first half is mostly rolling terrain—rural roads and farm trails. At times it can be hot and humid with full sun (you are hiking in the Caribbean). The second half is cooler but on steeper mountain roads, ending up on very steep mountain trails. Gear Travel light! This is a List of the Gear that worked well for us. Given the warm climate and that you’re not carrying food, you might even get by with a daypack or just about any 20 to 30 liter pack you have, e.g. REI Co-op Flash 22 Pack. Alison a Sony a6000 with a 18-105 f/4 lens. See more about Selecting a Travel/Backpacking Camera here. Sleeping You’ll stay most nights with campesino families. This will mean a rural home with very basic facilities—but lovely families and people! See more in our Detailed Section on Sleeping. Food There are essentially no stores, and only a few meager “restaurants” along the route. Mostly you’ll eat whatever the local people cook for you in their homes. See more in our Detailed Section on Food. Water We chemically treated all water on the trip. We like these simple and effective Katadyn or Portable Aqua treatment tablets—best travel water treatment going! See more in our Detailed Section on Water. 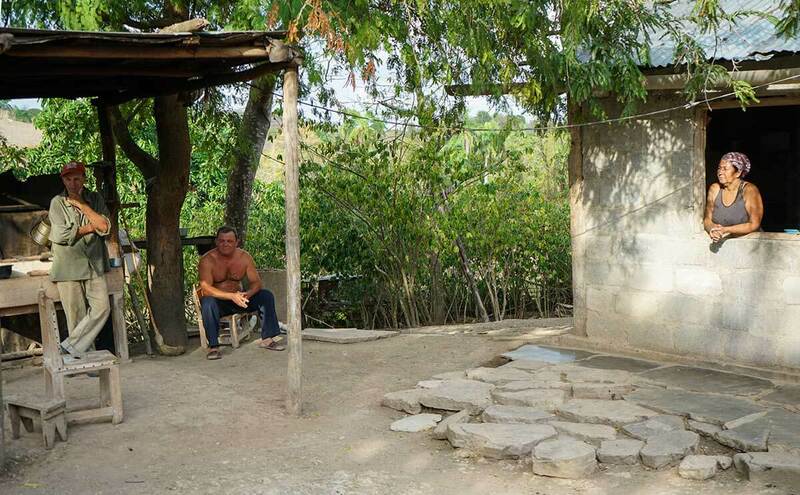 Rural Cuba is social. If people are going your direction, they will walk beside you and companionably chat. 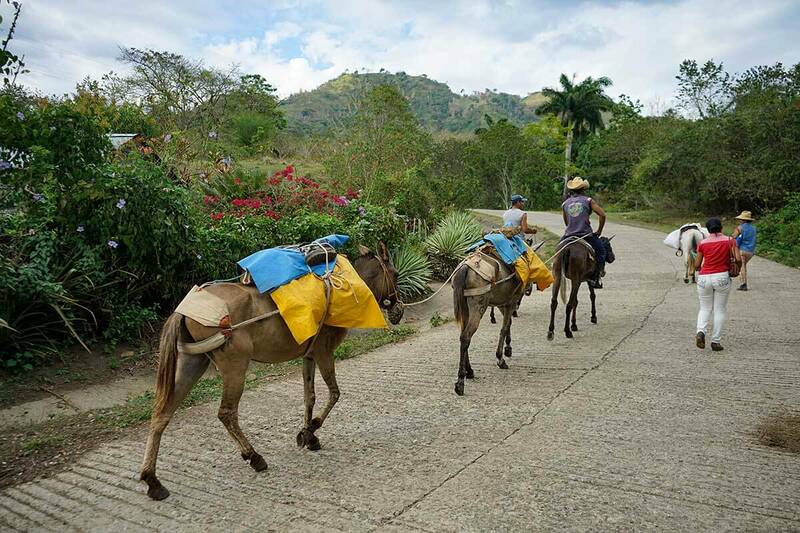 Along with locals we walked beside this mule team carrying coffee in the Sierra Maestra Mountains. Cost $1,280 USD for 2 people to do the trek in 8 days. Includes: transport from the airport to trek start, guiding, food and lodging along the route, and transport from the end of the trek back to the airport. Guiding Bayamo Travel Agent, based in Bayamo, Cuba offers the only guiding. 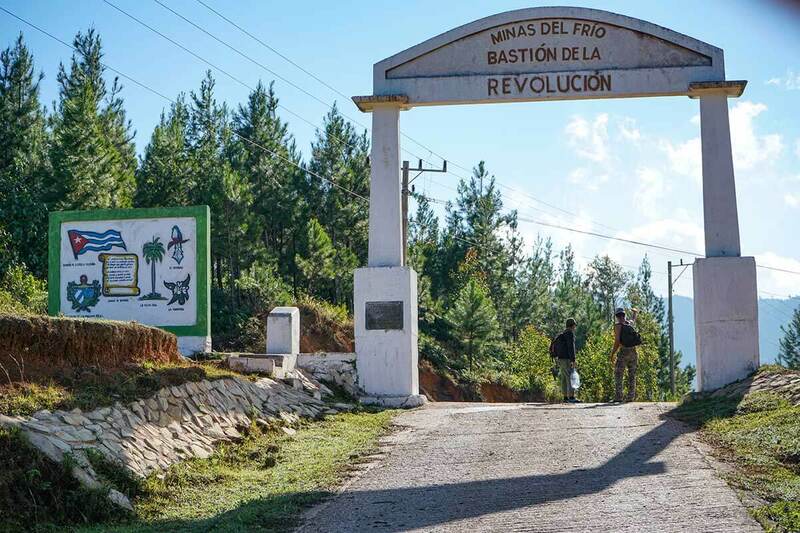 The Ruta de la Revolución Trek is not listed on their site. You will need to email them to make arrangements. 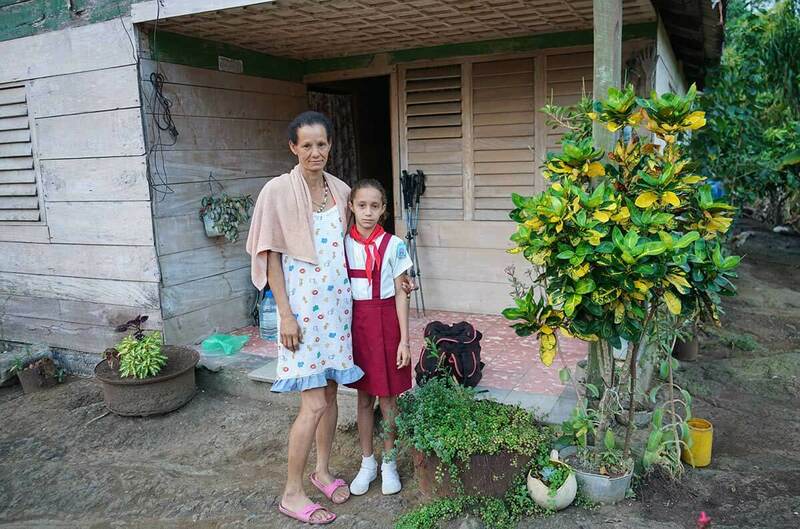 As of this writing, the only guiding language was Spanish, although Anley Rosales Benitez, the owner of Bayamo Travel speaks excellent English and could probably arrange for a translator. Getting there Its easiest and fastest to fly into the town of Holguin, Cuba. There are direct flights to the Holguin Airport (HOG) from the US. Your travel agent/driver will meet you there and transport you to the trip start. Flying into Bayamo would also be an option. Flying into Santiago de Cuba is your third option although it will take longer to get to the trek start. Trail to Che Guavara’s radio station (Radio Rebelde) the communications center for La Comendancia de la Plata. They would get warned by campesinsos when enemy planes were flying over the area and quickly pull the radio tower down. (Batista’s forces never found the Comendancia). Most villages along the route are very small. Just a few homes and some farm buildings. Option one, the first half is from Playa de Las Coloradas (in Desembarco del Granma) to the small village of Cinco Palmas. It was here that the revolutionaries re-grouped after being scattered into 27 separate groups after a disastrous first battle. 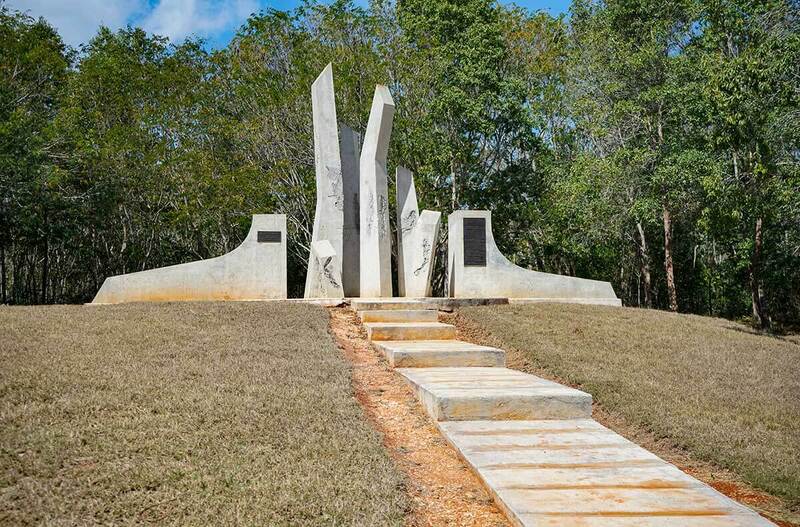 In Cinco Palmas, you’ll find a bronze statue of campesinos who helped the revolutionaries on their trek. Alternatively, option two, if you are interested in a cooler (though more hilly) trek, you can start in Cinco Palmas and hike to the Comandancia de la Plata (Fidel’s hideout). We picked up a horseback rider as we passed a small panadaria (bakery). He rode with us for a few miles, chatted, gave us directions and information about upcoming villages, and where to get food. The casa we stayed in the first night. It’s a typical rural village home— plain wood walls, a corrugated steel roof, and glassless windows. There’s a tiled floor main room in the front with 2-3 bedrooms partitioned off to the left. In the back is a dirt floored room (man standing in it) that serves as a kitchen and storage room. This was the only home we saw with a television. In most homes, electricity is just a few fluorescent bulbs used from 7 to 10 pm. An outhouse on the property will handle biological needs. There is no running water in the homes so you’ll bathe in an outdoor area with a barrel and a dipper. We found it glorious after a long hot, sweaty day of hiking. We hand-washed our clothes in a laundry tub and hung them up to dry overnight. Most homes have 3 generations and up to 10 people. This girl is sleeping on the floor of the main room as there isn’t a bedroom for her. 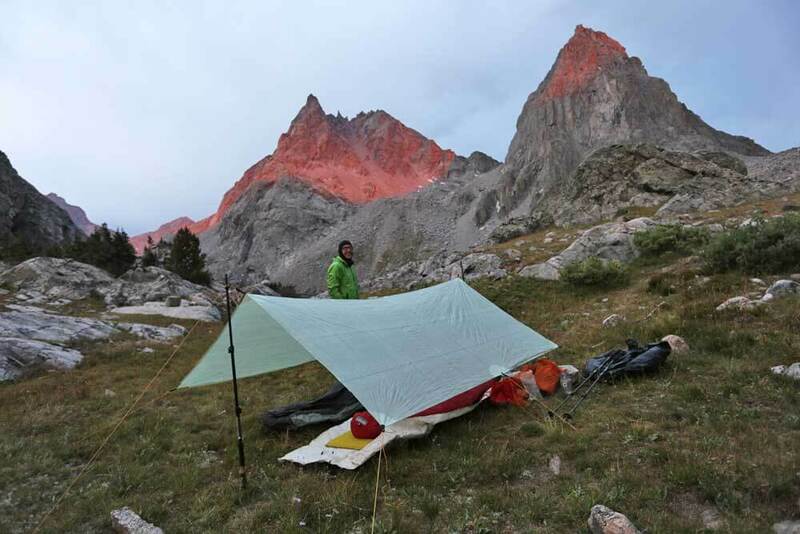 Until the route becomes more established with set/pre-arranged places to stay each night there is a small possibility you’ll sleep outside in a tent or hammock. 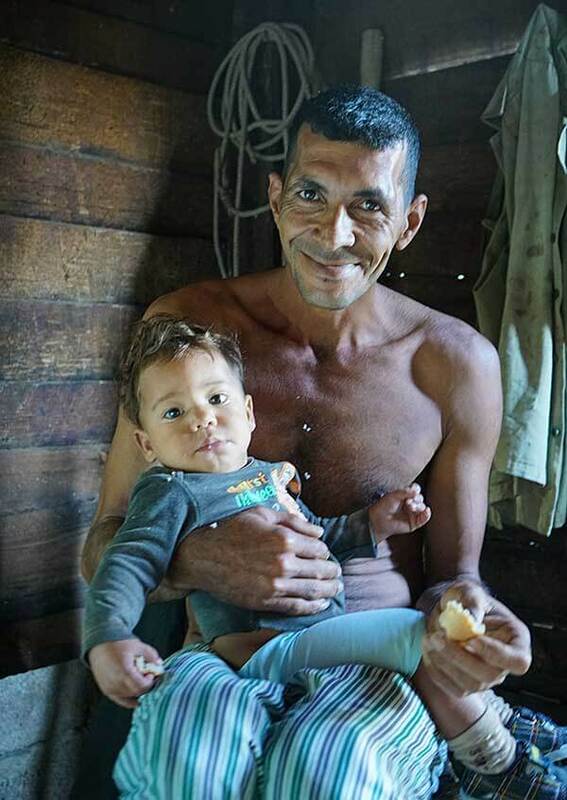 Either because you stop hiking for the day before you reach a suitable village, or because with three generations of people in their home there isn’t enough room for you to sleep. But you still will get dinner, breakfast and to bathe. We brought our own hammocks, but most people will likely be more comfortable with a a light backpacking see the List of the Gear we took. Every home we stayed at kept, goats, chickens, and pigs. 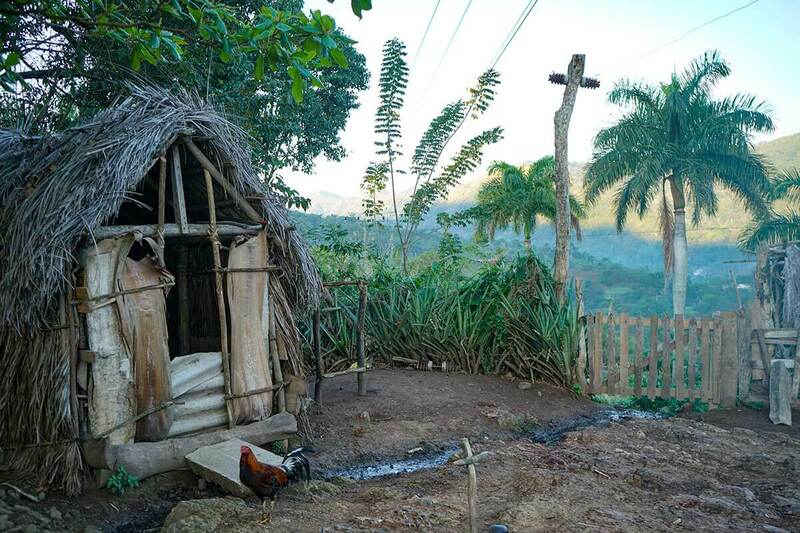 This casa at the base of the Sierra Maestra Mountains was the only place we stayed that had running water (piped from a mountain stream, see cistern in front). We shared a 5 liter bottle of treated water (left in photo) that would last us about 1/2 day until we had to refill it and chemically treat water again. 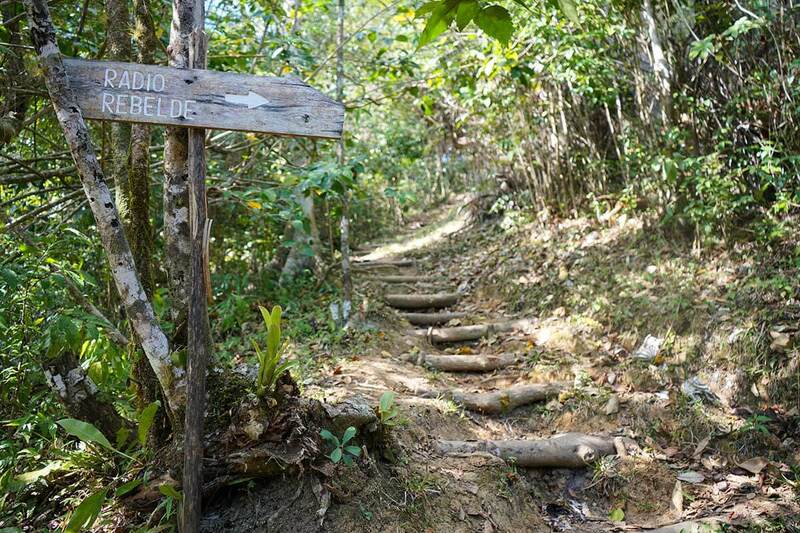 Picture is the start of the trek through the wooded trails of Desembarco del Granma National Park, a UNESCO World Heritage site. This is one of the longest sections of the trek without water. It’s also one of the hottest sections. As of this writing, buying your own food along the route is not an option. There are essentially no stores, no towns and only a few meager “restaurants” along the route. You’ll eat whatever the local people cook for you in their homes. We had two meat dinners and one vegetarian dinner, based entirely on what our hosts had in their homes the day we arrived (unannounced and unplanned). We always ate a big dinner, and had some bread/butter for breakfast. For us, lunch was a catch as catch can. (But you should request with your travel agent/guide what meals you want.) Your final option, although a heavy one, is to buy food in a grocery store in Cuba before the trip and carry it with you. We did not do this, rather we carried about 5 energy bars each. This was the only bodega (small store) we saw on the route. It’s few goods are artfully arranged on the shelves to semi-disguise the reality that there’s little inventory. There’s no refrigeration and no perishable food. [That’s a working scale on the counter since most stuff rice, beans, sugar etc. are all weighed and sold in bulk.] There was nothing we wanted. 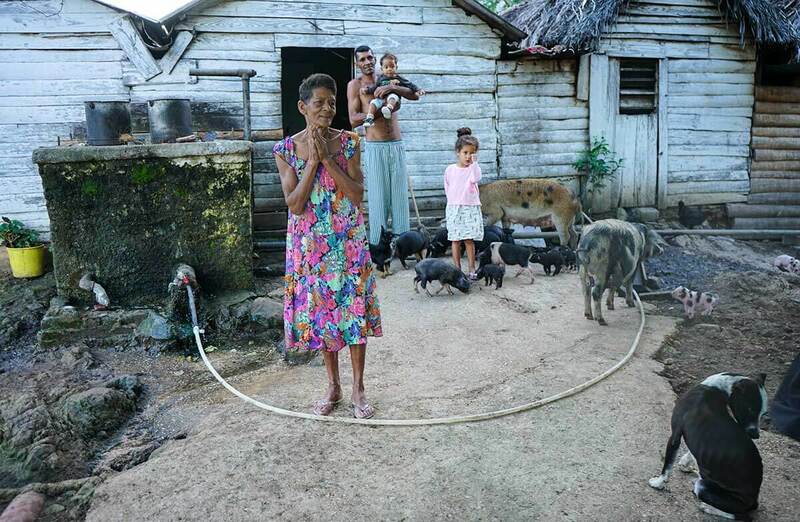 This route is in rural Cuba with lots of farm animals living around every home. We chemically treated all water on the trip. The “best” water you find (if not all) will be trucked into the village. With the number of farm animals everywhere, we stayed away from water in the streams. And in the hot weather, during the dry season, many streams may not be running. We also carefully treated all our water and ended up carrying more than we would of liked. Don’t assume water will be plentiful while hiking. This route is usually hot and water sources are far apart so you’ll carry a fair amount of water. We shared a 5 liter bottle of treated water that lasted us about 1/2 day until we had to refill it and chemically treat water again. 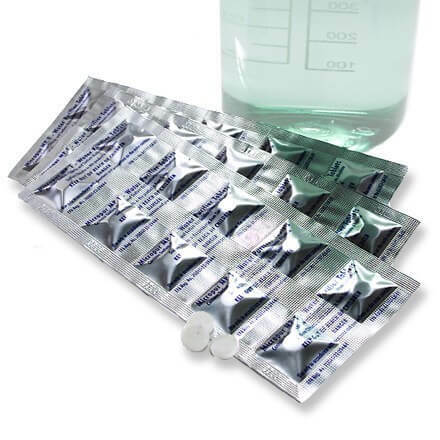 We like these fast, simple and effective Katadyn or Portable Aqua treatment tablets. You can also use these Aquamira Water Treatment Drops which are more economical but a bit more fussy to use. 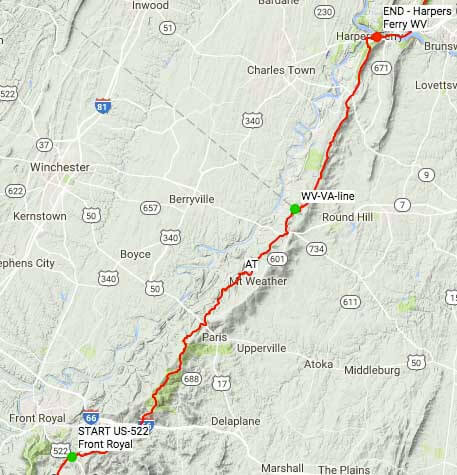 Be sure to soak up all the history on this route. Every day has points of the interest from Fidel, Che and the revolutionaries long and dangerous trek to their final mountain retreat. So keep an eye out for markers, monuments, plaques, etc. We saw cleared farm areas (makeshift camp sites for the fighters), markers for various events and battles, and even Che’s command center in Minas Frias. Our guide was great at pointing these out to us and explaining as we went along. 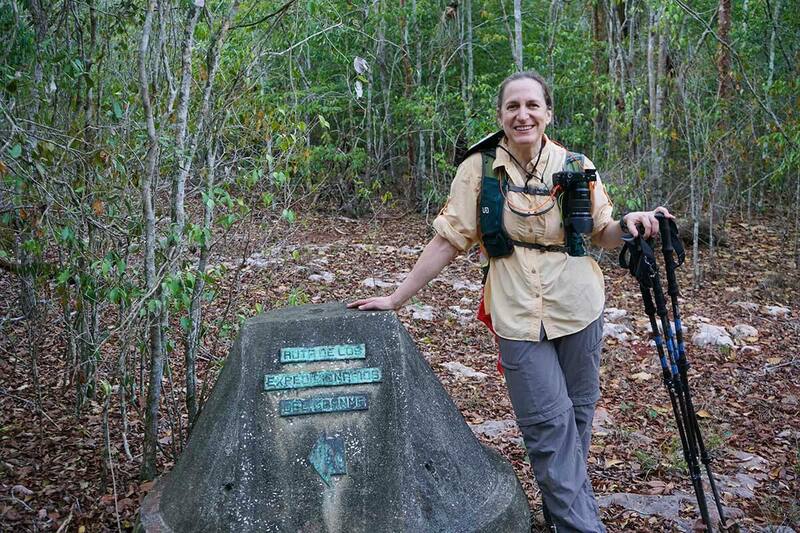 By the end of our trek, we found that we knew more about this historic trek than most Cubans. 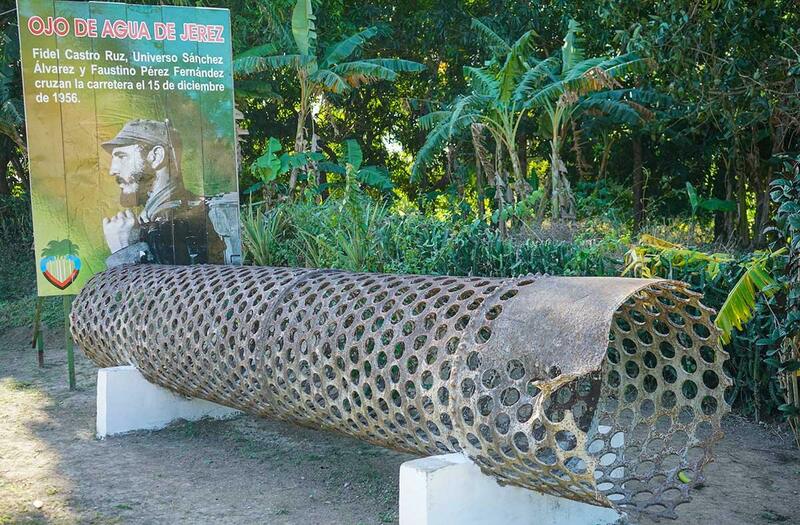 There are some strange historical markers/sites like this preserved section of a culvert marking the place where Fidel Castro crossed under a road to go undetected by Batista’s forces! You’ll also walk though farmland and small villages, some with historical context, but all worth exploring. For us, the highlight was visiting and staying with the campesinos (rural farmworkers). We saw a way of life from almost hundred years ago in the U.S. They still use ox carts! 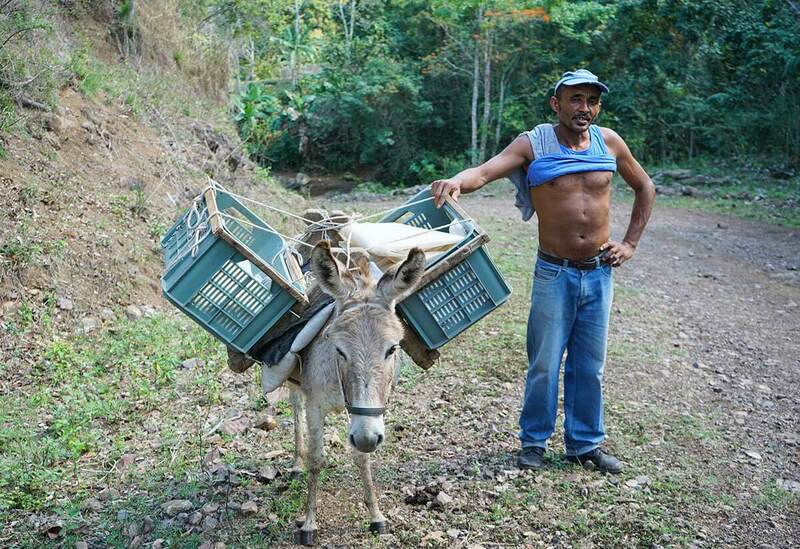 Coffee is still carried from the mountains by mule. The first half of the Ruta de la Revolución is mostly flat. It can be hot and humid as you have yet to climb into the cooler mountains. The trek starts by walking the length of Parque Nacional Desembarco del Granma – a UNESCO World Heritage Site, a unique coastal karst (limestone) habitat. Much of the trail is lined by trees and there are numerous markers explaining the historical events that occurred the first three days of the revolutionaries trek. The first half of the trek ends in Cinco Palmas where it is possible to take a road out. The small village of Cinco Palmas is where the remaining revolutionaries re-grouped after their disastrous first battle scattered them into 27 separate groups. Here you’ll find a bronze statue of the local campesinos who helped the revolutionaries. The gate into Minas del Frio. This where Che Guevara had his secret command/training center during the revolution. Now it’s a mostly decommissioned military base deep in the Sierra Maestra Mountains. At this point, we are getting near la Comandancia de la Plata and our guide is asking military personnel about directions. After Cinco Palmas the trek gets hillier but also a bit cooler. Expect plenty of ascending and descending each day. 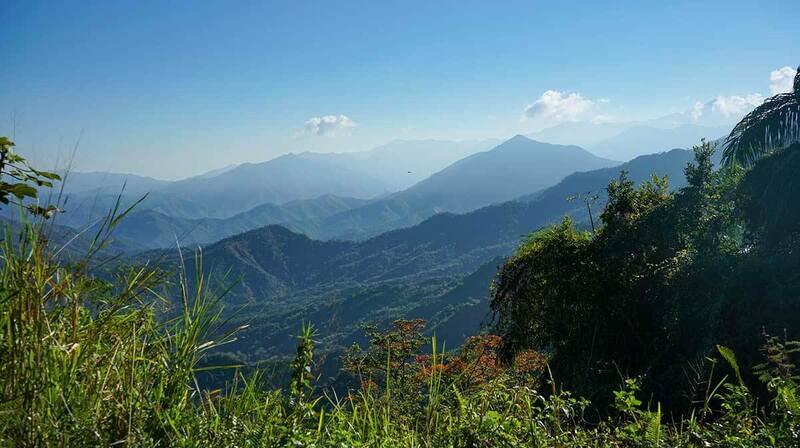 You’ll climb through coffee plantations, cross mountain streams and go through small villages up into the refreshing cool air of the Sierra Maestra Mountains. On one side, you’ll have views across the Caribbean Sea and the other, the vast expanse of Cuba stretching northward to the horizon. On your last day, you’ll culminate at the Comandancia de la Plata. The only way to get there is literally trekking through the jungle just like Fidel and the revolutionaries. Our last day on the trek had 3000 m (10,000 ft) of elevation change! 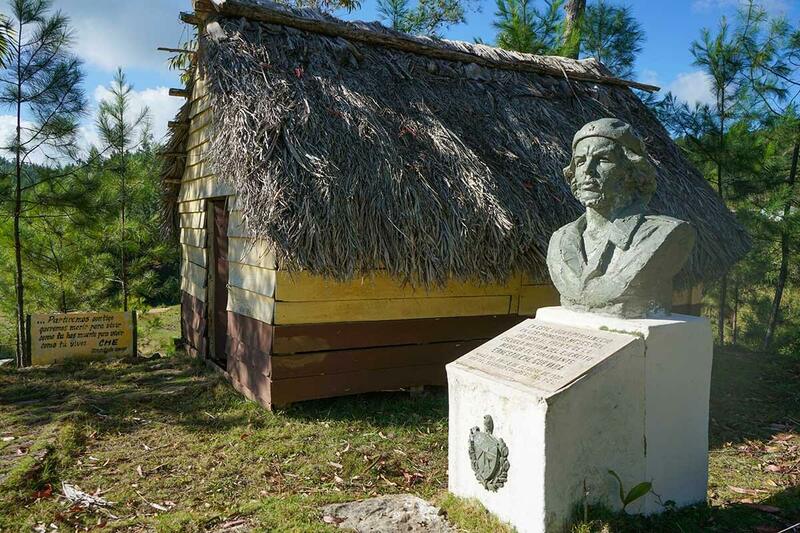 Fidel Castro’s house in la Comandancia de la Plata (mountain hideaway and command center). Note: Playa Los Coloradas is worth a day to explore before your trip. 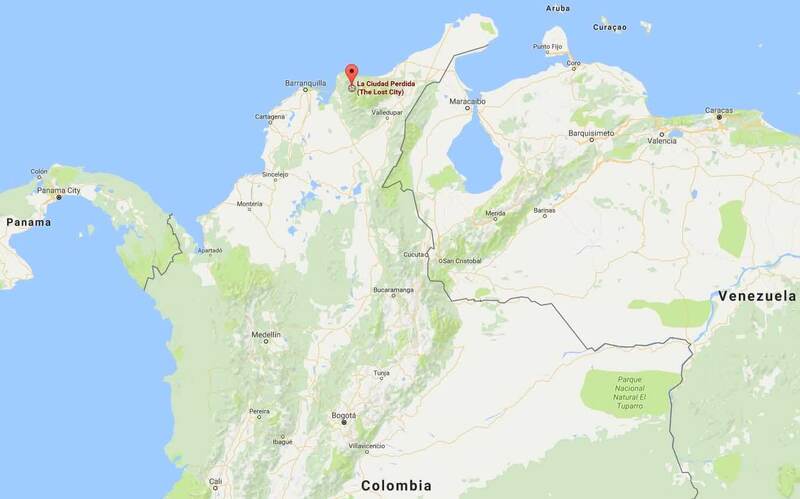 The Desembarco del Granma National Park, is a UNESCO World Heritage site and worth investigating for it’s unique ecosystem, its hiking trails, and even a few archeological sites. There is also the Desembarco del Granma museum which has a full-sized replica of the Granma, the boat that carried 82 revolutionaries from Mexico to Cuba (the original boat is in Havana). There’s even a walkway through the mangroves to the very place the Granma ran aground. In our usual “get ‘er done in a hurry” style, we had only allowed 4, possibly 5 days to do the trek. Since the trek hadn’t been done in years, and the last person to do it took 8 days, we were unsure that we’d get done in time. We were even sure if we be able to follow the path correctly. As such we were in “hair on fire” mode from the get go. Most sane people will take longer to do the trek. Among other things you’ll want more time to visit with people along the way, explore the small farms and villages, enjoy the views and take lots of photographs. Note: Our route description is for the 4 days it took us to do the route. Most trekkers will want to take 6-8 day to fully enjoy the Ruta. We had a 5:00 start in the dark to 1) get as many miles we could for the day, and 2) to get the most hiking time in the cool of the morning. Day one is filled with Ruta markers highlighting various points of interest along the first three days of the rebels march inland. The trek begins at Playa Los Coloradas, the beach where Fidel and his revolutionaries landed in Cuba. The boat, the Granma was a US built boat that sailed from Mexico. It was designed to carry 20 men but had 82. As such it was very slow, arriving two days late, and was at risk of sinking by the time it reached the Cuban shore. One of the may concrete route markers and explanatory plaques along the first 18 km of the route. 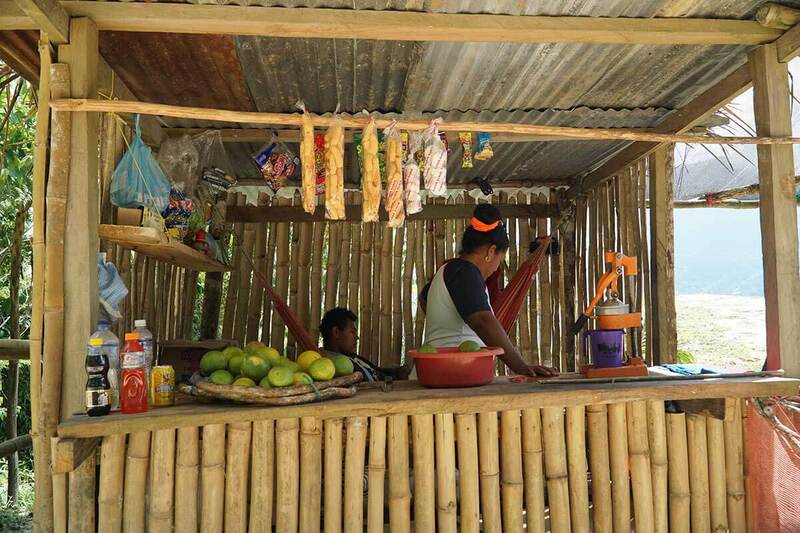 We saw children eating helado (frozen treats on a sugar-cane stick) and followed it to the source. This woman on the right had a chest freezer and was running a small side business making popsicles in the bottoms of soda cans using sugar cane syrup. Day two begins with some rollers and by mid morning you are walking roads. You pass by the small town of Manteca pretty quickly, and just the other side is another camp where Fidel and the revolutionaries stayed (so you know you are still on the Ruta). An open air dance hall the morning after Saturday night’s fiesta. The small “Cafeteria” had only strong alcohol and no food. We managed to find Bucanero Maltas, a sweet non-alcoholic carbonated beverage flavored with malt. It was just OK, but something cold! the extra hydration was welcome. Continuing on, you acquire a fairly major carretera (road) and walk it until the cut off to Cinco Palmas. Along the major road is a marker where Fidel crossed the road (see photo earlier in post). The afternoon of the second day we arrived at the small village of Cinco Palmas. It was here that the revolutionaries finally managed to re-group after being scattered into 27 separate groups after a disastrous first battle at Alegria Del Pio. In Cinco Palmas, you’ll find a bronze statue of campesinos who helped the revolutionaries on their trek. From here on the hiking gets progressively hillier and steeper for the rest of the Ruta. 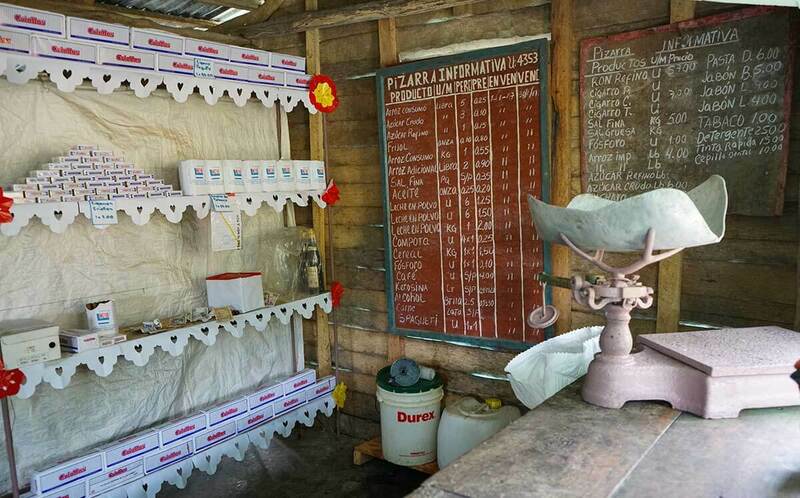 Coffee plantations start as soon after you leave Cinco Palmas. Keep an eye out for coffee beans carried by mule, drying plants, and seedling coffee plants on the side of the road waiting to be planted. Mother and daughter of our host family the second nite. Daughter is in her school uniform and ready to head out on mule, to her school. Day 3 started out with rolling hills, then flattened out a bit until hitting a huge hill. In 1980, the government paved the road on this hill because it was so steep that trucks frequently flipped over on it. It is a stiff climb up to the top at 850 meters. 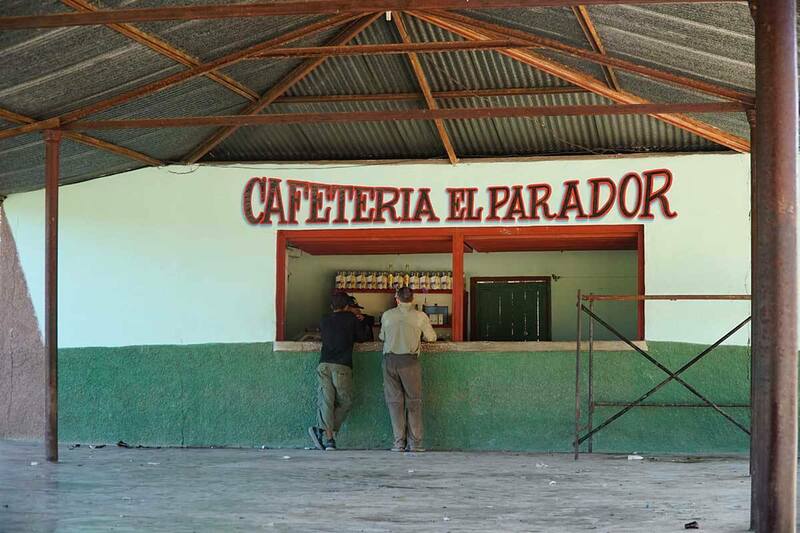 A panadaria (bakery) in the middle of nowhere. It’s where our host father of the night before worked. This is where we picked up the horseback rider as a walking companion. Fidel’s Comandancia de la Plata is somewhere out there in the distance. One of our first views of the heart of the Sierra Maestra Mountains. This was the largest building we saw on the trek. It is the only building at the center of one of the largest towns—on a dirt road of course. It houses a pharmacy and a mini-restaurant. The patriotic slogan, “yo soy la revolución,” means I am the revolution. We chatted with these two young men for a bit but didn’t ask what was in the bottle (but had a good guess). We stayed the night in the foothills of the Sierra Maestra in preparation for making the final ascent the next day into Fidel Castro’s Comandancia de La Plata hideout. View from the front yard of our casa on day 3. Complete with rooster and jury-rigged electrical pole. The father of the family we stayed with feeding his son small pieces of bread between his fingertips. Our Day 4 started out with a steep climb to la Comandancia de la Plata via Minas Frias. It’s an unrelenting climb up into to la Comandancia de la Plata. Our total elevation change for the day was 3000 meters or around 10,000 feet. Sunrise starts climbing over the Sierra Maestra Mountains. The historic Comandancia of Che Guevara is in Minas del Frio (Minas Frias). It was here he organized rebels while Fidel was in the nearby Comandancia de la Plata. Now the area around Che’s Comandancia is mostly an abandoned military base. 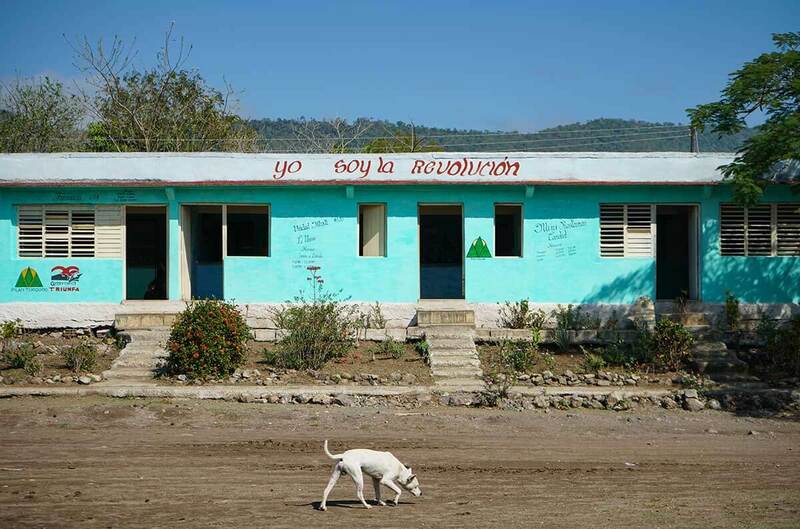 Every child in Cuba goes to school, even in remote rural villages. 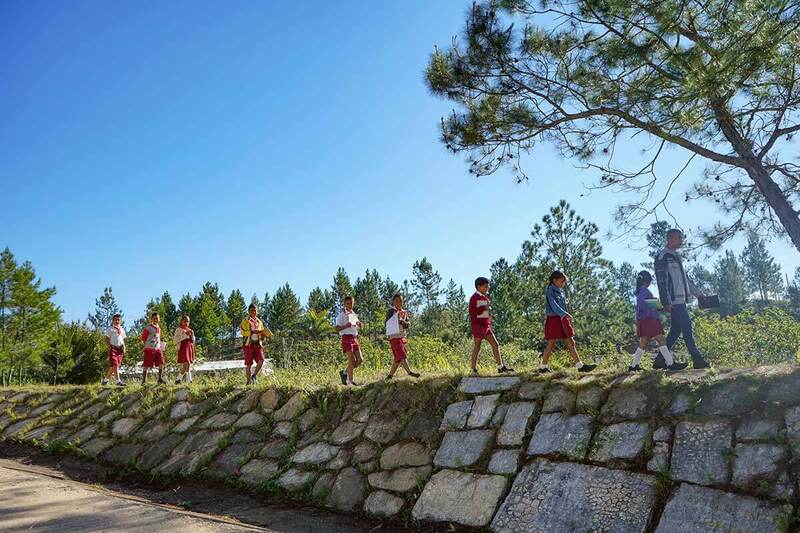 This group of students, are from a school in the Sierra Maestra Mountains, not too far from la Comandancia de la Plata. At some point the maze of small mountain trails confused even our guide (left in photo). We ended up getting a local campesino from a banana farm (right) to guide us through the mountains to la Comandancia de la Plata. Picture is in front of the old Hospital for the Comandancia, which is now under reconstruction. 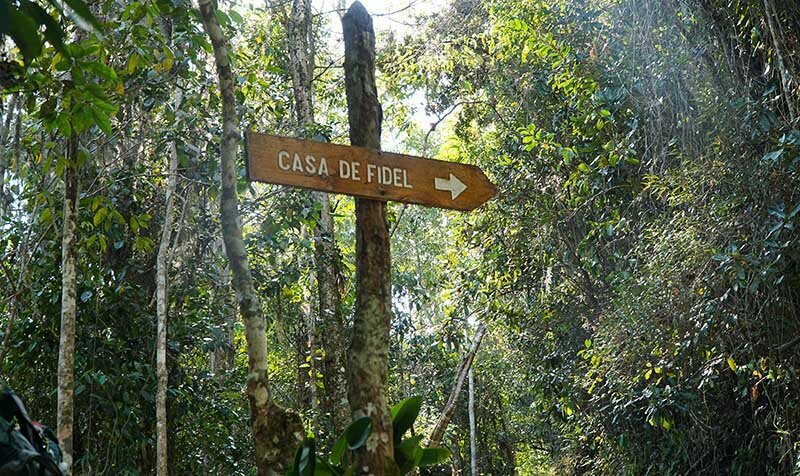 Signage near the La Comandancia de La Plata, Fidel Castro’s mountain command center. This is at the very end of our trek. But it’s what most tourists see getting out of their 4WD vehicle to hike the short 3k to La Comandancia. Having not trekked the 150 km Ruta from the coast, they miss much of the context of the Comandancia de la Plata. The height of luxury. 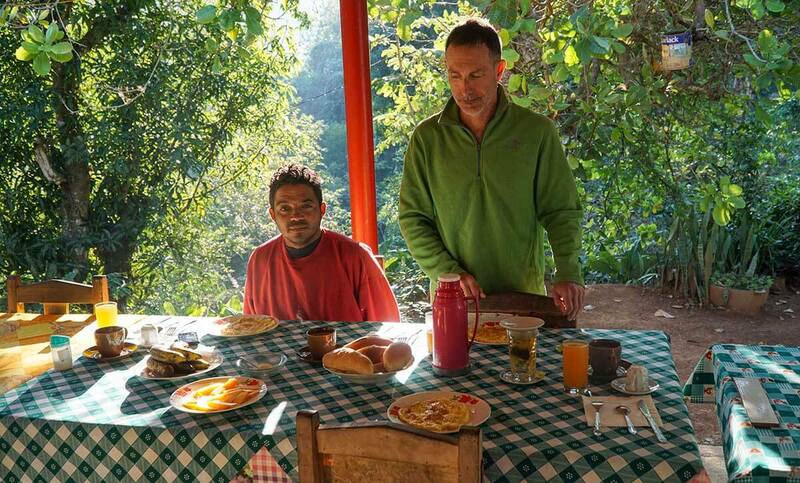 Breakfast at our casa particular (bed and breakfast) in Santo Domingo at the end of the trek. As of this writing, stand-alone GPS units (SPOT and inReach included) and Satellite Phones were not allowed into Cuba. To confirm, Cuban customs did indeed check our luggage with X-ray machines and also asked us if we were bringing a GPS into the Country. Be forewarned. Strangely, cell-phones with a working GPS are fine. Go figure! Our US cell phones don’t work in rural Cuba (but this may change in the future). But your guide’s cell phone will likely work on some sections of the Ruta. In the bigger towns in Cuba, you can buy Internet cards. On the trek, you will not have this option. We were able to recharge our cell phones at two out of the three houses we stayed in. Electricity will be scarce so don’t expect every house to have it. US debit or credit cards don’t work with Cuban ATMs. So for US Citizens, this is a cash-only country. US dollars will cost an extra 10% to exchange so Euros, Canadian Dollars, British Pounds or any other currency is recommended. That said, you can change US dollars if needed. CUBAN VISA: US Citizens need a Cuban visa to get into Cuba. We went thru the Miami airport. 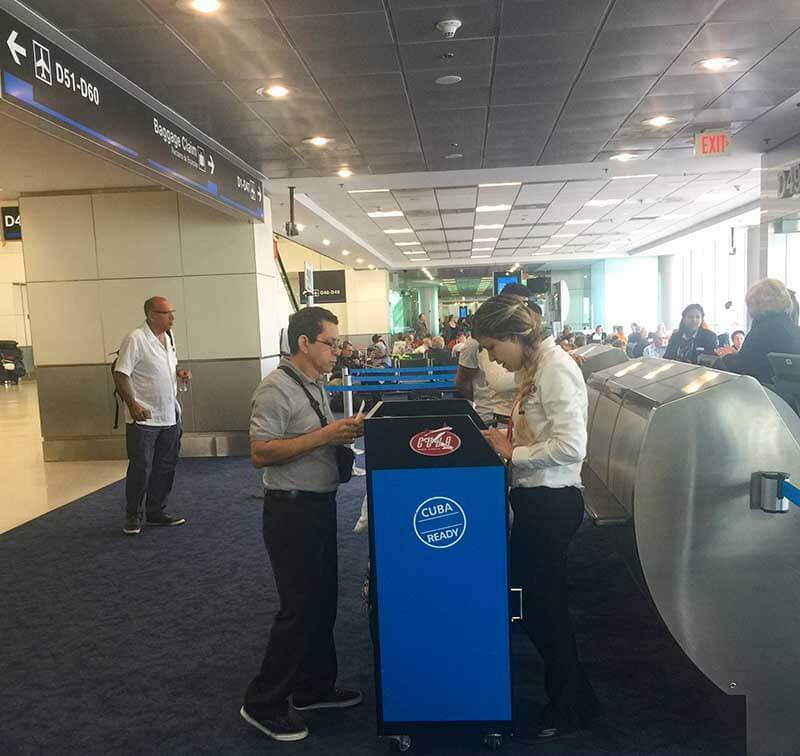 At the boarding gate in Miami, a kiosk sold Cuban visas good for one visit, for $100/person. We assume this is the same at other airports in the US. Alternatively, you can get a visa through the Cuban consulate. It costs only $50/person however: you will need a passport photo, you’ll fill out forms, provide a copy of your passport and must hand it all to them in person (I provided all the same for my spouse, but it cost $75 since they weren’t there in person with me). A week later, you return to pick up your visa. The $100 airport visa is a much better deal. US CATEGORIES (not really a visa): The US government has several categories of reasons allowing you to go to Cuba. The reason that people have started to go now is that in March, 2016, the US Gov’t added the category of “people-to-people” to their list. You can go to the State Department website to read more about what this means (https://travel.state.gov/content/passports/en/country/cuba.html) see “support for the Cuban people”. As long as you fall into one of these categories, you do not need a visa from the US to travel (but will still need a Cuban visa). We carried our itinerary with us upon returning to the US to prove we spent time with Cuban people, but were not asked for it or anything else at US customs. Remember, you are in a very rural area. As such, we saw virtually no cars on the trek. Almost all transport is either by foot or by horse/mule. There may be options to rent horses/mules along some sections, but that needs to be well organized beforehand. “Cuba Ready” kiosk at Miami Airport where you can get get a visa. 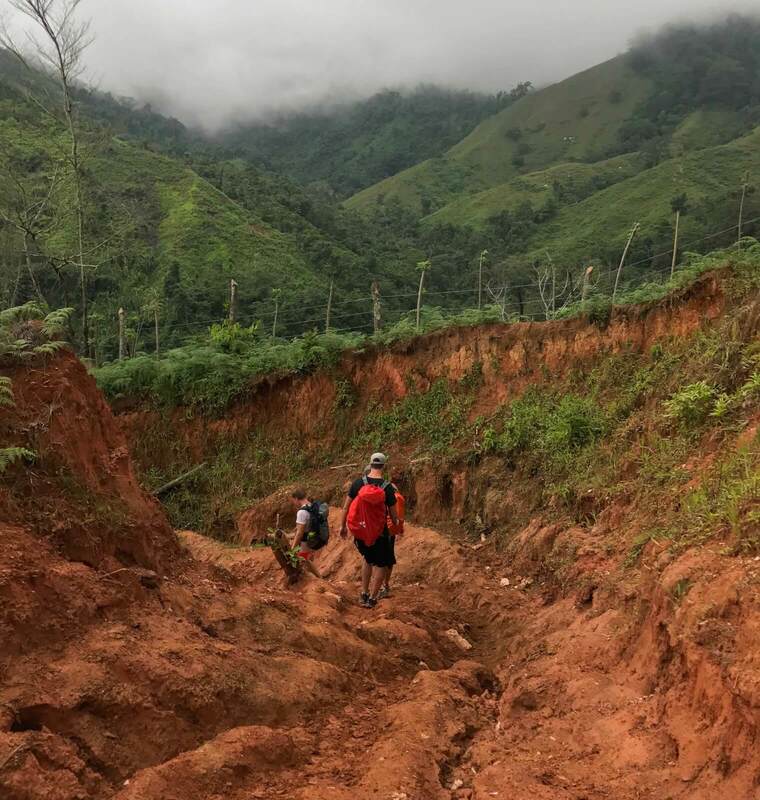 Note: this is a excerpt from our 9 Pound – Full Comfort – Lightweight Backpacking Gear List which we use for worldwide trekking, including our recent trek into the Jungles of Columbia to see La Cuidad Perdita (the Lost City). Depending on the time of year, temperatures on the Ruta can vary from the humid 80-90s °F with intense sun at lower elevations, to temperatures in the 40’s to 50’s°F on cool nights in the mountains. There is always a slight chance of rain even in the lowlands. The chance of rain increases when you get into the mountains as they have their own weather. Backpack for all your gear 30 to 40+ liter backpack Osprey Exos 48 Pack, ULAOhm 2.0 Pack great!, or Hyperlite Mountain Gear SW 2400. See Recommended Lightweight Backpacks for other choices. Quilt Fleece blanket or Sleeping Bag Only a light one is needed if at all. We didn’t use one. 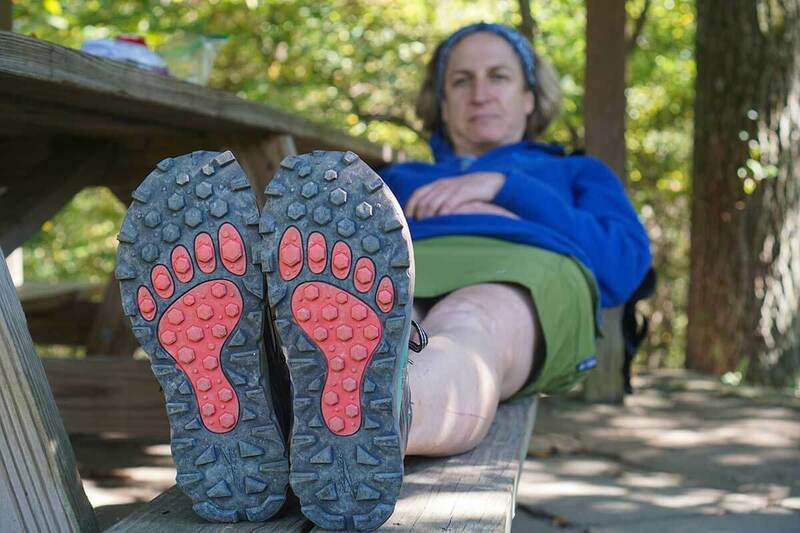 Ground Pad T-Rest NeoAir X-lite “Women’s” Perfect size for most. Warm. Super comfortable! Earplugs Foam Earplugs NRR 33 If sensitive to noise. Tight sleeping quarters. Headlamp Black Diamond Iota Weather sealed. Bright 150 lumens. Can be recharged in the field! E.g the EasyAcc battery pack. Reduce battery waste, and see better! Toilet paper In waterproof Ziplock bag TP not always at toilets in camp. Insect repell. Sawyer Picaridin for skin 0.5 oz pump is airline OK small, pocketable, and easily applied in field. Picardin also in lotion is the most effective on the market. 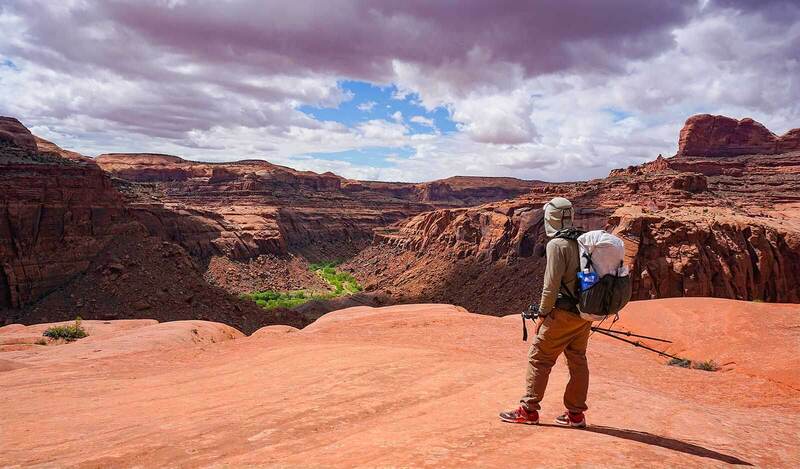 See our 9 Pound – Full Comfort – Lightweight Backpacking Gear List for a more complete list of gear. This is tropical Caribbean trekking with possible exposure to bug transmitted and water/food transmitted diseases. The CDC recommends visiting your travel doctor (ideally, 4-6 weeks) before your trip to get vaccines or medicines you may need. We got all our travel vaccines for water/food transmitted diseases. And we chemically treated all water along the route. We at well-cooked food as much as possible along the route. None of of us got sick. Note: this excerpted from a more detailed article. Best Ways to Protect Yourself Insect Diseases While Hiking some readers may want to investigate it in more detail. Shirt (alt) Exofficio Bugs Away Halo Long Sleeve Shirt Men’s and Women’s Also good, widely available via Amazon and other retailers like REI. Lifetime insect repellent. C Pants hiking* ExOfficio BugsAway Ziwa Pants Men’s and Women’s Available in both Men’s and Women’s. Light, cool, sun protection. Lifetime insect repellent. Pants (alt) RailRiders Men’s Eco-Mesh Pant with Insect Shield RailRiders pants have huge side vent on legs for cooling. Lifetime insect repellent. E G Bug repellent on face neck hands Sawyer Picaridin lotion 14 hrs! Pocketable Picaridin 0.5 oz spray Lasts 14 hrs! No odor. Won’t melt plastic. Small, pocketable, easily applied. F Physical Prot. 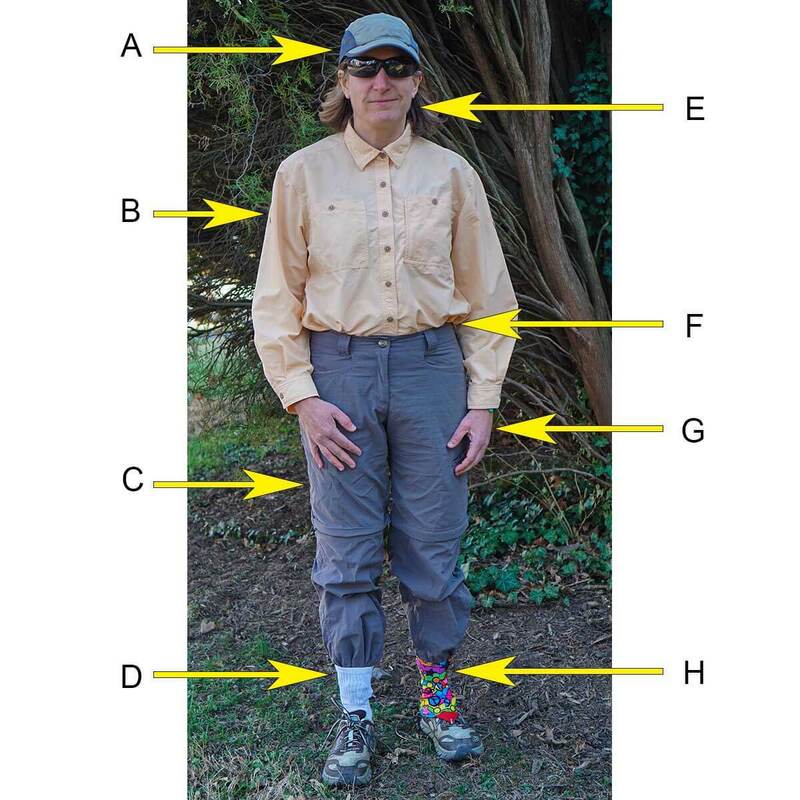 Tuck shirt into Pants Prevents tick entry into pants and lower shirt area. REI Co-op Activator Gaiters Seals pants against tick entry. No ankle gaps. 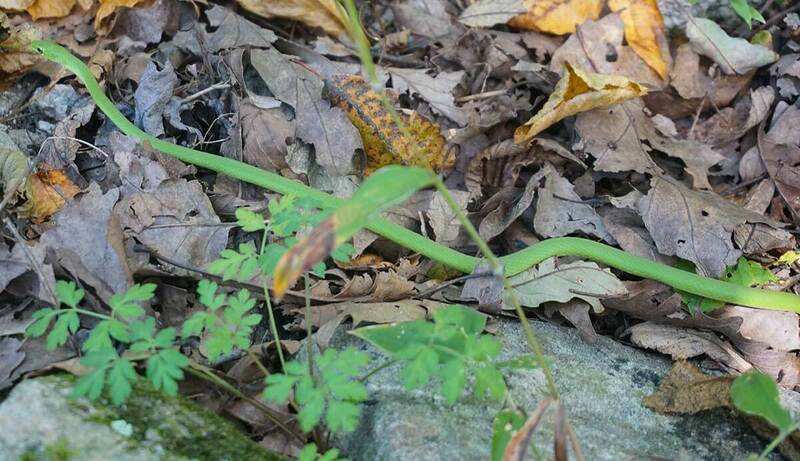 Can be treated with permethrin spray. Fleece shirt North Face TKA 100 1/4-Zip Light and compact travel garment. For warmth in camp at night and sleeping. Good pillow! Shoes hiking Lightweight trail running shoes Boots not desirable! Most non-Goretex trail running shoes that fit. You probably own a pair. (or Lone Peaks) Light. Huge toe room. Super comfortable! Shoes sugg. Inov-8 ROCLITE 295 (20oz) Light, sticky rubber, durable. * You can treat your own clothing with permethrin spray (Amazon) or REI. This lasts for up to 6 weeks or 6 washings. (For comparison: factory treated clothing is good for up to 70 washings, essentially “life-time” use). Both clothing treatments far exceed the 8-14 hours of skin applied repellents like Picaridin and DEET. And they don’t require the time/attention needed to properly apply repellents to large areas of skin each day. Note: We took two set of insect repellent pants and shirts — one pair exclusively for hiking, and one pair reserved for dry/camp use only. The reason is that hiking clothes will get wet with rain and/or sweat during the day and will not dry completely overnight. In the morning we just put on our damp hiking clothes (they will be dry in 30-60 minutes from your body heat), and put our dry camp clothes back in our packs. That way we always had nice clean clothes to change into after washing up. A courtesy to the families we stayed with! It’s like Machu Picchu, but remote and not overrun by tourists. 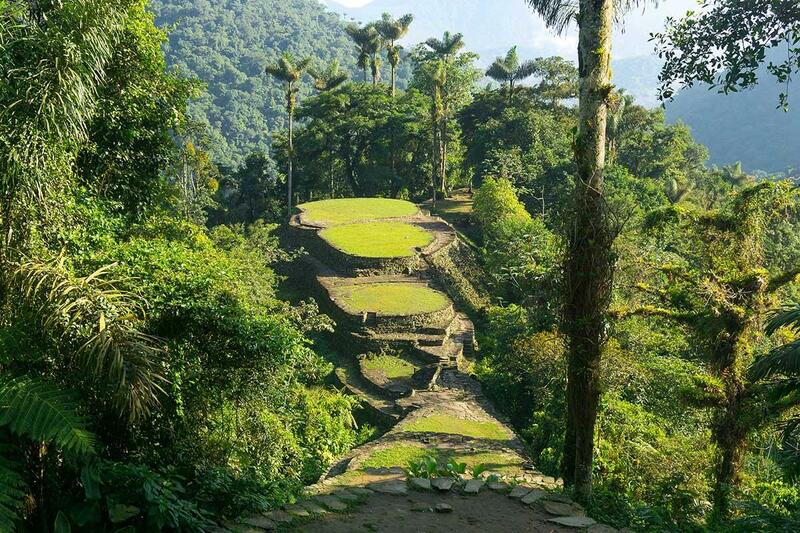 So definitely put La Ciudad Perdida (the Lost City) near the top of your travel list! La Ciudad Perdida is a vast, ancient city in the jungles of the Sierra Nevada mountains on Colombia’s Caribbean coast. It is believed to have been built by the Tairona culture around 800 CE, about 650 years earlier than Machu Picchu. Researchers estimate it housed between 2,000 to 8,000 people. 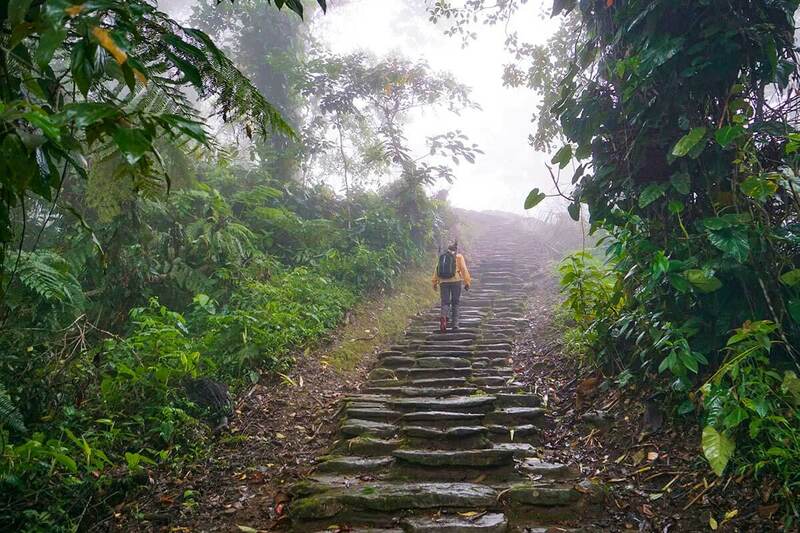 La Ciudad Perdida can only be accessed via a two-day trek on foot into the coastal jungle of Colombia. As such, it has nowhere near the crowds, and “touristy feel” of Machu Picchu. 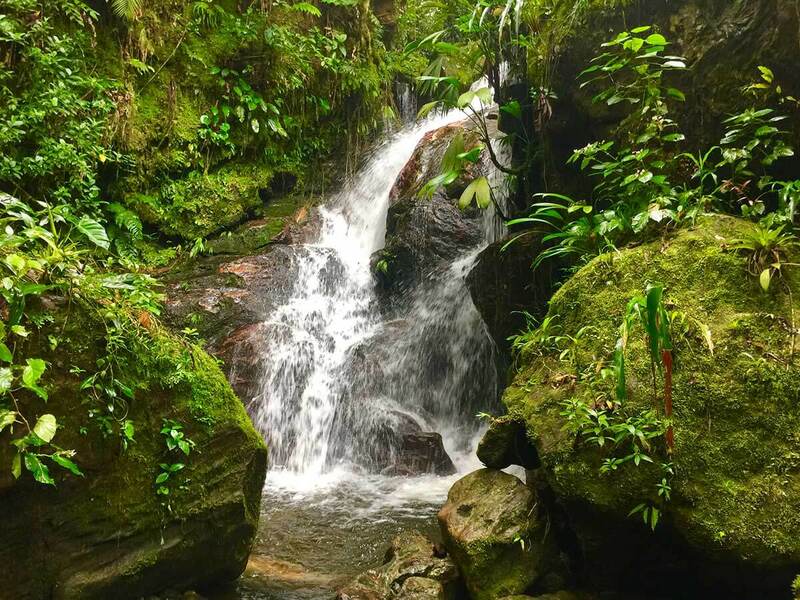 The following is a Guide to Colombia’s La Ciudad Perdida Trek, which has all the information to plan a successful and rewarding trip to this incredible site. Pictures with: Sony a6000 camera, Sony 10-18mm F4 OSS Lens & Sony 18-105mm f/4 G OSS Lens; iPhone 6+. 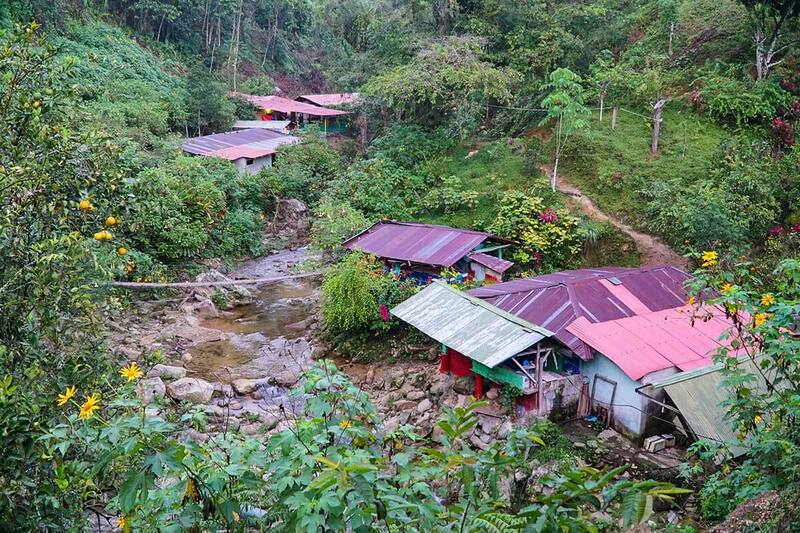 La Ciudad Perdida is on par with Machu Picchu, but without the mass of humanity. Alison and I were on the site for almost an hour before seeing another person. La Ciudad Perdida Trek is crazy cheap (only $230 USD for four days, food, accommodation, guiding and fees!) and faster/easier to access compared to Machu Picchu and the Inca Trail. And at only 1200 meters there are no altitude acclimatization issues. You are a guest in indigenous lands at their sacred site. You literally trek through indigenous villages and lands of the descendants who built and lived in the city. 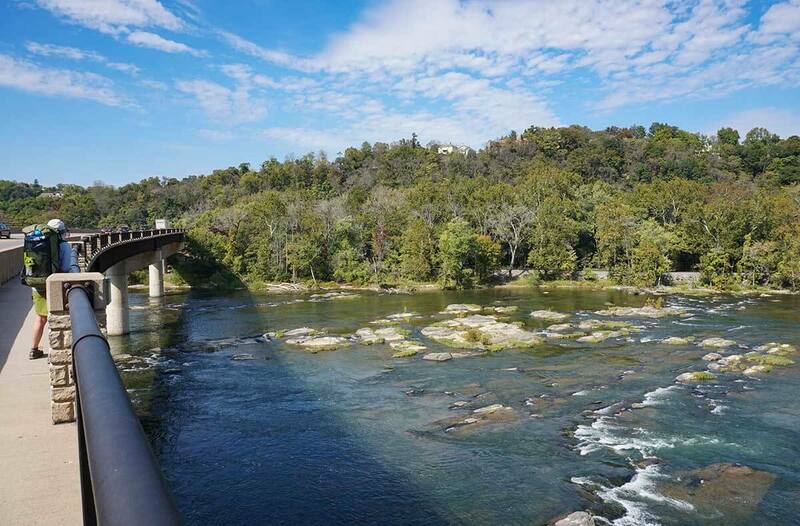 It’s far from an overrun tourist trap! The walk through the jungle is amazing— some of it is virgin jungle. We know of few multi-day treks in the jungle. Swimming in the cool jungle rivers was one of the trip highlights. A culturally sensitive eco tour. Our guiding company, Wiwa Tour is owned and operated by the Wiwa indigenous group, descendants of the Tairona who built the city. 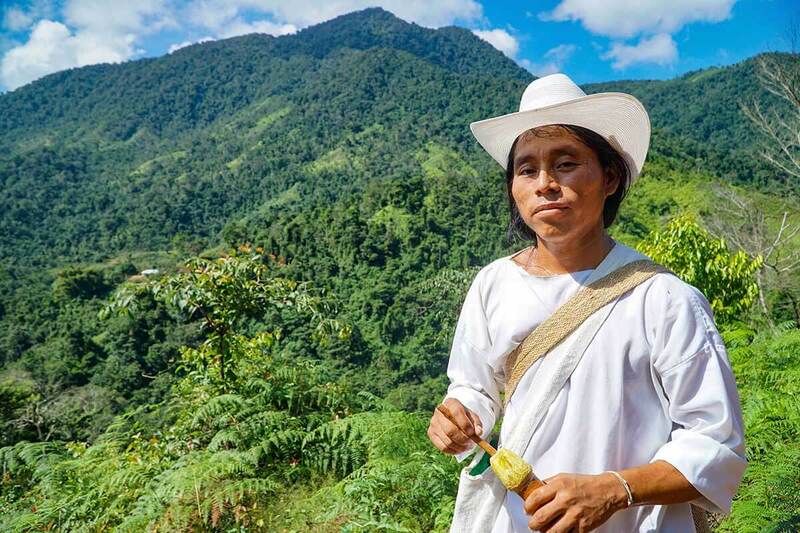 The Wiwa fought to protect the Ciudad Perdida historic site from mining and other commercial atrocities. 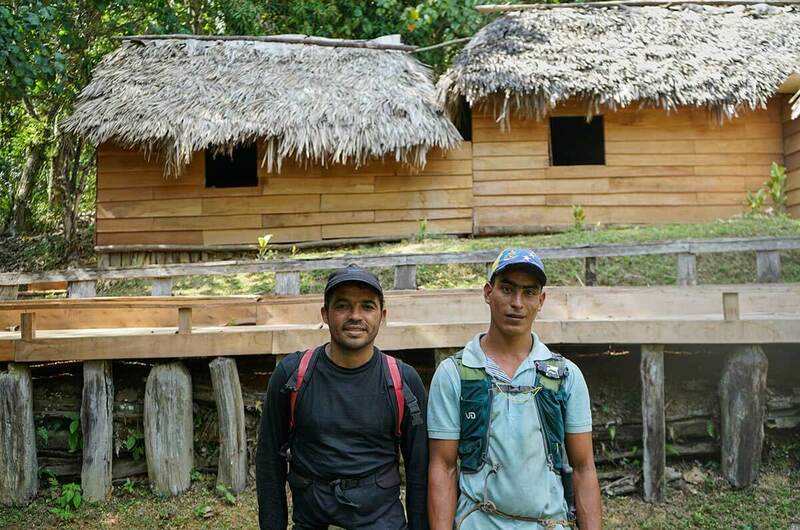 In other words, your tourists dollars go to indigenous guides who contribute to preserving and protecting the Ciudad Perdida historic site and its indigenous communities against climate impacts, vegetation loss, neglect, looting, and unsustainable tourism. Note that the “Lost” City of the Teyuna was never actually lost. Local indigenous groups, descendants of the Tairona who built the city knew of the city and traveled through it. It was only “lost” to the outside/non-native world. It was “found” in the early 1970s by local treasure hunters/looters and artifacts started showing up on the black market. Since then, there have been great efforts to preserve and protect the site. La Ciudad Perdida consists of a series of 169 terraces carved into the mountainside, a net of tiled roads and several small circular plazas. Archaeological work is still ongoing. Time to go: Colombia is equatorial so you can do this trek year-round. The best time is December to March which is the dry season and a few degrees cooler. Even so, afternoon rain is common in the mountains and should be expected. People from northern climates may appreciate taking a warm weather trip in the middle of winter. 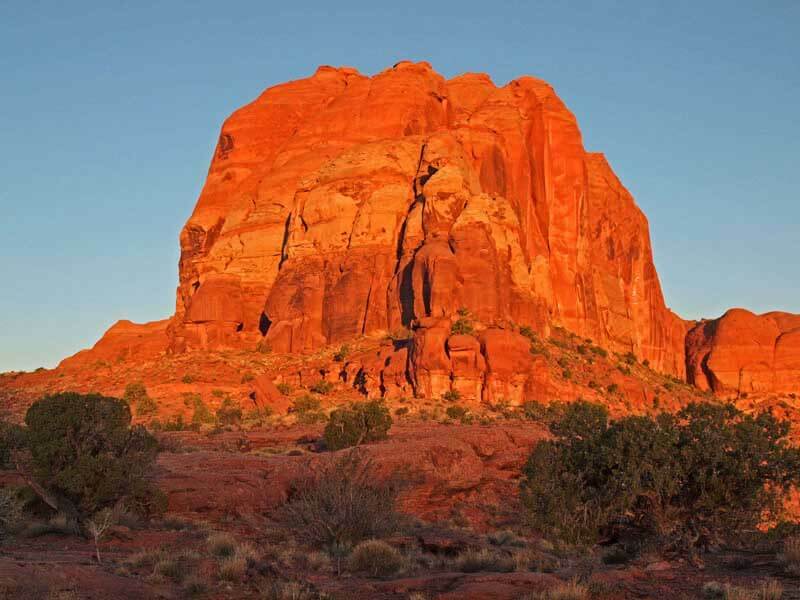 Guiding: You can only do the trek with a guiding company (remember: you are an invited guest into sacred tribal lands). 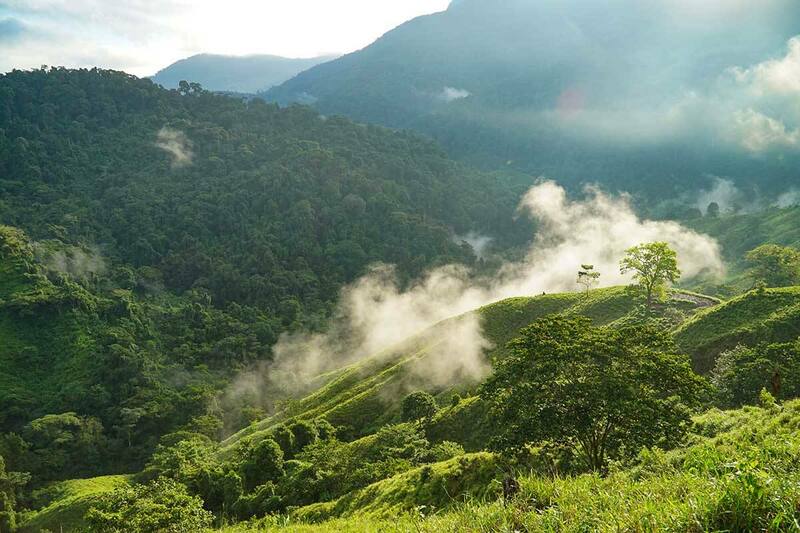 Climate: This is a hot and humid trek through tropical jungle, with all that it entails. 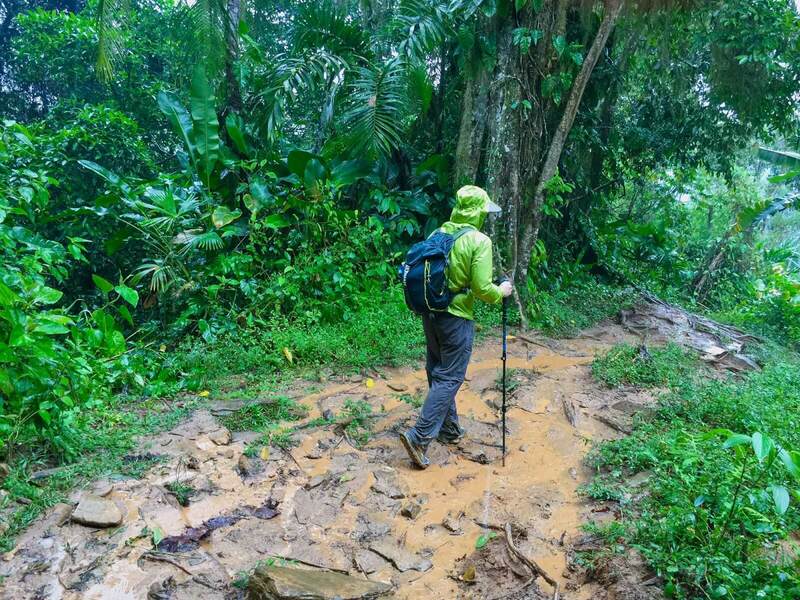 Difficulty: Moderate intensity hiking with some up and down on sometimes muddy/slippery jungle trails. Distance: About 44 km (28 miles) out and back, with 2,700 m (9,000 ft) of elevation gain and loss. Duration: The Trek is usually done in 4 days (a half-day, two full days, and a final half-day). 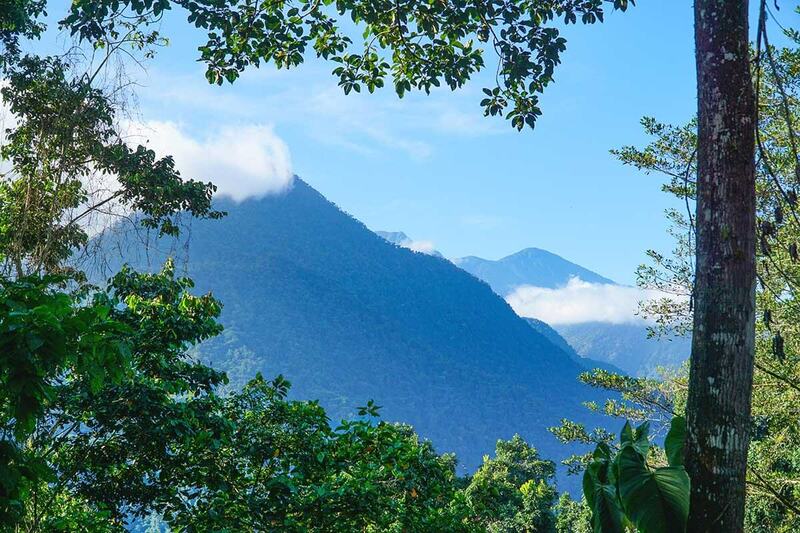 Altitude: Maximum elevation is at La Ciudad Perdida itself at 1,150 meters, around 3,800 feet. So you will have no altitude issues. Safety: The area has been safe for over 10 years. The Colombian army actively patrols the area and you will be on a guided trip. In 2016, Colombia’s president was awarded the Nobel Peace Prize for brokering a peace agreement with leftist rebel groups. La Ciudad Perdida is about 30 km from Colombia’s Caribbean Coast. Treks start in Santa Marta at your guiding companies offices. Most people will fly into Cartagena. From there it is 4 hour bus ride to Santa Marta. CLICK ON MAP TO ENLARGE. Accommodations: This is far from a luxury trip. 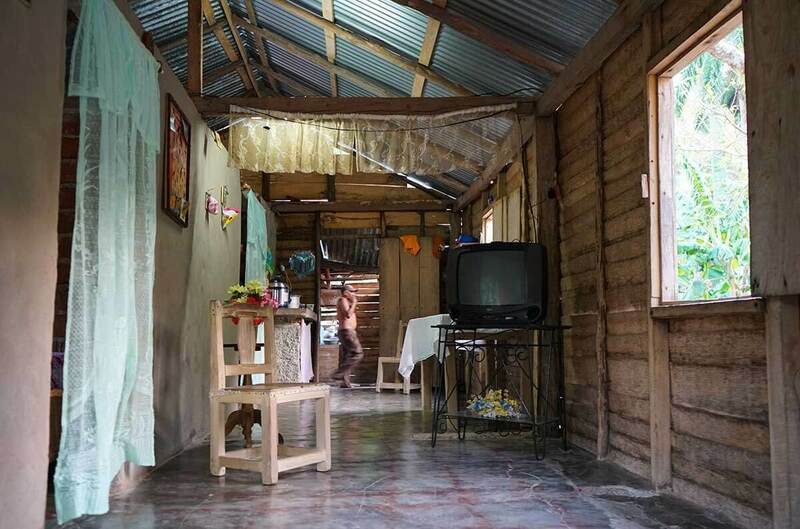 Camps are minimal with open walled shelters–many with dirt floors. 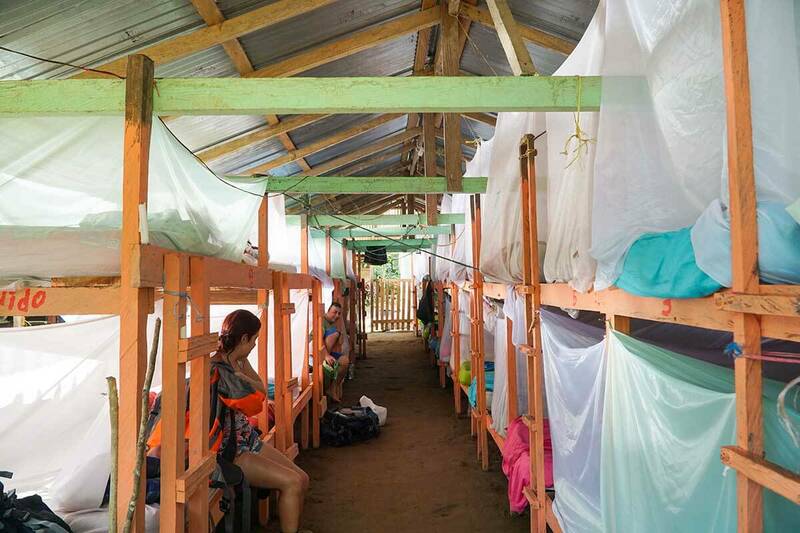 They have netted sleeping bunks (or hammocks), cold showers and flush toilets. Some camps have very limited electricity (lighting and a few outlets for the whole camp), while other camps have no electricity. 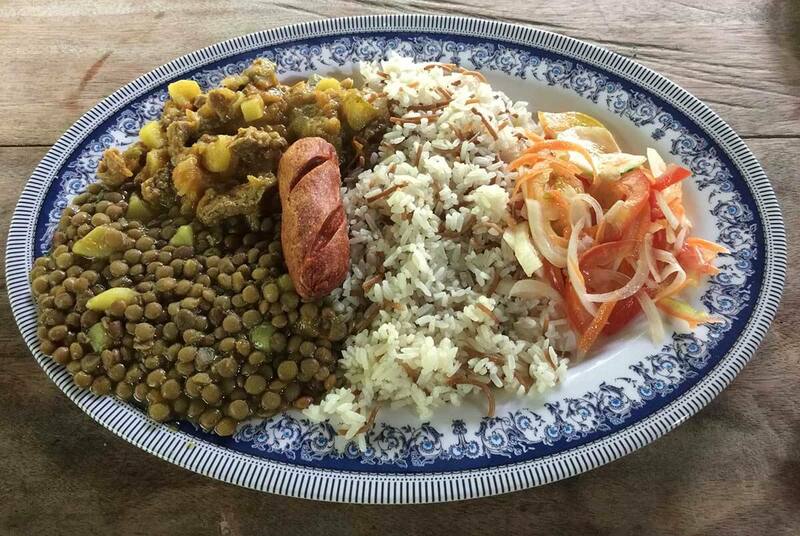 Food: Simple, local food is served on the trek. You get breakfast, lunch and dinner in camps and there are two fruit/snack stops during the day. Portion sizes are about right. Food is prepared in a very basic, outdoor cooking area. We ate and drank what they gave us and did fine with no problems. Water: We did not need to treat water. There is free purified water in the camps. And between camps, if you run out of water there were stands at a few places along the route with snacks, beverages, and bottled water for sale. Even fresh squeezed orange juice if you are lucky! You are a guest in indigenous lands at their sacred site. On your trek, you walk through indigenous villages and lands of the decedents of the people that built and lived in La Ciudad Perdida. 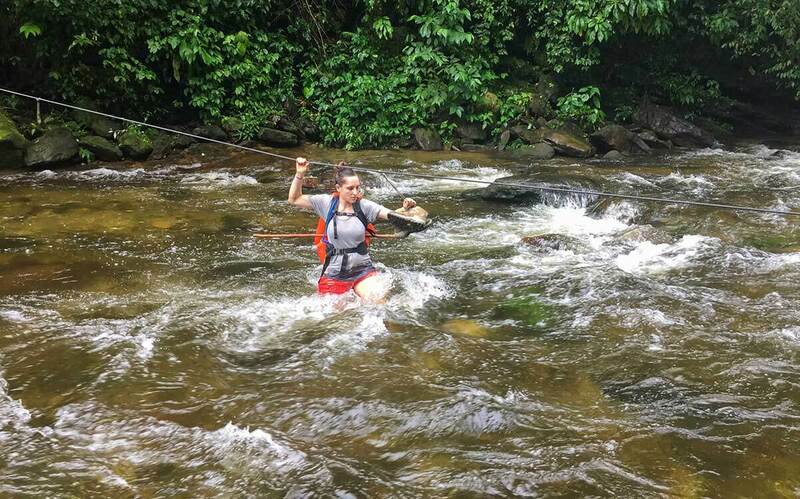 Crossing the the Buritaca River with the help of a steel cable. 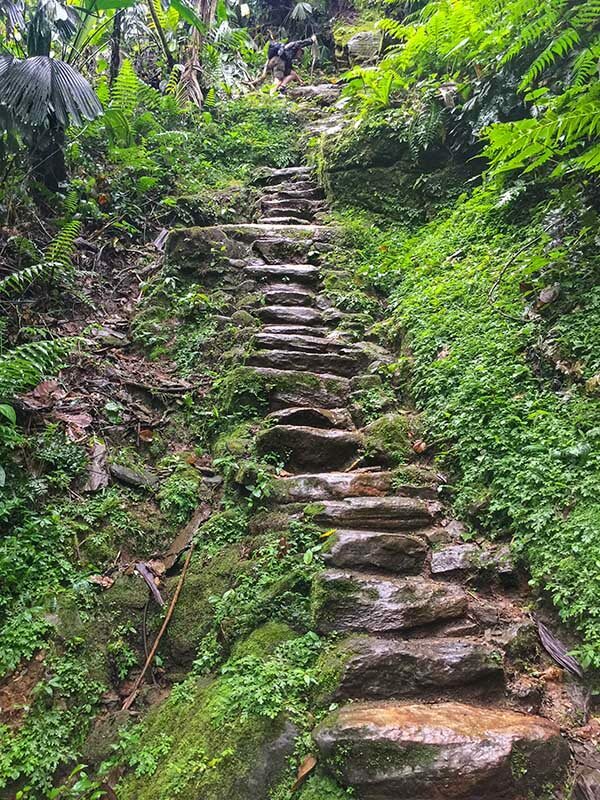 After crossing the the Buritaca River you immediately ascend over 1350 stone stairs to La Ciudad Perdida. They can be quite slippery when wet. It’s a steep climb — about 300 meters vertical in 0.9 km (1000 ft in just 1/2 mile). 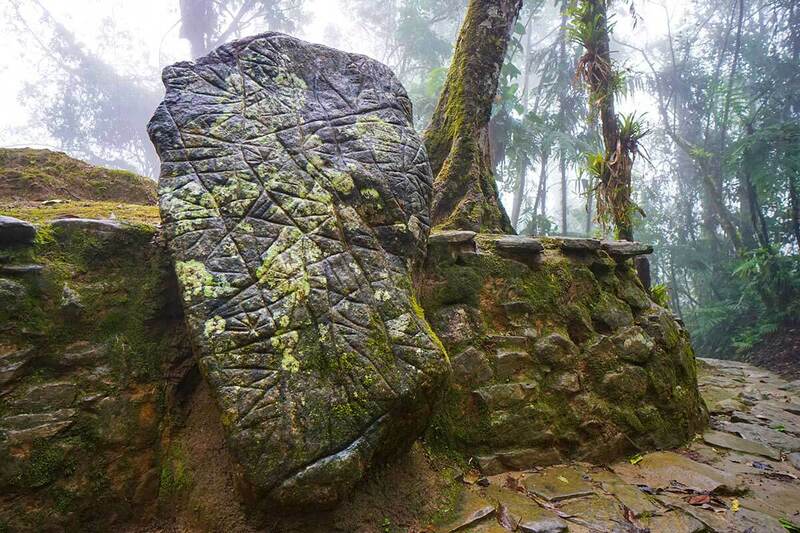 A boulder with carved markings, believed to be a map of the Tairona world. A refreshing swim in a jungle river after a hot and humid hike was one of the trip highlights. 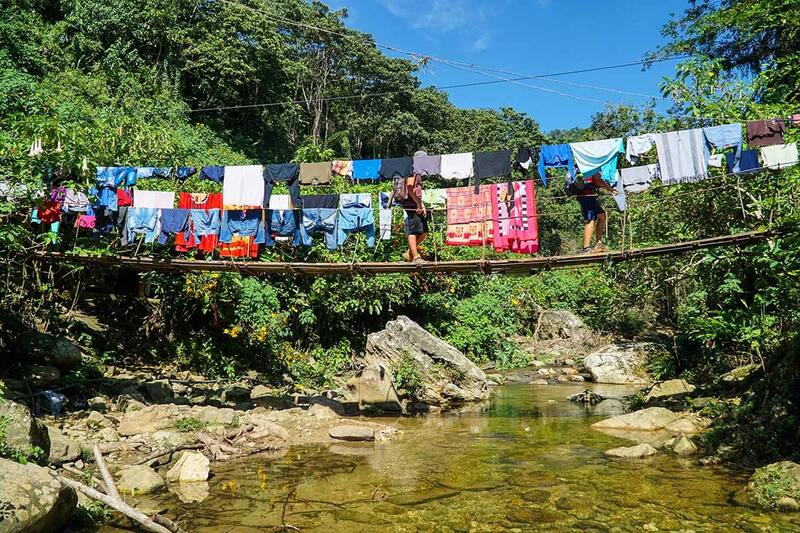 Drying clothing on the suspension bridge at Adan Camp looks more like prayer flags than laundry. 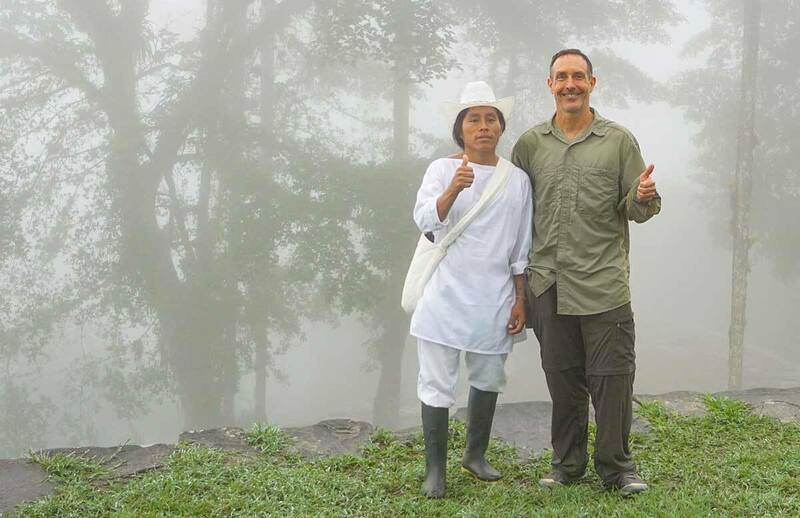 Abel, our Wiwa guide in traditional all-white, Wiwa clothing, including a white shoulder bag. He’s holding his poporo, a sacred gourd used for carrying lime which activates the cocoa leaves they chew. 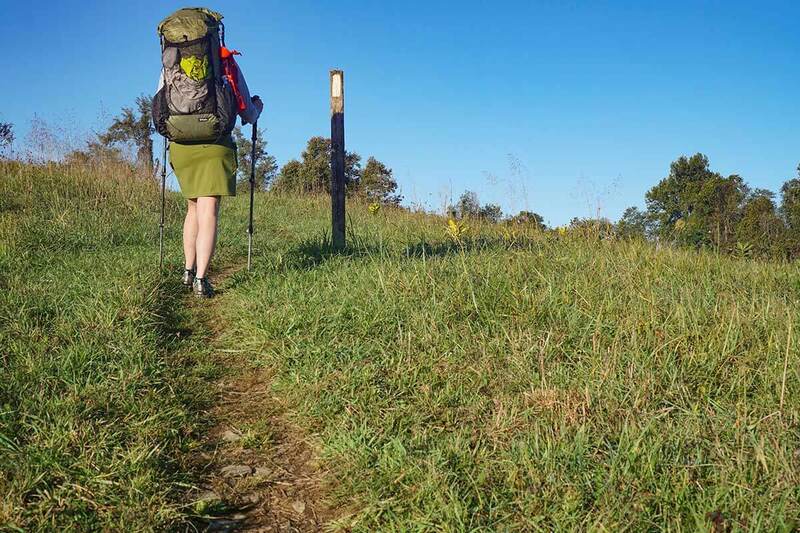 A heavy pack will make uphill hiking hot and unpleasant. We recommend a small pack with minimal gear — less than 4 kilos (8 pounds) per person — under 3 kilos is even better. See our gear packing list below for ideas to save weight. It’s not advertised, but you can have gear carried between camps by mule. [All food and supplies go in and out on mule. So the mule is going anyway and you are supporting the local economy!] It’s around 20,000 Colombia peso (COP) per bag for each leg (about $7 USD). Our strategy was to put most our gear (for the two of us) into a single pack to be carried on the mule. 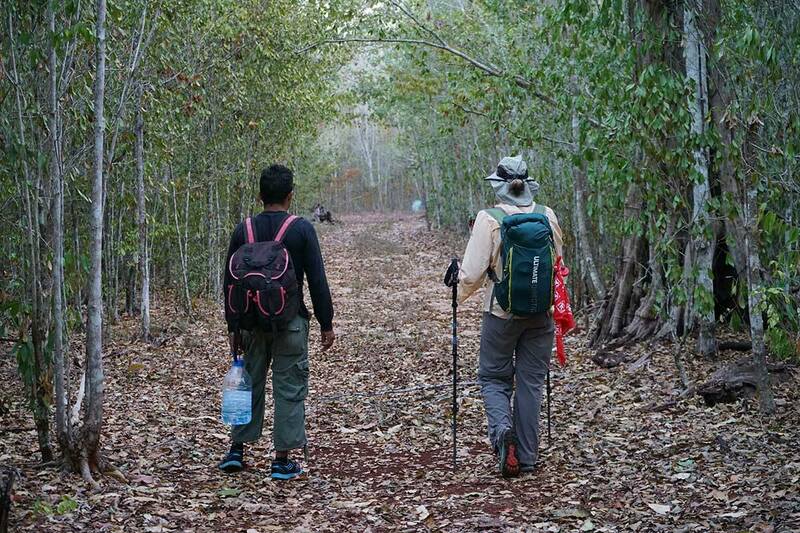 We then shared a single 20-liter pack between us to carry our minimal gear while trekking during the day. A simple and inexpensive 10-20 liter daypack works just fine — you probably own one. A mesh/vented back panel is desirable as you’ll be sweating tons hiking uphill in the heat. While not cheap, we found our Ultimate Direction Fastpack 20, with its breathable mesh back and numerous pockets ideal. We strongly recommend a few light dry bags to keep gear in your pack dry — especially, cameras, electronics and important documents like your passport, etc. And these dry bags should have a valve-free air expelling design for compact packing. Trekking poles make it much easier to negotiate sections of muddy/slippery trail and river crossings. They are far lighter and more functional than the single wooden staff most trekkers use. We took these inexpensive but excellent carbon fiber trekking poles. They are ideal for travel as they compact to fit into carry-on luggage. You’ll want a good headlamp. It gets dark at 18:00 and most areas of camp are unlit. Finally, this is a trip to take pictures! If you are serious about photography, you’ll want to bring a very good camera, and have a strategy that allows you to shoot in light or intermittent rain. Hiking up the main road/path to the highest point in La Ciudad Perdida. Backpack for all your gear 30 to 40+ liter backpack If you are carrying ALL your gear (NO mule): See Recommended Lightweight Backpacks. Since food and bed are provided you can get by with a smaller/lighter pack. Headlamp Black Diamond Ion (54g) 1.9 Light and bright. Use around camp and in unlit sleeping areas. It gets dark at 18:00. All food and supplies go in and out on mule. There is an inexpensive option to have all your non-day-hiking gear transported to the next camp on a mule. The mule is going anyway and you are supporting the local economy! And this is the back of a group member that insisted on hiking uphill with his shirt off. We chose to wear long sleeve shirts and full-length pants factory-treated with insect repellent (permethrin). Pre treated clothing has near-permanent effectiveness (clothing treated before purchase is labeled for efficacy through 70 launderings). 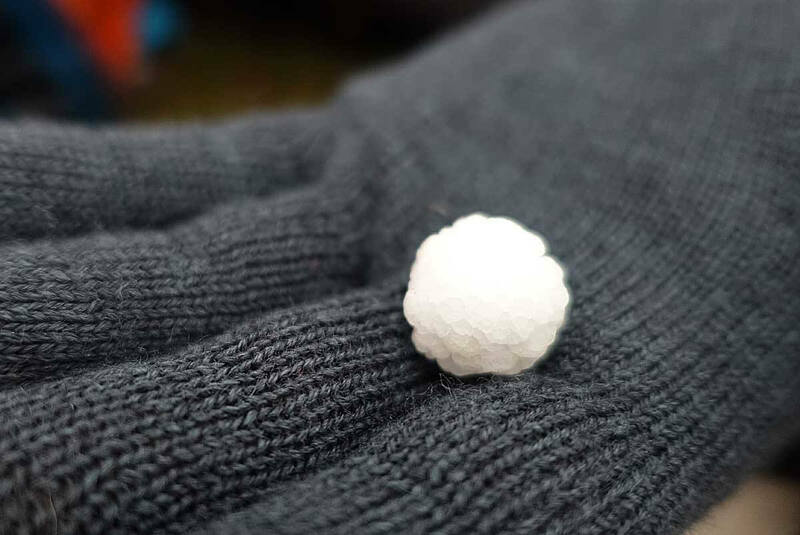 You can also treat your own clothing with a Permethrin spray (Sawyer) which lasts up to 6 weeks (or 6 washings). You’ll want a change of dry clothing reserved for camp use only*. 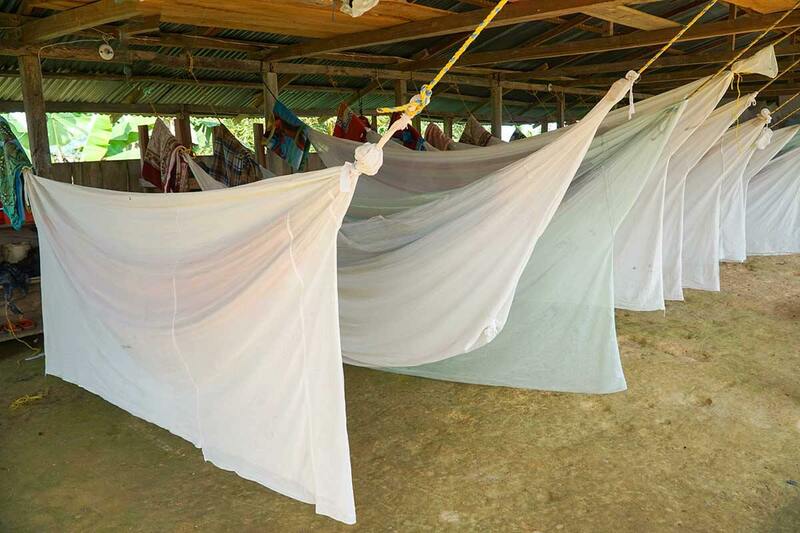 We recommend long sleeve shirts and full-leg insect treated pants as insects are active in camp. Some may also choose to wear insect repellent treated socks, altho in our case our pants draped sufficiently over our shoes. To complete the insect repellent treatment for 100% of our body, we applied insect repellent to the unprotected areas of our hands, neck and face; DEET (or the newer Picaridin which doesn’t degrade clothing or plastics). We prefer airline friendly 0.5 pump sprays, which are small, pocketable and easily applied in the field. And as always, follow the product’s directions! 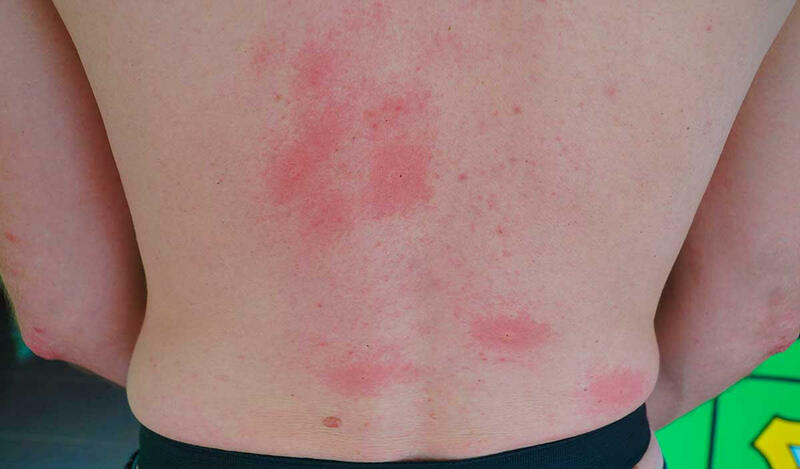 Per the CDC apply sunscreen before applying insect repellent. Washing clothes: There’s a great swimming hole at camp Wiwah. You don’t really need a swimsuit. Alan swam in his hiking shorts commando. Alison swam in her running bra and underwear (very close to matching). It was a great way to rise out/wash hiking clothes. It’s a great way to rinse sweat and salt off your body and out of your hiking clothes. Otherwise you can wash clothes in the camp in the evening. * Note: We took two set of insect repellent pants and shirts — one pair exclusively for hiking, and one pair reserved for dry/camp use only. The reason is that hiking clothes will get wet with rain and/or sweat during the day and will not dry completely overnight. In the morning we just put on our damp hiking clothes (they will be dry in 30-60 minutes from your body heat), and put our dry camp clothes back in our packs. That way we always had dry camp clothes to change into. Bliss! Shirt hiking RailRiders Men’s Journeyman Shirt w Insect Shield & Women’s Oasis 10.0 Our favorite: Light, cool, sun protection AND continuous insect repellent. Nice pockets. Shirt (camp) Exofficio Bugs Away Halo Long Sleeve Shirt Men’s and Women’s Also good, widely available via Amazon and other retailers like REI Continuous insect repellent. Pants (hiking or camp) RailRiders Men’s Eco-Mesh Pant with Insect Shield 10.0 RailRiders pants have huge side vent on legs for cooling. Continuous insect repellent. Pants hiking ExOfficio BugsAway Ziwa Pants Men’s and Women’s 16.0 Avail in both M’s and W’s. Light, cool, sun protection. Continuous insect repellent. Insect repellent Sawyer Permethrin, treat clothing Allows you to treat your current clothing. Lasts up to 6 weeks (or 6 washings). or inexpensive REI Coop 6.4 Great for staying dry when in camp. Likely too hot to wear hiking except downhill. Fleece shirt North Face TKA 100 1/4-Zip 7.9 Light and compact travel garment. For warmth in camp at night and sleeping. Good pillow! (or Lone Peaks) 18.0 Light. Huge toe room. Super comfortable! Shoes sugg. Inov-8 ROCLITE 295 (20oz) Another favorite. Light, sticky rubber, durable. Gaiters Dirty Girl gaiters (1.2 oz) 1.2 Optional, but does seal ankles against tick entry. Tucking pants into socks also works. Swimsuit If you don’t want to swim in your clothes. See washing clothes above. *Note: You don’t absolutely need a rain jacket. But it’s nice for getting around camp when it’s raining. Or when you are hiking long downhills in torrential rain. Otherwise it’s too hot and the rain is refreshing. As noted earlier we chose to go with an indigenous tour company. Our guiding company, Wiwa Tour is owned and operated by the Wiwa indigenous group, descendants of the Tairona who built the city. Other tour companies are below. All tour companies operate out of Santa Marta. 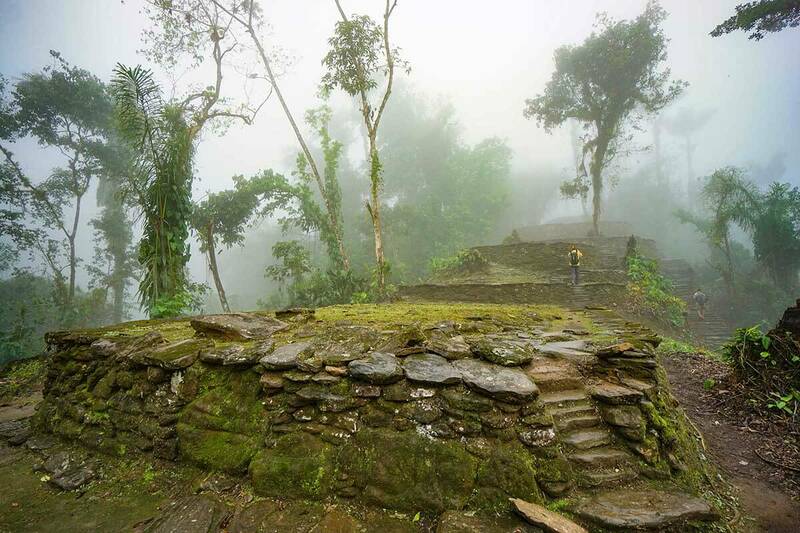 La Ciudad Perdida (Lost City) is about 30 km from Colombia’s Caribbean Coast. Treks start in Santa Marta at your guiding companies offices. Most people will fly into Cartagena. From there it is 4-hour bus ride to Santa Marta. CLICK ON MAP TO ENLARGE. From the US, it’s easiest to fly into Cartagena. It’s about a 4-hour drive to Santa Marta and the roads can be busy at any time of day. You’ll go through the city of Barranquilla (Colombia’s 4th largest) and will experience heavy traffic there unless it’s off-peak. The most attractive options we found were buses leaving from near the airport: Marsol for COP 30,000/pp and has a set schedule leaving about 5-6 times per day. Last bus at 4pm. Berlinas, which has good WiFi on-board (COP 40,000/pp) and seems to leave about every 30 minutes from 5am ish to 8pm ish–the Marbella Office is 10 minutes from the Airport. If you go to the Main Bus Terminal in Cartagena, you will find the cheapest buses to Santa Marta. But it will take a lot more time to get to Santa Marta. It’s a long way from the airport to the Main Terminal and the cheapest buses make more stops. The trek starts in Santa Marta. Most treks start between 8-9am from the trekking company’s office. At that point, any unpaid balance is paid and then trekkers are loaded up in the back of a jeep for a 3-hour drive. The jeep’s not very comfortable and packs go on top of the car (our driver covered packs with garbage bags when it started to rain). The jeep then leaves the main road and begins an hour long ascent to El Mamey on a narrow and bumpy dirt road. At El Mamey, after lunch, the hike begins. 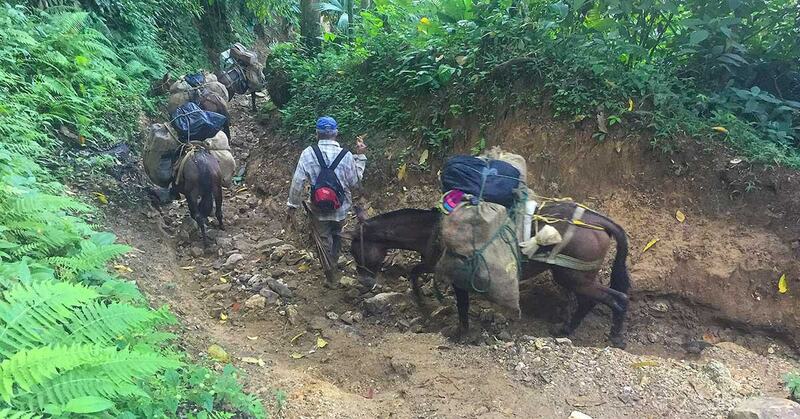 As noted, at this point if you’d like to use the mules to carry your gear, let the guides know and they can help to organize that for you (it was about $20,000 COP/day). 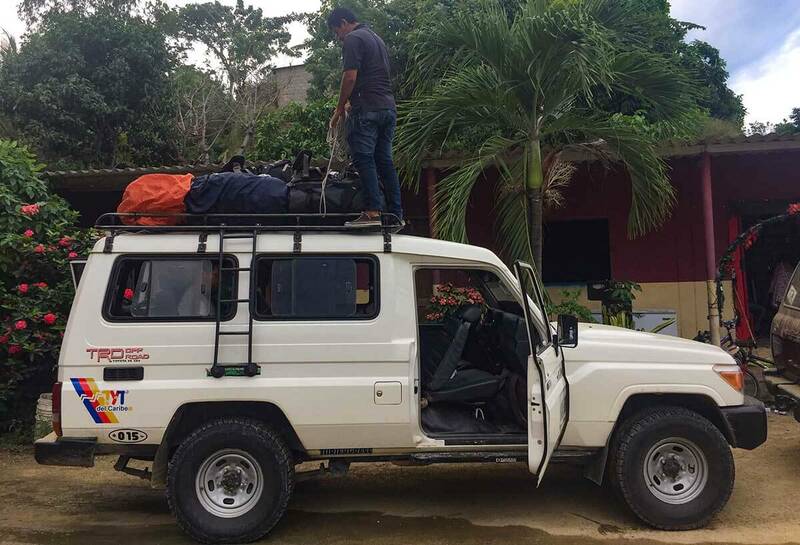 A typical 4wd vehicle used to transport up to 10 clients and their gear to the trip start. This far from a luxury trip. Camps are minimal. Open walled shelters–many with dirt floors. Netted sleeping bunks (or hammocks). Cold showers and flush toilets. Some camps have very limited electricity (lighting and a few outlets for the whole camp), and other camps have no electricity. See Best Backpacking and Travel electronics Gear to keep your electronics charged and running whether there is electricity or not. Sleeping quarters are tight and you may want to wear earplugs at night. Note: Although we did not have problems, we did hear a report of insect bites (fleas? bedbugs?) in the bunks at Camp 2 (Wiwa). Evening at Adán camp (first night on trek), which is also a small native community. Note the suspension bridge across the river. 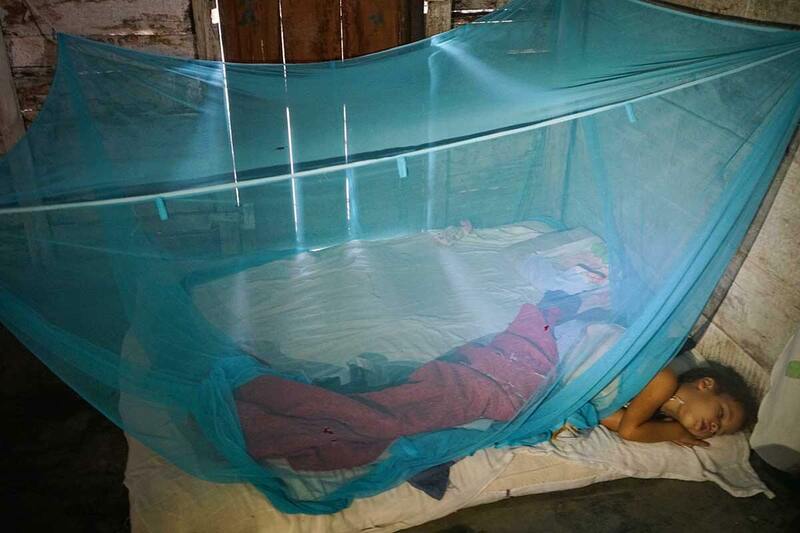 Basic accommodations: bunks covered with mosquito netting. An open air shelter with dirt floors is common at most camps. 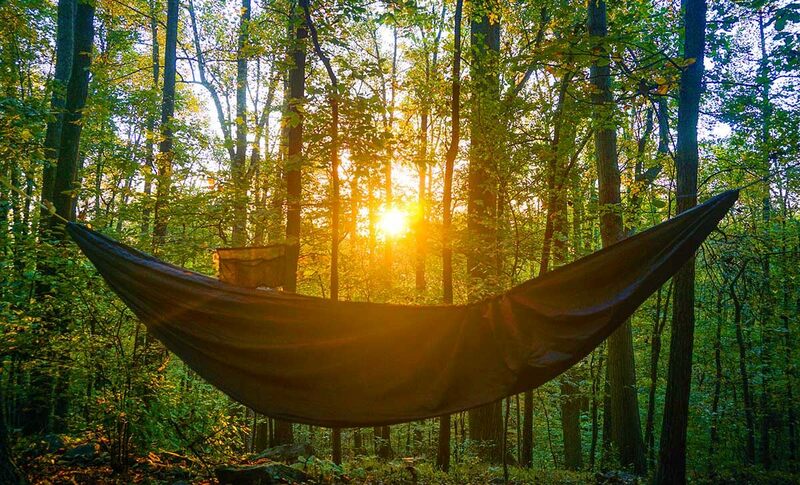 Some camps have an option of sleeping in a hammock covered with mosquito netting. Simple, local food is served on the trek. You get breakfast, lunch and dinner in camps and there are two fruit/snack stops during the day. Portion sizes are about right. 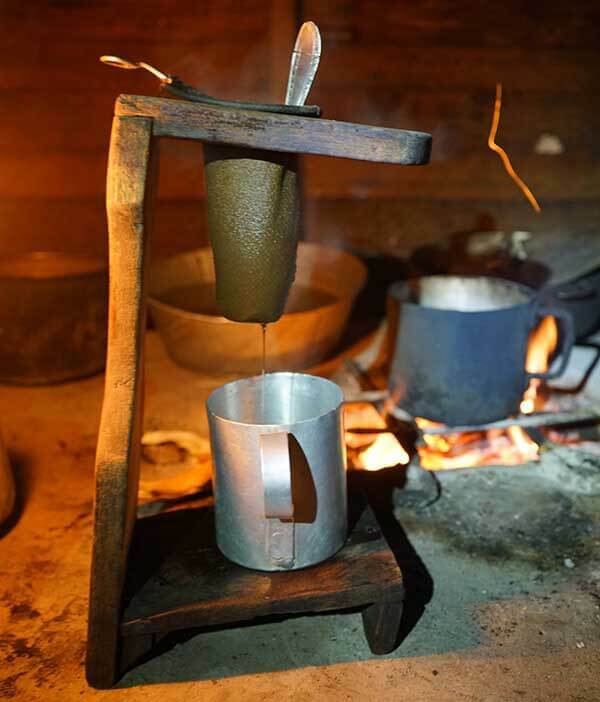 Food is prepared in a very basic, outdoor cooking area. We ate and drank what they gave us and did fine with no problems. Typical outdoor eating area. And please forget the bare skinned crazies posing as mosquito feeding stations! That is certainly not us. A typical plate of food [lunch on day 3]. We did not need to treat water. There is free purified water in all the camps housed in large containers (but ask before just to make sure it has been purified!). Between camps, if you run out of water there were stands at a few places along the route with snacks, beverages, and bottled water for sale. Even fresh squeezed orange juice if you are lucky! While daily hiking distances are modest, this is not a flat trek with easy trails. The tropical heat and humidity make the days seem longer and harder. Most folks in our group managed fine, but some sections of the trail are steeply up and down. Some sections are deeply eroded, rutted, and wet. 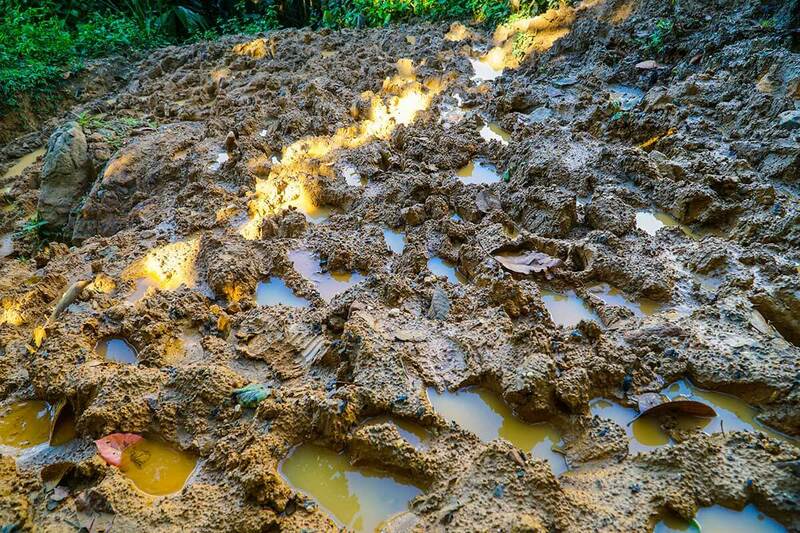 There are more than a few muddy, slippery or rocky sections. There are a number of river crossings. And note that wet rocks (and stairs) can be insane slippery! 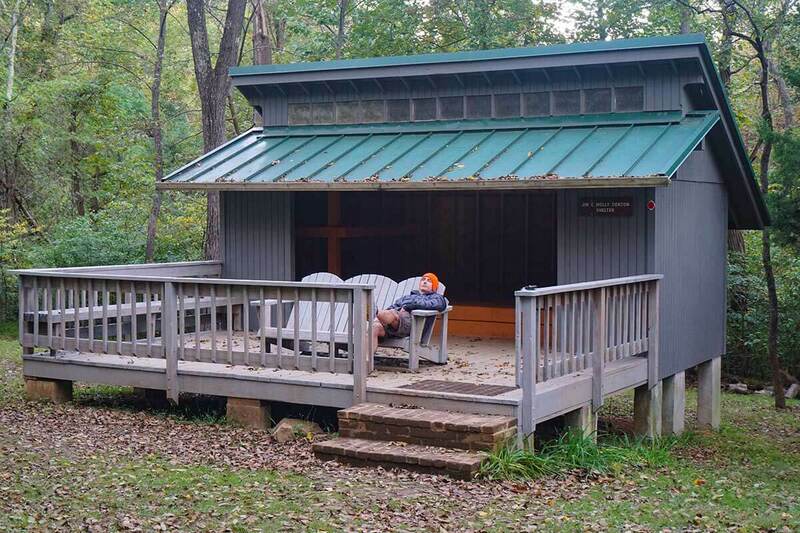 Note: Guides set the schedule of when you arrive and leave rest stops and camps. As such, your personal hiking speeds/times are likely not relevant. However, we did not hike as one group. The faster hikers arrived at the rest stops earlier, and left the rest stops before the slower hikers were ready to leave. Overall of Ciudad Perdida Trek. CLICK ON MAP TO ENLARGE AS A PDF. Note 1: most days we woke before dawn, breakfasted and start hiking around daylight (about 6 am). This was to avoid hiking in the heat of the day and to hopefully arrive in camp before the afternoon/evening rain. Note 2: Guides set the schedule of when you arrive and leave rest stops and camps. As such, your personal hiking speeds/times are likely not relevant. However, we did not hike as one group. The faster hikers arrived at the rest stops earlier, and left the rest stops before the slower hikers were ready to leave. Text descriptions below are adapted from Wiwa Tour and we’ve left some obvious grammatical errors. Our notes/corrections are in  brackets. We start from the oldest city in Colombia, Santa Marta at 8:30 am in a heated [I think they mean air conditioned] van to the sector Aguacatera, there perform transshipment to a 4 × 4 vehicle [No transfer. We took a single 4×4 vehicle all the way from Santa Marta to El Mamey. No A/C in the vehicle but not really needed.] that will lead us towards the sector mamey (Machete Pelao) in there we will have lunch. After lunch we start a walk of 7.6 km to the first camp (Adan hut, peasant community) where we spend the night. We will also make a stop in a crystal clear river for a refreshing bath. Some people complete the walk in 3 hours, others in 5, all depends on your physical condition. During the night, the Indian guide will talk about the history and customs of their community and the region. It can rain very hard at times flooding the trail and making for slow/slippery going. Begin a walk of about 8 hours, halfway visit the indigenous community of Mutanzhi and we interact with them, then get to the cabin 3. (Paradise cabin Teyuna, indigenous community). Located at an altitude of 830 meters above sea level, here we are at the foot of Teizhuna (Teyuna), the holy city of the Tayrona. On this tour we will appreciate much of the fauna and flora of our Sierra Nevada de Santa Marta. In the afternoon we can relax and take a bath in the river. At night the guide will tell you more about Lost City and its sacred meaning for the natives of the Sierra. Some sections of the trail are quite muddy, although you can usually find a path around to miss most of it. After breakfast we depart at 7 a.m. to Lost City. To reach the holy city will go up by 1200 steps built by the ancient Tayrona. After about an hour we reach the city and take a journey through the different sacred sites of this. There, the Mamo (Indian spiritual leader) sacred stories tell us and give us advice for life. At 11 a.m. back to the cabin 3 for lunch. After lunch we start down 5 to 6 hours to camp 2 (cabin Mumake, indigenous community [actually Camp Wiwa]) where we spend the night. In hours of the morning to the Mamey (Machete Pelao), in the way we visit a small natural waterfall to freshen up and take a bath. Arriving at the mamey take lunch, then we collect the vehicle that will take us to the avocado industry [no avocado tour], we will take a heated van that will take us back to Santa Marta. arrival at approximately 4:00 pm. Other benefits: Shake he winter blues, lack of crowds & cool temperatures make great hiking (& sleeping) conditions; spring wildflowers, no bugs, great views with leaves off trees. Lack of crowds is a definite advantage to early spring trips: This lovely waterfall in Dolly Sods is by an extremely popular backcountry campsite. 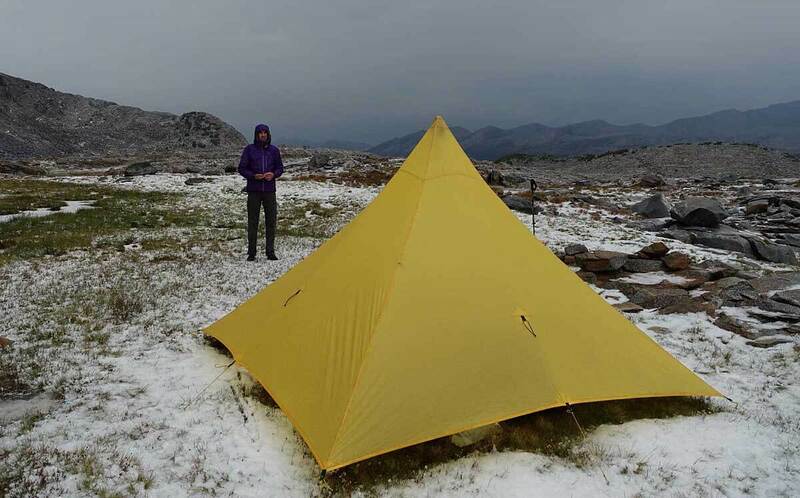 In high season it can be hard to find a place to pitch a tent. In early spring, this campsite area (day 2 of our trip) was nearly deserted and we got the best campsite in the place with this view! Challenges of spring camping, at least on the east coast, include a higher probability of cold rain (we had 35 degree rain the first afternoon/evening), wet and muddy trails, and the possibility of quite cold nights (it went down to 20F our second night out). We managed all of these with the right gear and technique. 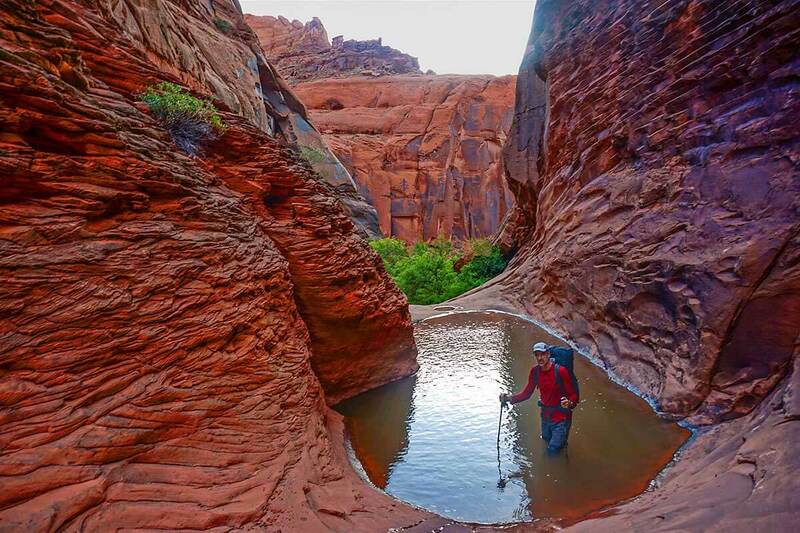 Living on the East Coast, many people think there are limited options for hiking. Not so! 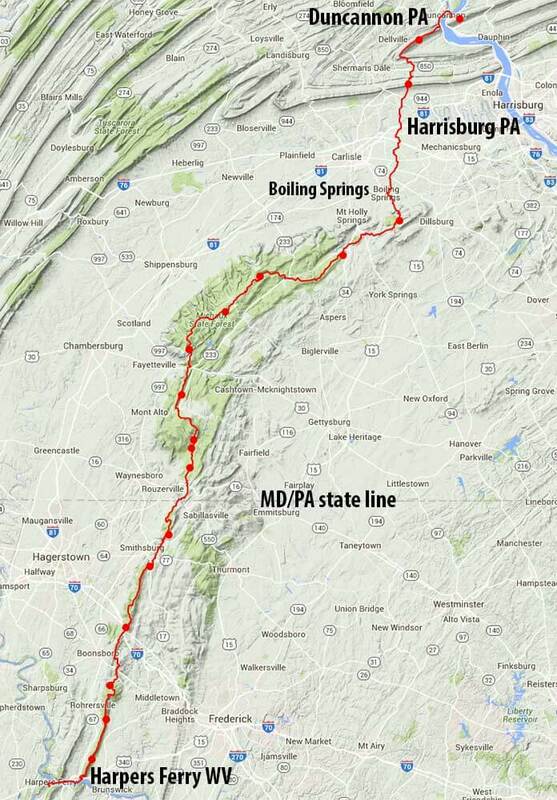 See: AMC’s Best Backpacking in the Mid-Atlantic: A Guide To 30 Of The Best Multiday Trips From New York To Virginia. Although we don’t have the famous places like Yosemite or Yellowstone, there are plenty of options for a good weekend outing. This year, we chose one of our favorites, Dolly Sods Wilderness Area for our early spring backpacking trip. Even though we’ve been to the Sods (or “the Sogs” as this wet area is affectionally known) for over a dozen years. But there is always something new and different for us to explore. This year, not only did we discover a new trail with spectacular views (lead photo for this post), but we’ve never quite had such a magically misty morning like the one that greet us our second day out. It was a welcome antidote to sleeping in a 25-degree pine grove with the weather spitting on us most of the night. Day 1 was more late winter than early spring. This was a 1/2 day as we both worked in the morning. We arrived at Trail Head at 2:00 pm. By early evening it was 35 degrees, spitting rain, and skies were ominously dark while ridges and high meadows were shrouded in mist. The Dunkenbarger Trail, notoriously wet in normal times, was more lake/mud river than trail due to rain storm the night before. About 70% of the Dunkenbarger Trail was 6-18 inches deep in near freezing water and mud. Sections of other trails were only marginally better. We arrived in camp with soaking wet shoes and socks, and pants bottoms covered in mud up to the knee. We quickly got into all the down we could muster and hung our hammocks in a sheltered grove of pine trees. Downside of spring camping, at least on the east coast, is higher probability of wet and muddy trails. While moderately unpleasant on a sunny 60 degree day, hiking on a “trail” like this in 35 degree rain can be near misery (as was our hike along the Dunkebarger Trail on Day 1). Warm and snug in our hammocks sheltered in grove of pines. It was spitting rain when we went to bed and dropped to 25 degrees by the next morning. Alan was evaluating a very light hammock system for his upcoming Appalachian Trail Section Hike. [Alan on left: Dutchware Netless Hammock with Dutchware suspension/hardware, Hammock Gear (HG) top & bottom quilts, and HG Cuben Hex Tarp Alison on right: Hammeck Envy hammock, HG top & bottom quilts, and Mountain Laurel Designs Cuben Hex Tarp] We both stayed warm, dry and happy in our hammocks. The day started cold. Temps were in the mid 20’s and there is no joy quite like putting on frozen shoes and socks onto already cold feet. It was cold enough that we had our tea and coffee while packing up but left without eating breakfast. Still wearing our down jackets we quickly hammered out some fast trail miles to warm up those frozen toes. We hoped to hike around 25 miles on Day 2 since this trip was training for upcoming backpacking trips (based on our Quick and Efficient Training for Backpacking). Getting the miles in was going to be a challenge with most trails either muddy or running small streams. But the sunny day semi-dried up the Sogs, and by noon the trails were in better condition than Day 1. We carefully chained together “drier” trails in the northern sections of the Sods, and managed to get 25 miles in before hitting camp that evening. Then the Spring Magic started to happen. We took an innocuous and faint tread of a trail to the top of a ridge and got a spectacular view of the Canaan Valley spread out below us filled with morning mists. It was a perfect spot to sit and watch the mists while we ate our breakfast on the frost covered hill side. 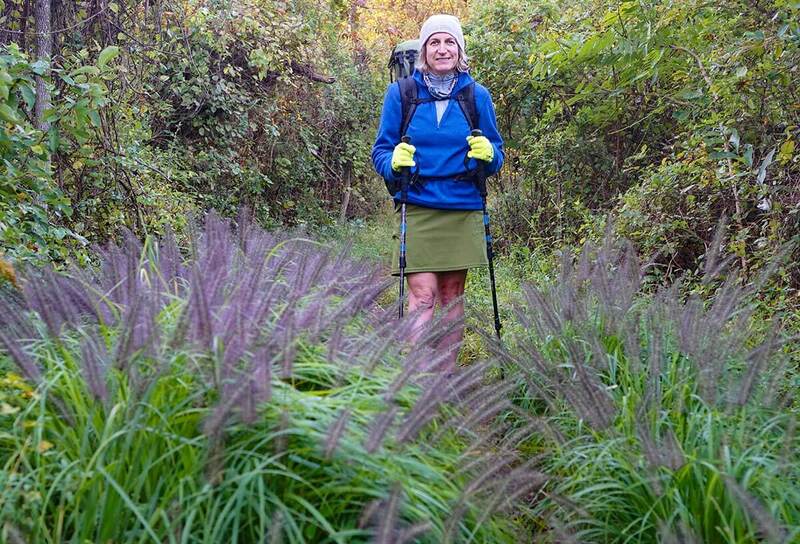 Our REI Sahara Convertible Pants seem to go on just about every trip in every weather. By the time we were done with breakfast, the mists were gone. It never ceases to amaze us how a trip can change from slogging along in near misery, to near bliss in just a few hours. Spring backpacking is like that. Mid-morning the grass is still covered in frost, and Alison is still hiking in her fleece and down jacket to stay warm. The mist is almost gone from the Canaan Valley. Spring arrived around 11 am with sunshine, blue skies and temps nearing the 60s, just as the national Wx service had forecast—and the reason we had headed out this weekend. By mid-afternoon we came by this day-hiking couple eating apples under this tree. As far cry, from wearing a down jacket while hiking just a few hours earlier. Snuggled into our hammocks and warm down quilts for a great sleep on a cold night (20 degrees). No tarps needed as it was clear skies and we wanted to stargaze. Again, Alan was evaluating a very light hammock system for his upcoming Appalachian Trail Section Hike. [Alan’s hammock in front: Dutchware Netless Hammock with Dutchware suspension/hardware, Hammock Gear (HG) top & bottom quilts. Alison on right: Hammeck Envy hammock, HG top & bottom quilts. Both hammock systems performed flawlessly on two nights, both in the 20s. Our Day 2 campsite is one of our all-time favorites with a great view of one of the nicest waterfalls in the Sods. It froze hard overnight, registering 20F on my thermometer. In the morning our socks where frozen stiff as boards as were our shoes (since we were walking out that morning, we transformed our “sleeping” socks into trail socks and started walking. Our shoes un-froze and our feet were warm in a few minutes). We did a quick 6-7 miles back to the car and our early spring camping trip was done and dusted. In keeping with a Dolly Sods traditiona, we stopped for brunch at a favorite local haunt, Cristina’s Cafe – Strasburg, VA, for whole grain, sourdough french toast topped with fresh strawberries and whipped cream, and excellent, just-brewed coffee. Highly recommended! We were back in DC in time to unload gear out of the car, shower, take a quick nap, have dinner and easily make our evening play. That’s what we call a full and fun weekend! Drying out all our damp gear from a couple of cold and wet nights. Actually, the down jackets and quilts were spread out in the back of our wagon and already drying on the way home. 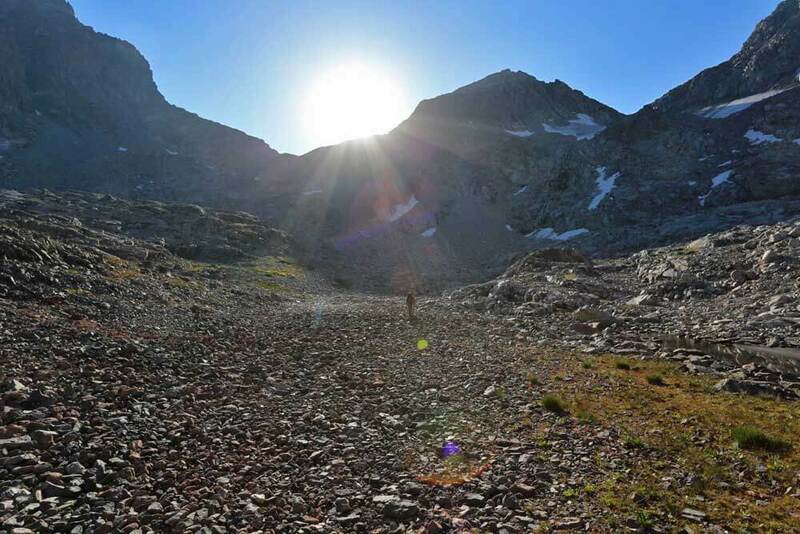 The Wind River High Route is in our opinion, mile for mile, the finest non-technical Alpine route in North America. It stays close to the crest of the Continental Divide in one of the most rugged and glaciated mountain ranges in the lower 48. The route is thrilling and the scenery spectacular. The WRHR is a solid route after two seasons of successful trips. Nonetheless, I’ve added new field data on variants to the route (some easier). A cool Google Earth Flyover Video of the route (Thanks Erin!). Alan hiking up to Knapsack Col carrying all his junk in a trim ULA Ohm 2.0 Pack. 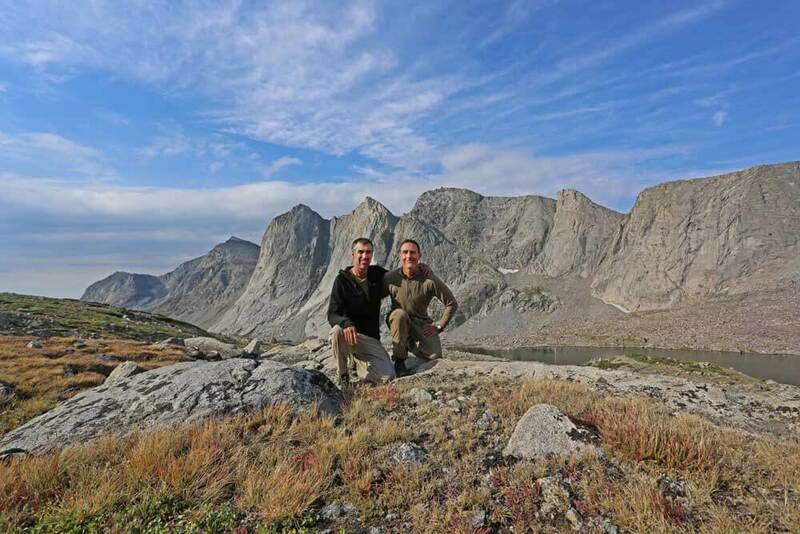 The Wind River High Route (WRHR) is similar in concept to the Sierra High Route (SHR) but Don and I feel that the WRHR is more spectacular and thrilling. Just as the SHR loosely follows the famous John Muir Trail (JMT) but spends much of its time off-trail, more closely following the Sierra crest, the WRHR in a comparable manner loosely follows the Highline Trail, many times going off-trail to stay higher and closer to the Continental Divide—a more elegant line in high glaciated terrain. When the WRHR uses trails they are higher trails, closer to the crest. 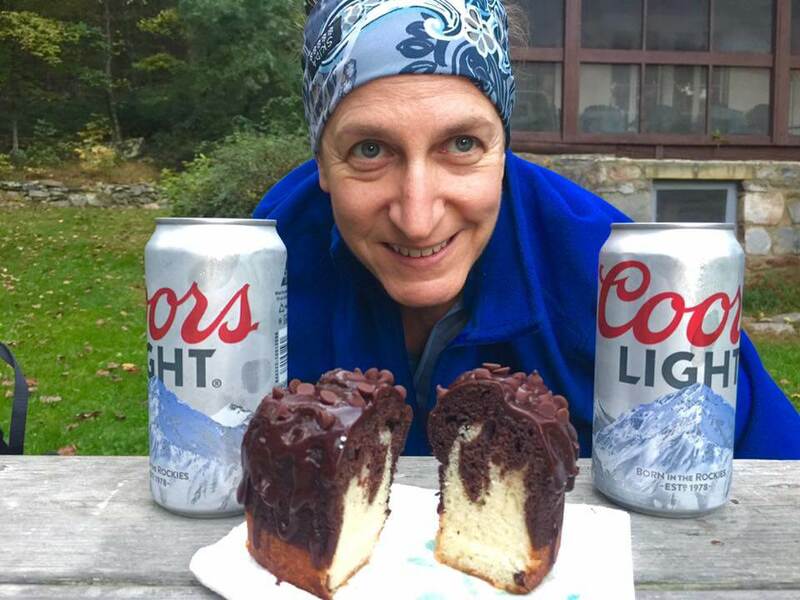 It is a more challenging and more rewarding route than the Highline Trail. The WRHR starts in the north at the Green River Lakes Trailhead and the headwaters of the Green River. It heads generally southeast to follow the Continental Divide, crossing it four times. 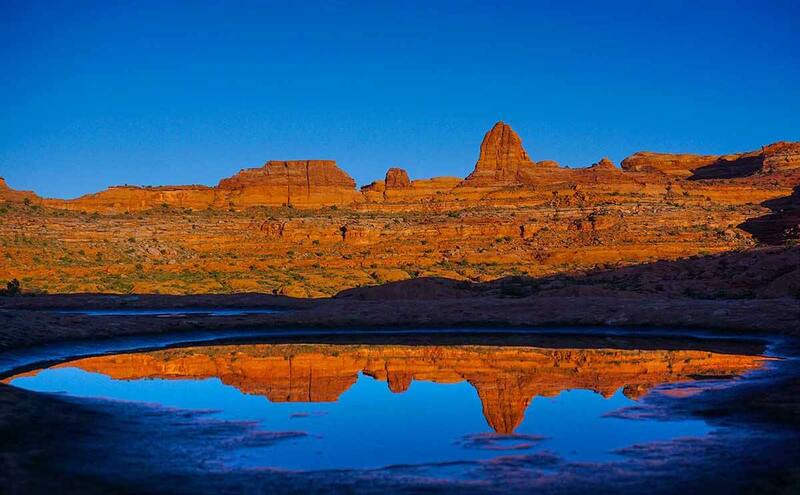 After passing through the legendary Cirque of the Towers, it ends at the Big Sandy Trailhead. The WRHR is approximately 80 miles of off-trail and on-trail travel with about 20,000 feet of cumulative elevation gain. 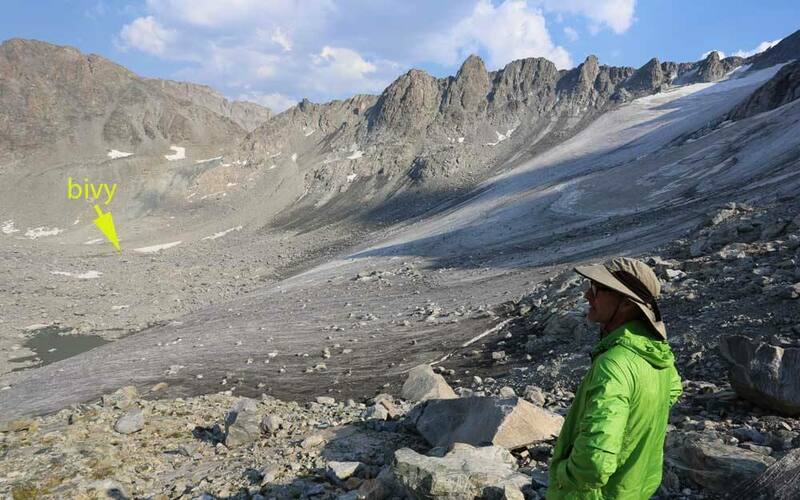 There are nine passes between 12,200 ft and 11,500 ft—six off-trail and three on-trail. Some of the off-trail passes have a fair amount of talus. There are few short sections of Class 3/4 travel and one glacier crossing. The recommended hiking season is late summer. This gives time for the high snowfields to melt out and reduces mosquito pressure. By mid September their is a decent chance of snow. An elegant line closely following the crest of the Continental Divide along the finest section of the Wind River Range. and the five weekdays in between = 9 days total). Route stays high but without being inefficient, or taking unnecessary risks to force a higher line. Uses convenient trail heads with an easy shuttle. The impressive Mt. Bonneville. A massive talus field is spread out below. This is fairly typical terrain for off-trail passes along the route. Trail along the eastern shore of the turquoise colored Green River Lakes. The hike starts with the gentlest of introductions. A mellow wander up the flat and scenic drainage of the Green River for the first few hours, with excellent views of Squaretop Mountain. 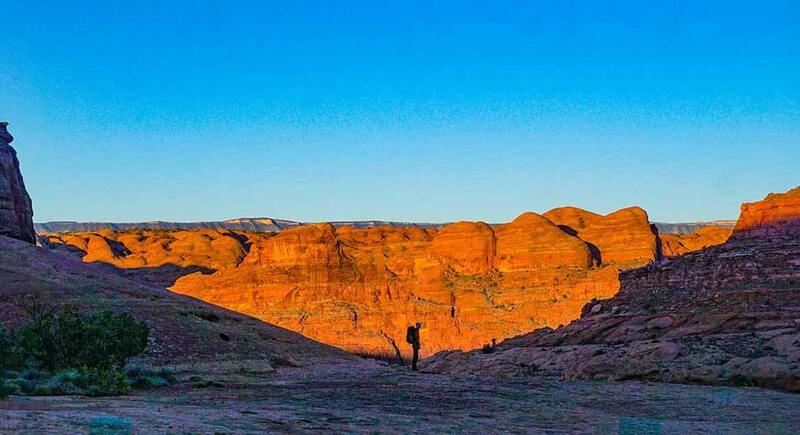 From the Green River Lakes trailhead, take the trail that heads along the eastern shore of the two turquoise colored Green River Lakes. This trail is marked as both the Highline Trail and the Continental Divide Trail. After passing the two lakes, the trail begins a very gradual climb toward Three Forks Park, which is reached after several hours of hiking. 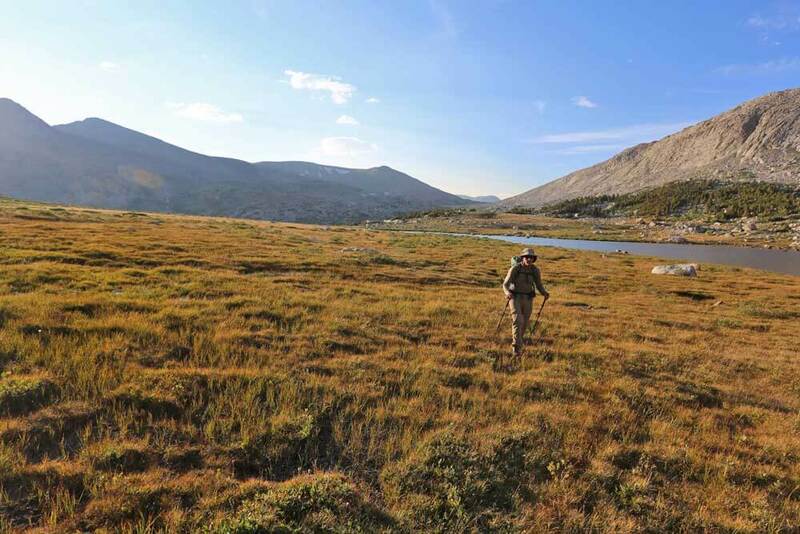 At Three Forks Park the trail turns abruptly west and you begin your ascent into the high country, climbing to just above 10000 feet and over Vista Pass. 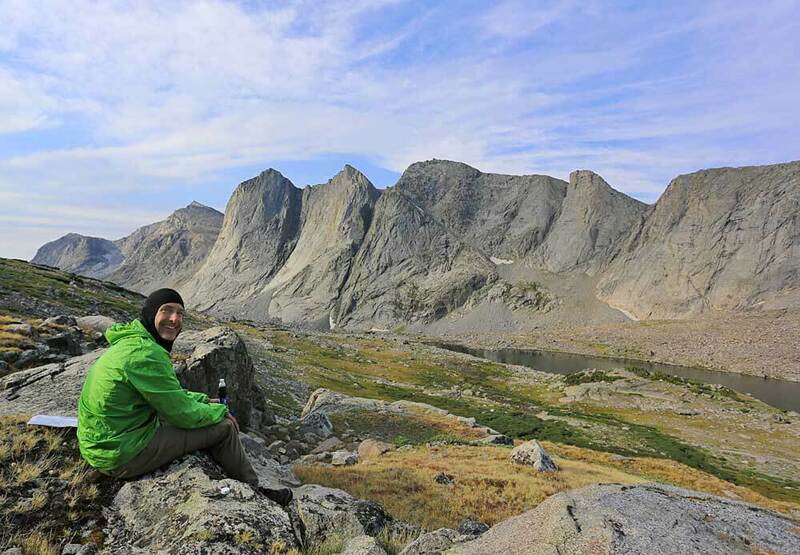 A slight drop and then a climb into a rocky basin towards Cube Rock Pass will bring you above 10000 feet once again. The High Route will stay above 10000 feet for the next 5 or 6 days, not dropping below this barrier until the final hike out to the car, just a few miles from the Big Sandy Trailhead. From Cube Rock Pass continue on the trail toward Peak Lake. 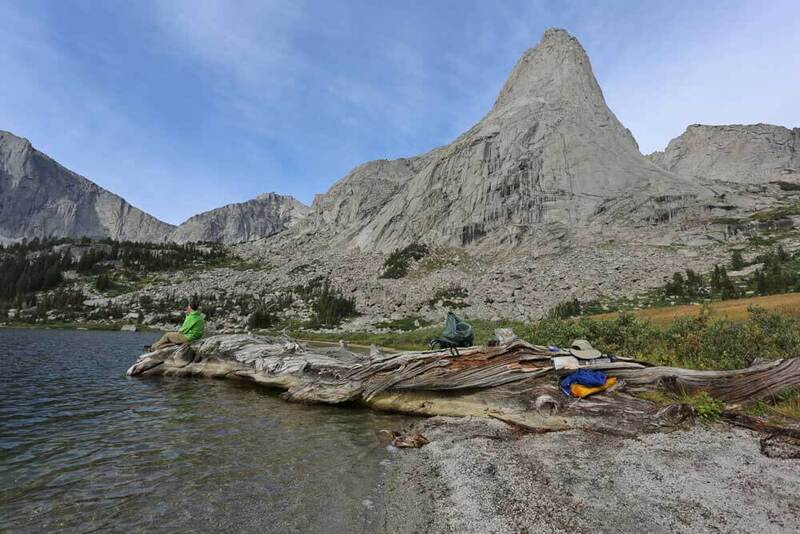 There is decent camping on the west side of Peak Lake, but even better camping in the basin just east of the lake. From the outlet of Peak Lake, curve around its north shore, passing through a large talus slide that drops all the way to the shore. Then wander east toward Knapsack Col. Use trails can be found sporadically along parts of this valley. As you near the Col, look for use trails that descend directly down from the pass. High on the south side of the basin as you approach the pass is the Stroud Glacier. This glacier is commonly identified as the source of one of the largest rivers in the western United States, the Green River. The river drops north out of the Wind River range, then turns south and winds its way through Wyoming and Utah, traversing some of the finest canyons in the world. 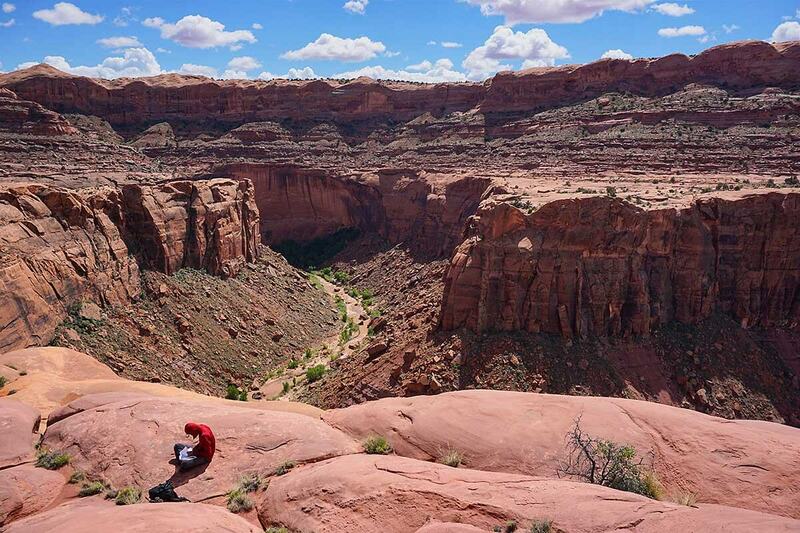 Eventually it merges with the Colorado River in Canyonlands National Park, before heading onward through the Grand Canyon and down to Mexico. Alan descending from Knapsack Col, looking into the upper Titcomb Basin. The lower portion of the Twins Glacier can be seen on the right. Considerable ice lies hidden below the talus and made the lower portion of this descent more interesting than we expected. 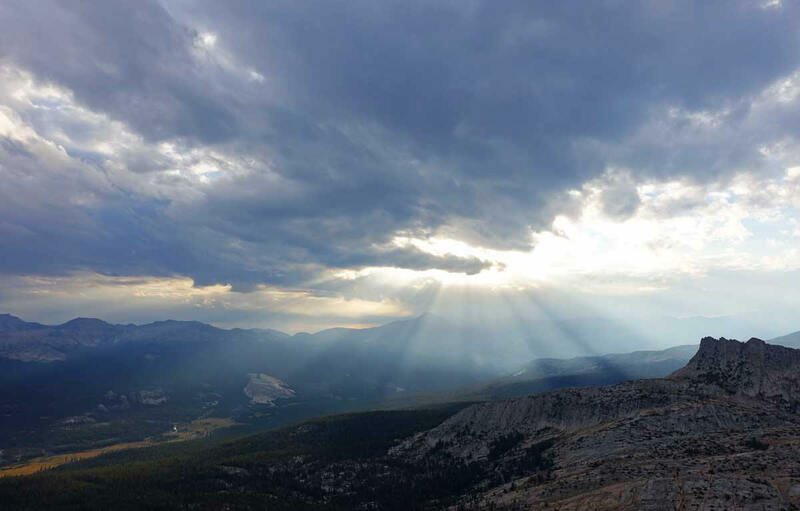 From Knapsack Col (about 12200 feet) you are treated to one of the finest views on the entire Wind River High Route. 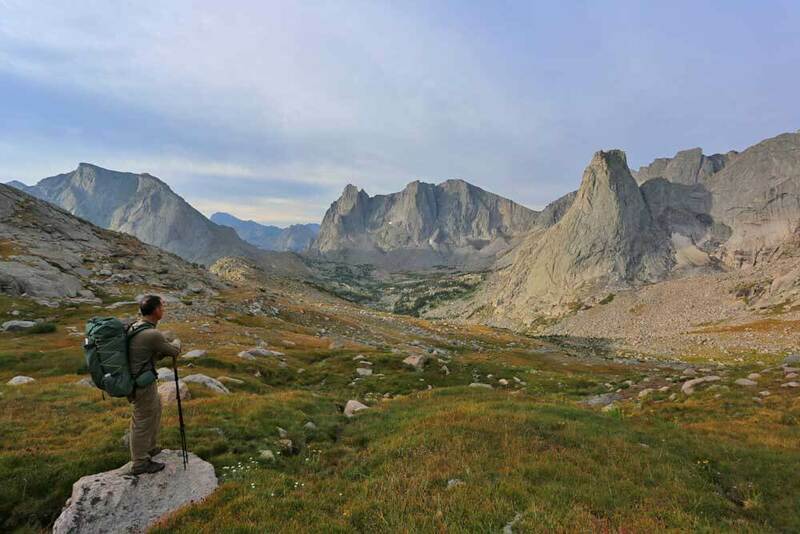 The alpine cirque at the head of Titcomb Basin becomes suddenly visible to the east, while the view to the west reveals the far off ranges of western Wyoming. The east side of Knapsack Col holds far more snow than the west side, and in most years the descent down the east side will require crossing moderate snow slopes. On our recent hike in the late summer of 2013, we were able to descend directly down the east side, crossing only a few small snow and ice patches. Leaving the pass going east, if you see snow below head off to the left, avoiding the steep slope directly below the pass. Continue down and left across talus and then head back to the right as you near the bottom of the initial headwall about 250 vertical feet below the pass. Wildflowers in upper Indian Basin. The route from Indian Pass to Camp Lake is the highlight of the trip. 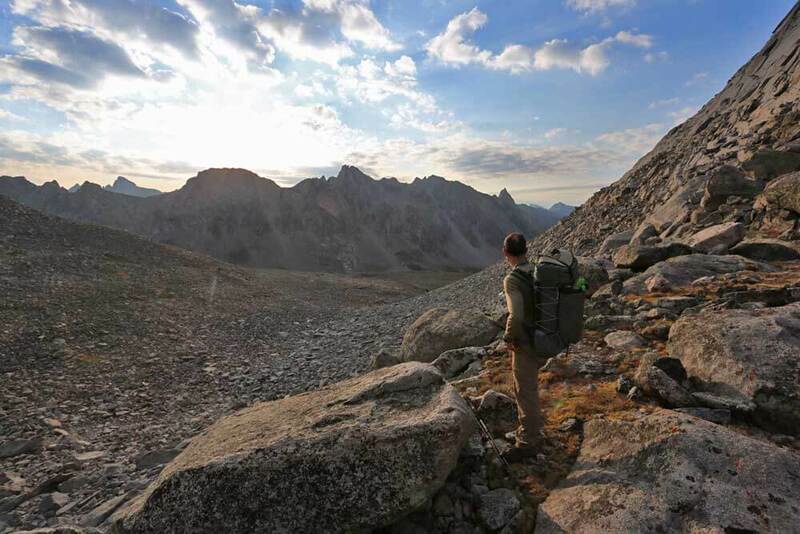 It passes through the most rugged and impressive terrain of our Wind River High Route. It traverses across the massive Knife Point Glacier, the southernmost glacier in of a chain of glaciers on the east side of the Divide extending all the way from Gannet Peak (WY highpoint) and the enormous Dinwoody Glaciers that surround the peak. 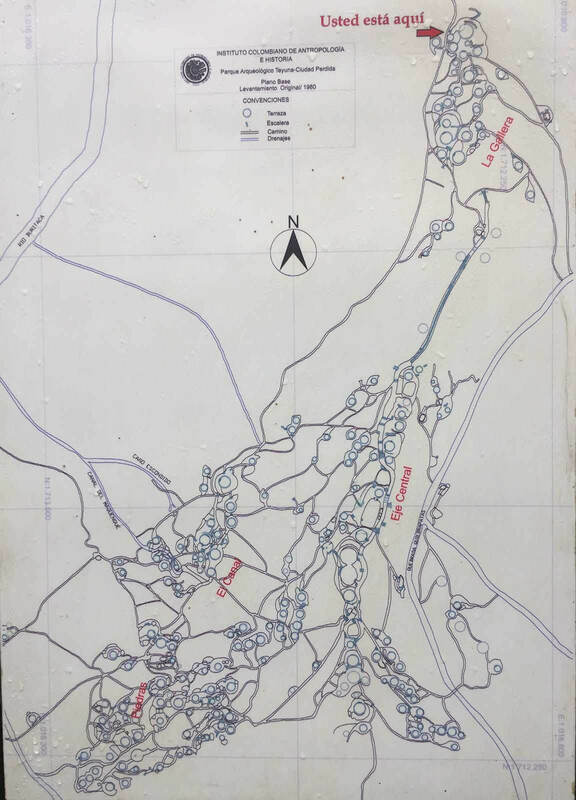 This section also contains the most challenging navigation of the trip and the only class 3/4 terrain (although it may be possible with a bit of extra trekking and scouting to avoid anything over class 2). This entire section may be avoided with an alternate off-trail route*. Starting from the small lakes at the end of Indian Basin ascend a use trail east towards Indian Pass. We lost the trail a few times but the Pass is obvious. The view from the Pass is stunning. Rugged and seldom visited canyons of the eastern range spread out before you. 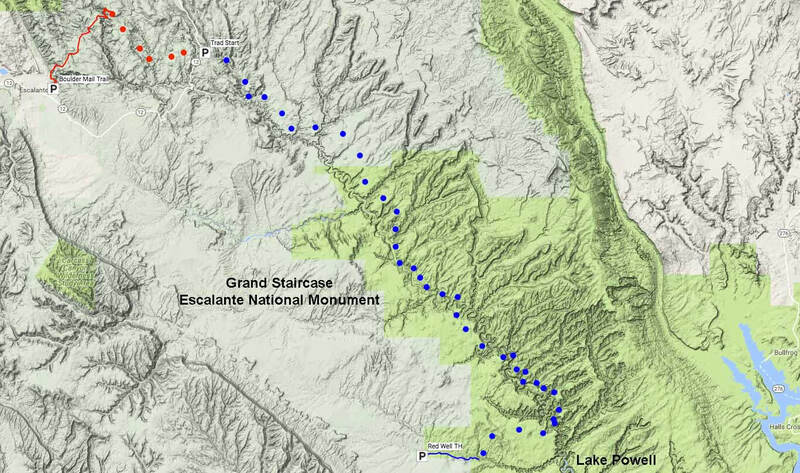 To the north extends crest of the continental divide with a chain of glaciers flanking its eastern slope. This is an excellent spot for lunch or a snack break. Looking east you can see the obvious saddle of Alpine Lakes Pass above the easternmost extension of Knifepoint Glacier. 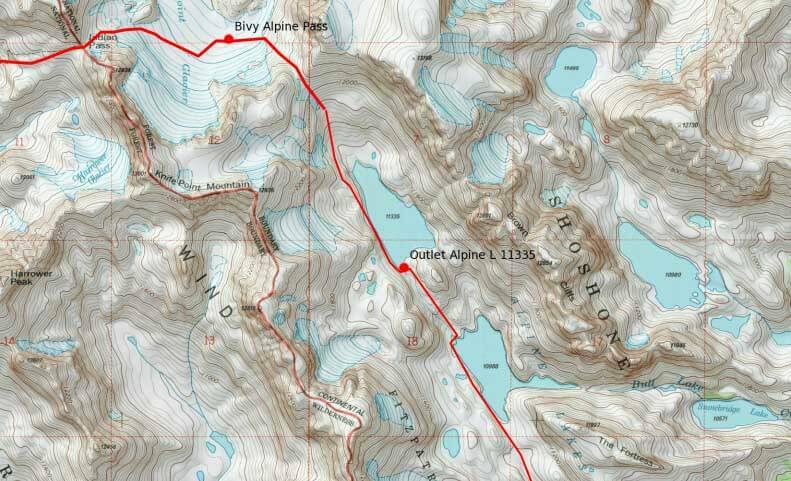 To gain access to the flatter and more walkable portion of Knife Point Glacier, descend NNE from the Pass and along the right base of the 11,840 promontory just west of “Point” on the map. Some of the talus dropping down to the glacier is a bit unstable. Actually much of the talus adjacent to the glacier is unstable due to climate change. This talus was until very recently part of the glacier and covered with ice. Since being exposed it has not had time to adequately settle, lock-up and become the usual more stable version of talus. So, beware of your footing on any talus near the glacier. Once on the glacier, traverse SE on the flatter area of the glacier between the 11,720 and 11,600 contours to stay above the steeper terminal slope. 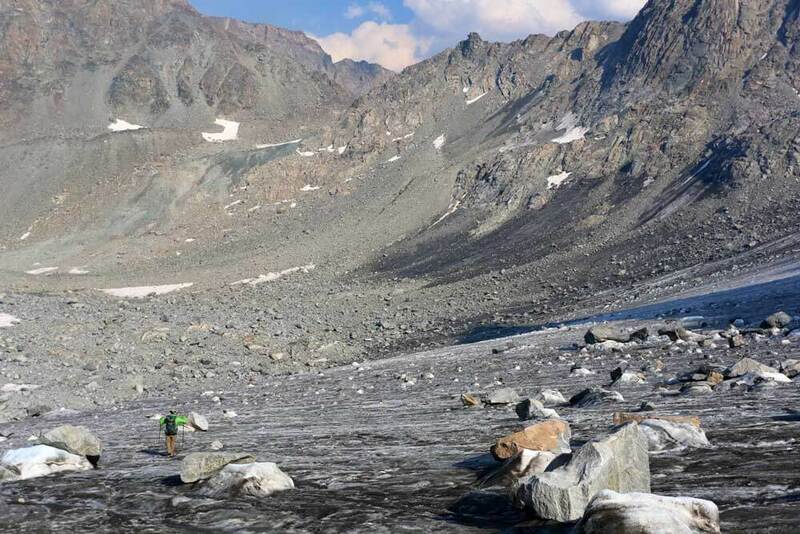 (By August on our trip the glacier had receded to around 11,560-11,520). 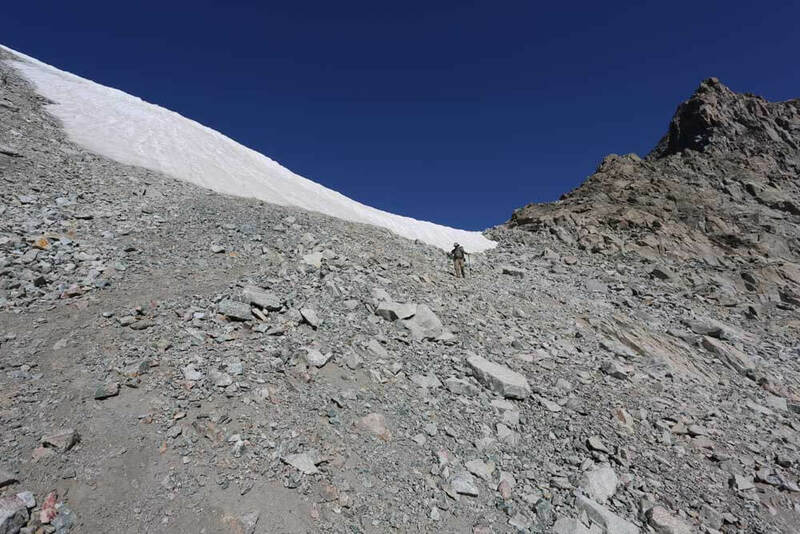 The goal is to attain a lower angle rock strewn ramp of the glacier at around 11,660, NE of ‘G’ of Glacier. We descended off the glacier at this point using the rocks for traction. Head NE across a talus field (quite unstable in sections) to the base of Alpine Col. 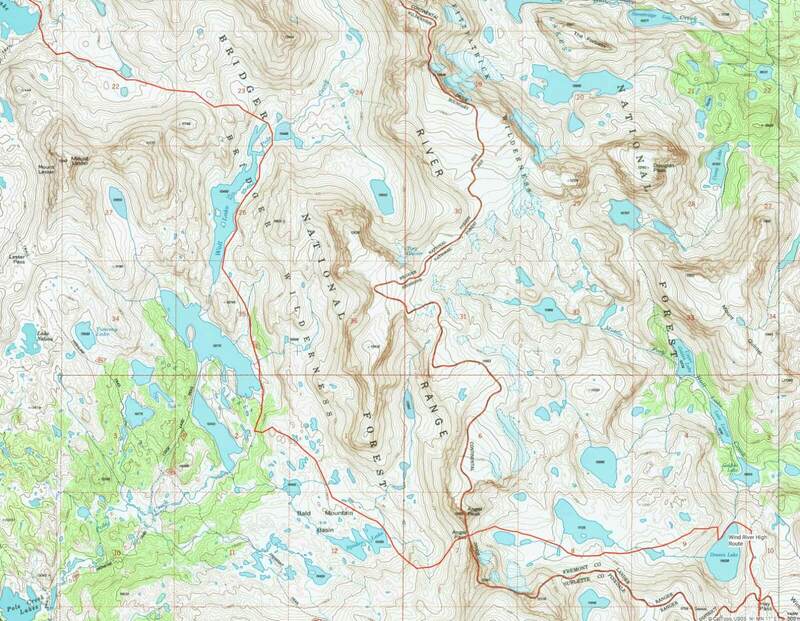 The only place to camp in this area are two man-cleared bivy sites as noted on the map and in the waypoints table. Bivy sacks only. Do not expect to pitch a tarp or tent here. There is small lakelet with good water. Approaching Knife Point Glacier from below Indian Pass. Our bivy site noted in the photo. Camp in the talus below Knife Point Glacier. Indian Pass lies in the obvious notch left of the setting sun. The ascent of the north side of Alpine Lakes Pass is straightforward. Good views from the top show the talus strewn, cliffy and deeply glacier-scoured valley that holds the brilliant gems of the Alpine Lakes. Be prepared for slow going in the Alpine Lakes Basin. 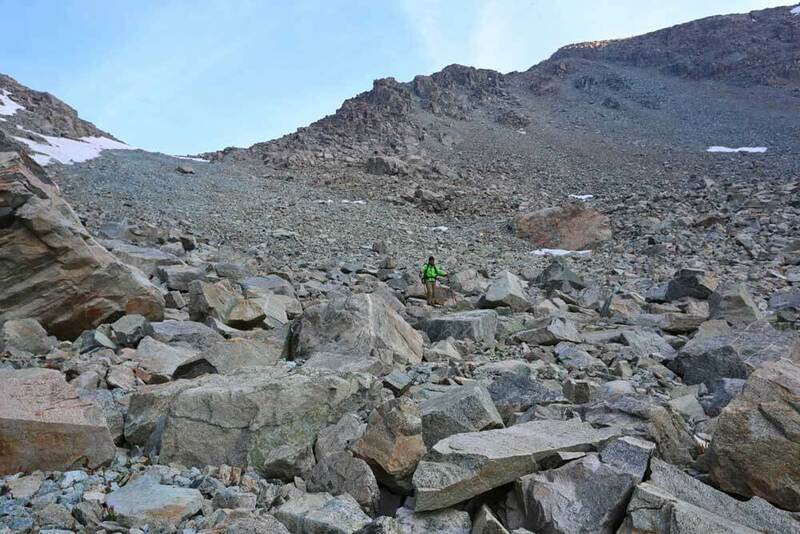 It is filled with large and plentiful talus and the hiking involves negotiating around cliffs that drop directly into lakes and other route challenges will make for tedious progress in sections. Dawn, Alpine Lakes Pass. Smoke from a small forest fire in the northern part of the range adds some color to the sunrise. Descending the south side of Alpine Lakes Pass. 2013 was a very low snow year. You can expect this pass to contain considerably more snow than shown here. Hike along the west shore of Lake 11,335, staying above the shore initially along talus filled ridges. The cliffs about 2/3 of the way along the shore appear impassable but “go.” Not visible from a distance is a short class 3 ramp system (climb up and down) near the lakeshore that allows passage to a flatter section near the outlet. Easy walking takes you down to the middle Alpine Lake (Lake 10,988), where you will have a pleasant stroll along its west side and down more talus to Lake 10,895. Here you will face a decision. We passed Lake 10,895 on the north side. It is plain sailing along the shore until you are almost to the outlet where a 50-100 foot section of cliffs ruin the party. We climbed a class 3/4 crack system above a stand of white pines (handing packs up in a few places) for approximately 75 feet to gain flatter ground above the cliffs. We then descended gentle ramps to the outlet. Views from outlet of this lake are stupendous. 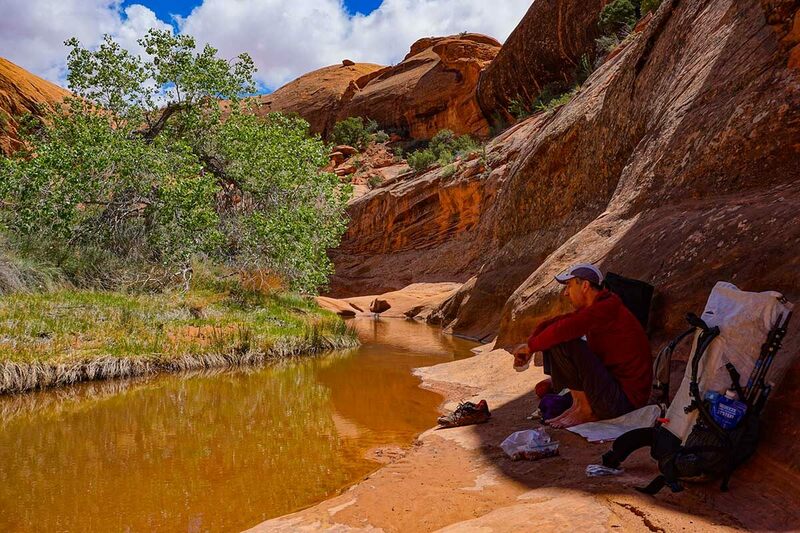 It would make an excellent lunch spot or campsite. Alpine Lakes Basin and the middle Alpine Lake (Lake 10,988). We saw no one as we passed by the upper and middle Alpine Lakes. Revised 2016: Your alternative route is along the south shore of Lake 10,895. While longer and more time consuming, this would probably be a class 2 route to the outlet. In fact, Henry Shires (and others who have hiked the route) confirm that the south shore of Lake 10895 is the safer option. This avoids the Class 4 exit crack on the north shore near the outlet. From the furthest east projection of Lake 10,895 we headed ESE and dropped into a shallow drainage that feeds an unnamed lake adjacent and south of Lake 10,239. Use ramps and gullies to make your way between cliff bands and steeper rock on the approach to the lake. There is a use trail from this unnamed lake to Camp Lake although it is easy to lose. The marked trail from Camp Lake to Lake 10,787 is not frequently traveled and is no more than a use trail in sections. We lost it a few times but easily re-found it. The route to Lake 10,787 is obvious, but the trail when you can find it is faster and is less effort. 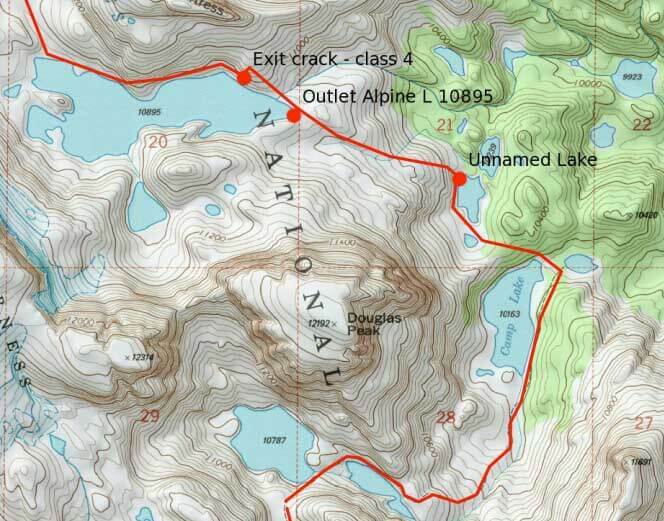 The trail from Lake 10,787 to Golden Lake is more established. For the most part it is easy to follow although it can braid into multiple trails around the Golden Lakes. 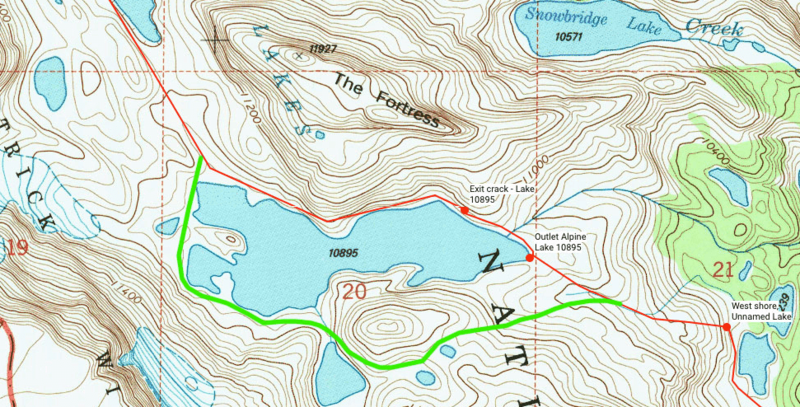 Revised 2016: Shortcut from Lake 10895 south to Lake 10787: The pass between “Peak 12314” and Douglas Peak goes. You can regain the trail to Golden Lakes on the south side of Lake 10787. Heading to Island Lake and then to Wall Lake and over the divide east of Tiny Glacier and down to Upper Golden Trout Lake. Click on map image to enlarge: Brendan Leonard of www.semi-rad.com hiked the Angel Pass route variant and provides this route info map. 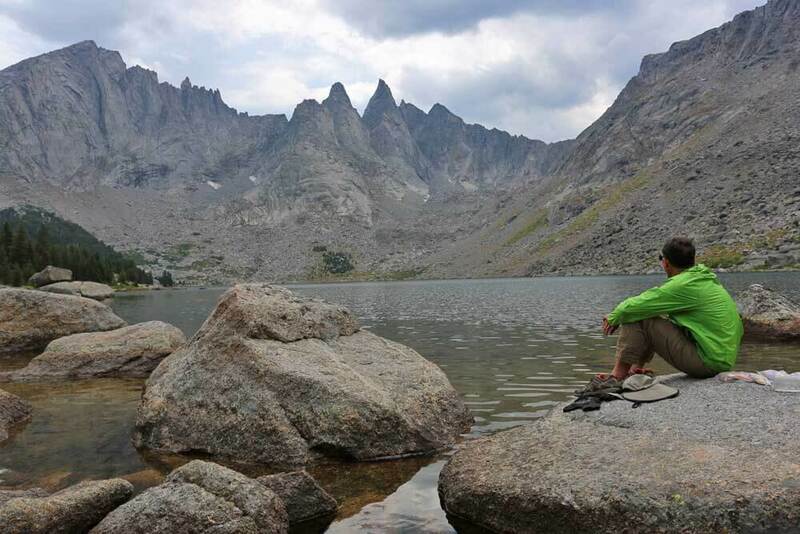 Alan enjoys dinner along the shore of Golden Lake before the climb to Hay Pass. At the southern tip of Golden Lake a small inlet stream is the last good water source before Hay Pass. We ate dinner here on the shady, cool gravel next to the lake. A bald eagle soared over the water that evening, scouring for trout. 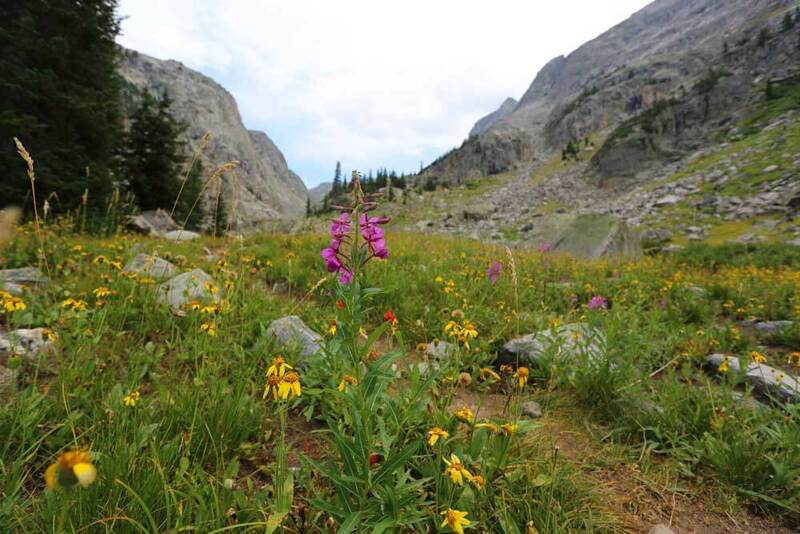 Ascend the trail to shallow and picturesque Hay Pass, crossing to the west side of the continental divide. 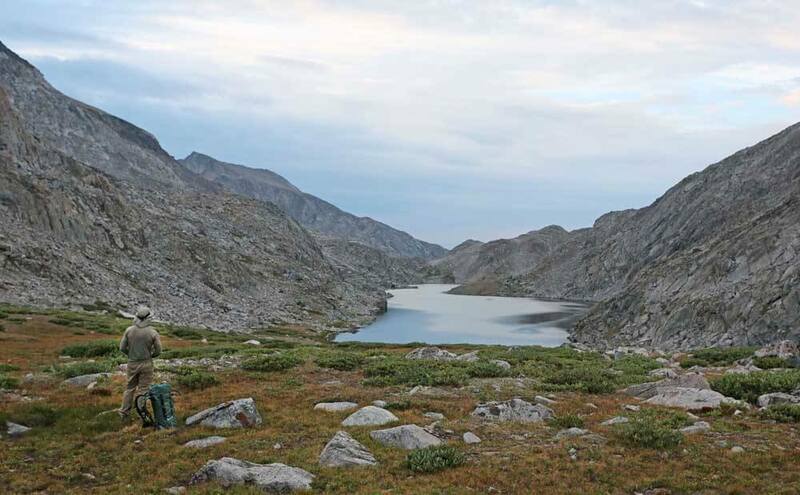 From the pass, a trail descends gradually to the west, passing along the eastern side of Lake 10,756. At about 10,600 feet leave the trail and head toward the obvious basin to the southeast. 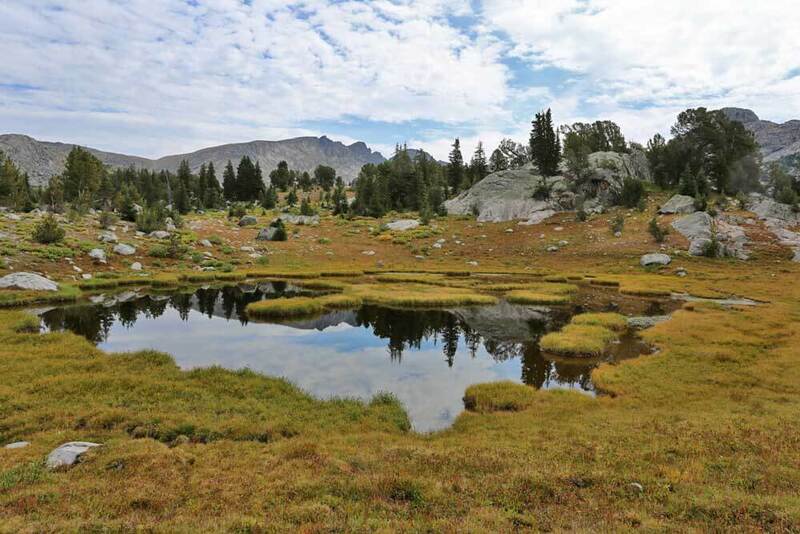 After arriving at the first major lake in this basin, continue along a very flat and grassy (and frequently boggy) valley floor toward the southwest shore of Lake 10555. We found a poor campsite in the low pines along this shore. Camp somewhere else if your schedule allows. The warm water from this lake tasted distinctly unpleasant and tannic. Hiking toward Lake 10555 near sunset, with Hay Pass and the Continental Divide in the background. The basin will likely continue to be and boggy wet until you begin to rise toward a low pass before Lake 10,683 (sometimes called Long Lake). Hike along the eastern shore of this remote lake. The going gets rougher as you get near the west end of the lake, where you negotiate a few ramps and plenty of talus without significant difficulty. Continue over a small rise and drop into isolated Europe Canyon. Here you will join a trail and head southwest for a short while (probably less than a half mile, depending on where you merge with the trail) until you can cut directly to the eastern shore of Lake 10,542. This easily passible shoreline takes the most direct line to a slope on the far side of the lake. Climb about 300 feet over a small pass, and along the north side of Lake 10,806. Long Lake (Lake 10,683). The route follows the shore and slope on the left (eastern) side of the lake. The going gets harder at the far end of the lake. Now begins an intricate traverse toward the outlet stream on the southwest side of enormous Hall’s Lake. Expect plenty of zig zagging through brush and trees, and many small drops, climbs, bogs, and lakelets. Finally arriving at Hall’s Lake, turn to the south and pass a couple of small lakes. Continue to the south around Peak 11586. As you pass this peak, head east toward your next landmark, the outlet of Middle Fork Lake. This section is marked by beautiful and pleasant walking past many small ponds filled with plenty of big fish. Lakelet and bog between Hall’s Lake and Middle Fork Lake. Looking north toward Lee Lake and Middle Fork Lake from near the base of Pronghorn Peak. Moonrise over our campsite at Bonneville Lakes. Your next goal is the pass between Mount Bonneville and Raid Peak. From Lake 10,521 do not ascend directly up the steep and heinous route up the lake’s inlet stream on the SE corner of the lake. Instead, follow a lower gradient route SW of the inlet stream. Don’t turn left and up into the shallower portion of the inlet stream drainage basin until you have reached flatter terrain (just above the red ‘2’ on the map). The ascent to the pass is straightforward. To confuse things, there are numerous use and game trails that seem appear and disappear without reason. Alan gazes at impressive Mount Bonneville before beginning the descent through the massive talus field below the pass. There is a long stretch of size Large to XL talus as you descend the east side of the pass and make your way to small lake directly east and above Lake 10,566. To avoid the steep terrain north of Lake 10,566, head east or southeast towards the prominent south-pointing nose of the 11,000 ft contour. Use a small ramp system just southeast of the nose to reach flatter terrain below 11,000. The outlet of the small lake makes an excellent rest stop with good water and superb views. Early morning snack stop overlooking Lake 10,566 and the extensive ridgeline extending south from Raid Peak. The route from here is straightforward trail walking to Texas Lake. 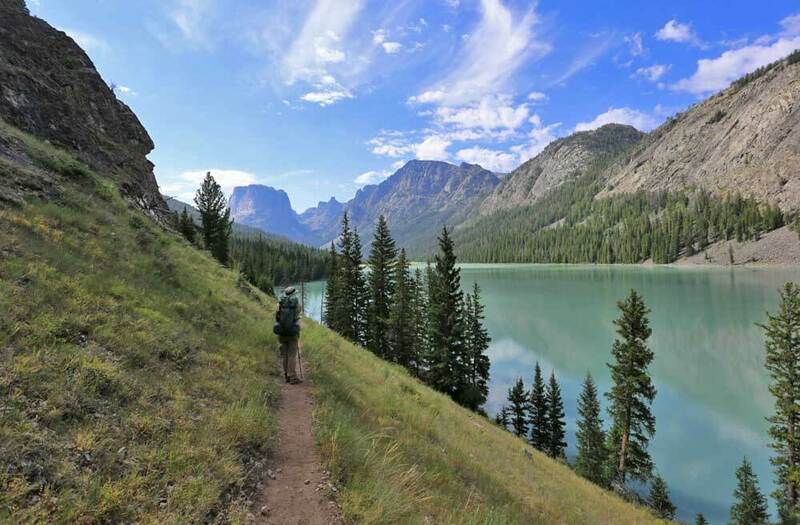 Hike the trail from Pyramid Lake to Washakie Creek. Cross to the south side of the creek and head upstream (east) towards Shadow Lake. Here there are superb views of the backside of the ridge forming the Cirque of the towers. It is an excellent spot for lunch. Shadow Lake: Storm clouds brewing over the backside of the Cirque of the Towers. This storm shut us down for the day before we could cross Texas Pass and make our way into the Cirque of the Towers. Follow a use trail (we lost it a few times) to the small lake below Texas Pass (the pass between peak 11,925 and peak 12,537). This lake is locally known as Texas Lake. There is excellent camping in the meadow on the west side of the lake. A long and violent afternoon T-storm with wind, hail and sleet forced us to hunker down in the late afternoon on the shores of Texas Lake. We waited out periods of sleet sliding in large sheets off of our Cuben Tarp (our only shelter for the trip). By dusk the storm had not sufficiently cleared. 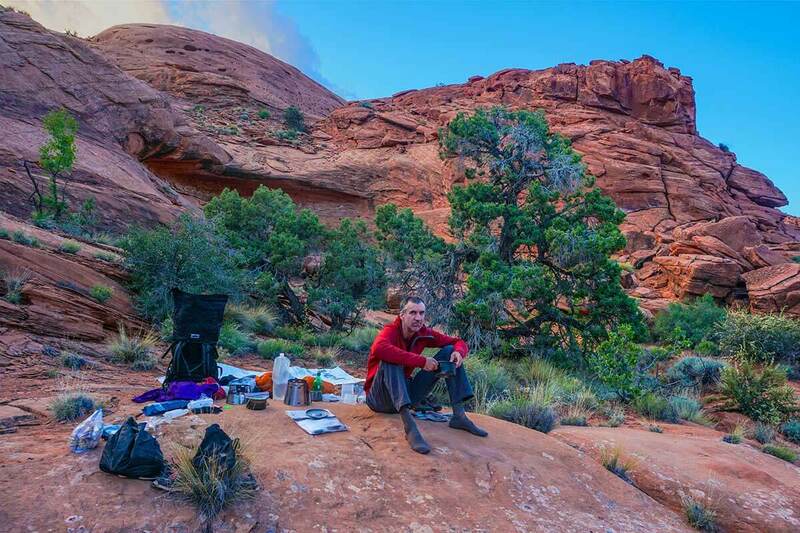 We gave up on our plans to camp in the Cirque of the Towers and settled down for the night. There are much worse places to camp! Storm showing signs of clearing in the late evening below the north side of Texas Pass. 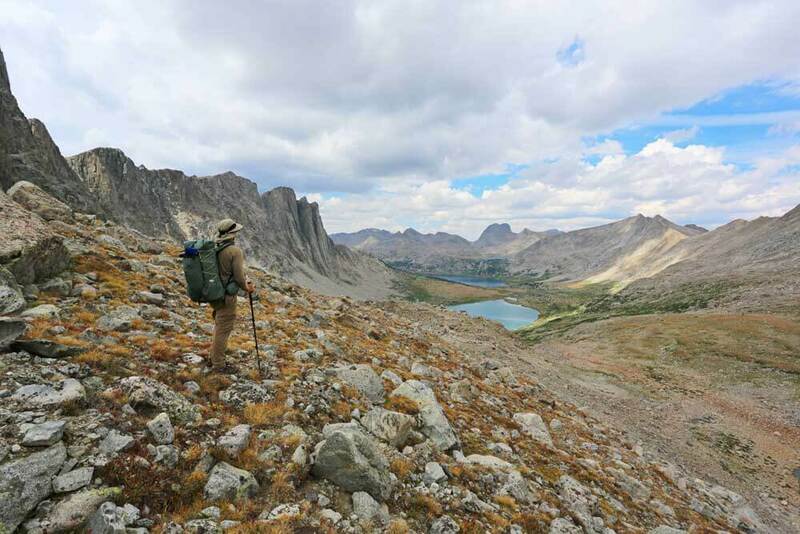 The trip over Texas Pass and into the Cirque of the Towers is second in splendour only to the Indian Pass to Camp Lake Section. 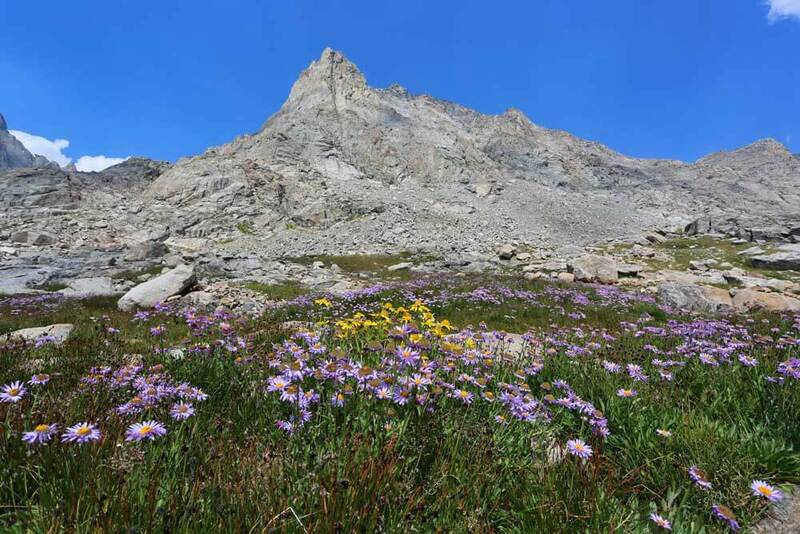 Needless to say the Cirque is legendary for both its stunning beauty and as hallowed ground for some of the best alpine rock climbing in North America. It should be on every backpacker’s bucket list. The view into the Cirque of the Towers from near the top of Texas Pass. From the Texas Pass the use trail loosely follows the NE branch of the inlet stream for Lonesome Lake, passing through a stand of pines around 10,400 before reaching the grassy lakeside. We had a cup of morning coffee on the lakeshore while watching climbers ascend Pingora. Alan got his rod out, selected a beautiful native cutthroat trout, landed it and gently put it back. Sated with the beauty and serenity of the Cirque, we felt it was time to leave. Lonesome Lake and Pingora in the Cirque of the Towers. If you plan to stay the night in the Cirque: There is excellent camping in the basin below Pylon Peaks and Warrior Peaks. We traversed off-trail around the eastern side of Lonesome Lake and acquired the official trail to Jackass pass around 10,400 ft. The route out to Big Sandy Campground from Jackass pass is a major trail with tons of traffic and the usual deeply eroded and braided trail sections. Nonetheless, Big Sandy Lake is a gem and a lunch or snack stop on its shores is a must. And on the final leg of the trip don’t forget to look back now and then to appreciate the lovely Big Sandy River and the mountains behind. Late Summer. Gives time for high snow fields to melt out. Less mosquito pressure. By mid-Sept there’s a chance of early snowstorms. 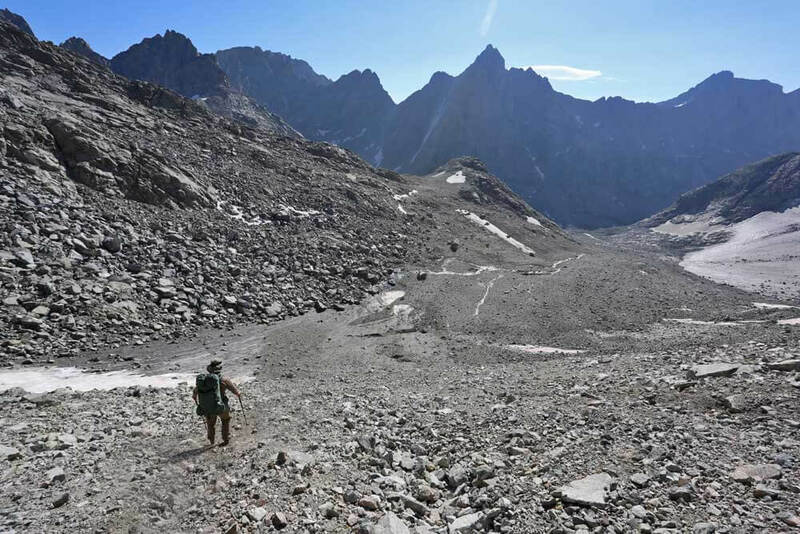 See Climbing and Hiking the Wind River Mountains, by Joe Kelsey for more information on weather and other objective hazards in the Wind River Range. There are a few alternate routes on the maps in addition to our main route. They are colored blue. The following table should be of use to estimate hiking times for the route. Obviously you’ll need to calibrate your personal hiking pace to the speed that Don and I walked. 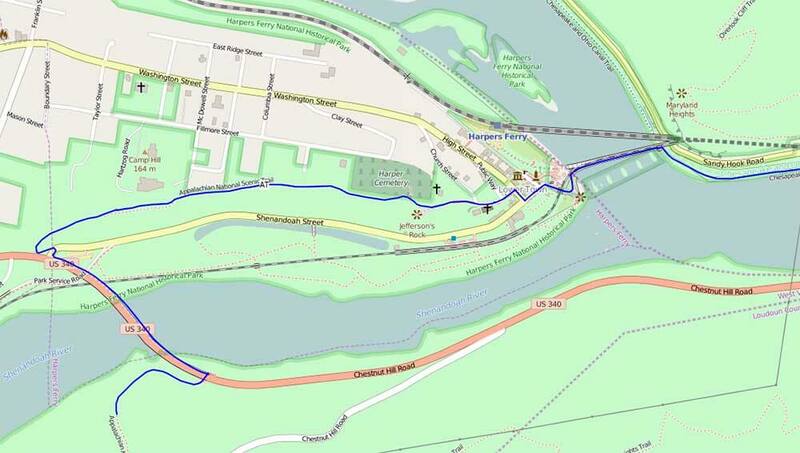 The table also includes the location of a few tricky sections of the route. It should save you some scouting time and/or prevent you from hiking a long ways along a bad route choice. Finally, the table does not include hiking mileage, since for the most part it is not a relevant piece of information. For some hikers, a few sections like Alpine Lakes Basin may require a two hours or more to cover a mile. 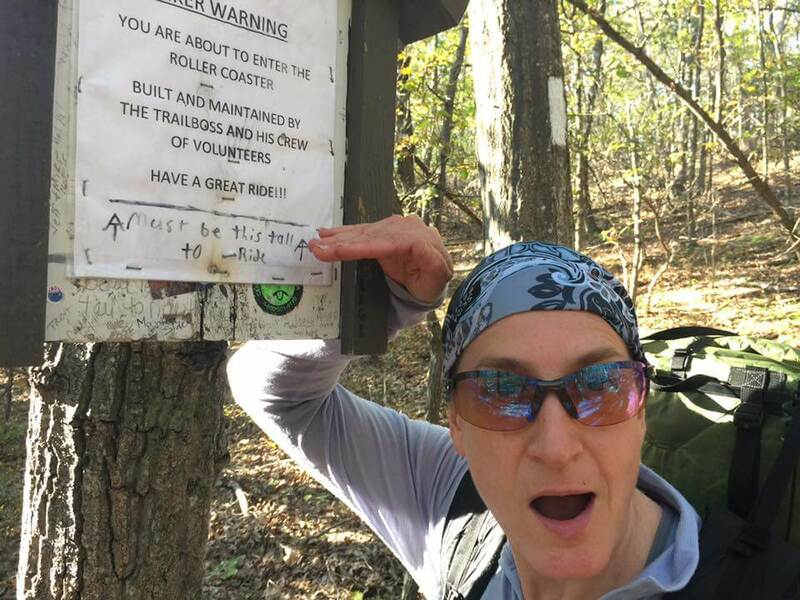 The route is approximately 80+ miles of on-trail and off-trail travel with about 20,000 ft of vertical gain. Times are for Alan and Don who are reasonably fit hikers. You will need to estimate your pace from our hiking times. We are not G-d’s gift to high speed through hiking. We are over 50 years old, and did no altitude acclimatization before the trip. At trip start we went from sea level to over 12,000 ft in about 24 hours. While we traveled light, we weren’t super light. Alan’s pack was 27 pounds with a small camera, a SPOT and Satphone and Don’s was 30 pounds with a Canon 5D full-sized DSLR carried for HQ photos & video. Even though the goal was to hike at a steady but sane pace, for a long time, with a limited number of stops, we still ended up with 1 to 2 hours per day of non-moving time. *Hours (hiking times between points) is just that—hiking/moving time only. These times include only short stopped tasks like tying a shoelace, putting on a rain jacket, or filling a water bottle. We carried a SPOT tracker for the trip, and any stopped time over 5-10minutes was not included in hiking time. A local shop in Pinedale, The Great Outdoors, will shuttle your car from one trailhead to another. Their service was excellent and the convenience of a shuttle made the logistics of the trip much easier. Revised 2016: Below is a comprehensive list of Gear for the WRHR. My pack was 27 pounds with food, a small camera (Sony a6000 kit 1.8 pounds), a SPOT (now I would take the far better inReach SE 6.9 oz), and an Iridium 9555 SatPhone 9.7 oz. Obviously I could have saved a few pounds with less camera and electronics (but we were intent on fully documenting the trip). Shelter: Don and I shared a Mountain Laurel Designs Grace Duo Cuben Tarp 7.8oz (225g). We survived a strong T-storm with high winds just fine. Action suit: SmartWool NTS lightweight zip T supplemented with a Fleece Top when cold and windy. 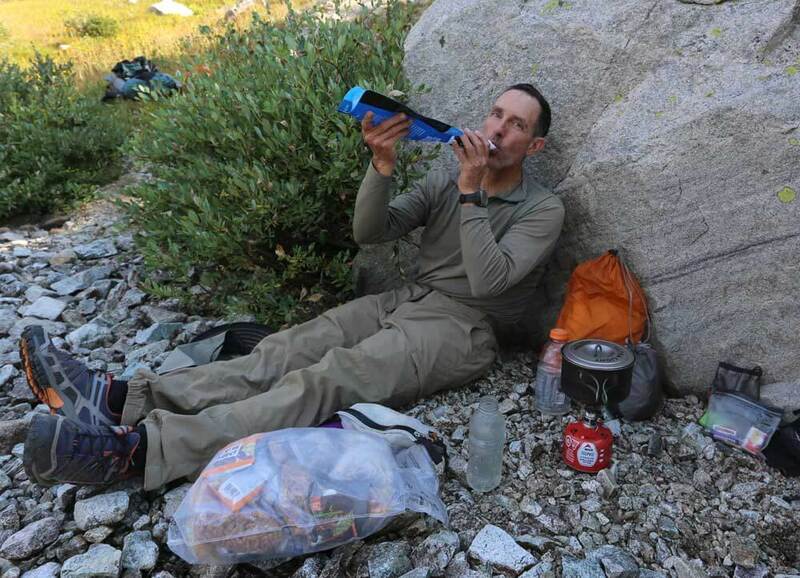 Or to see the full gear can click on this link: 9 Pound – Full Comfort – Lightweight Backpacking Gear List (original table). Books. If you don’t have a copy of Climbing and Hiking the Wind River Mountains, by Joe Kelsey, you simply must get a copy. The book is an obvious labor of love, and has a ton of great information. Wind River Trail Maps. 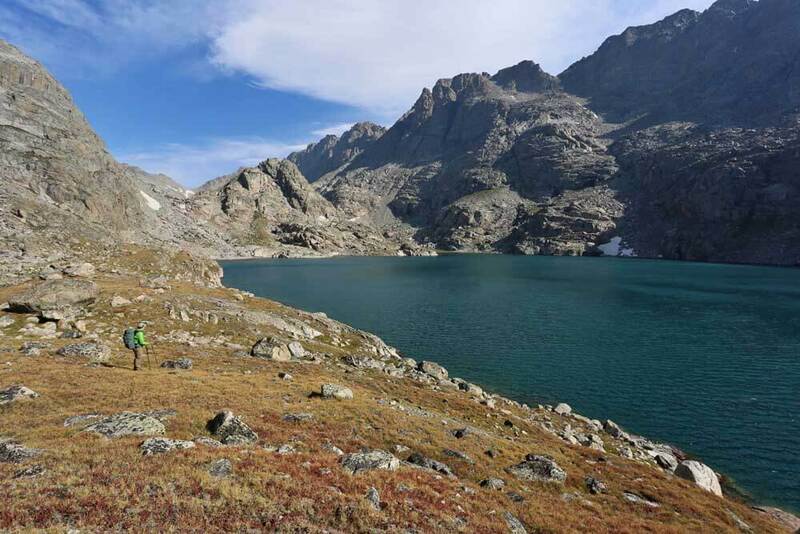 Earthwalk Press publishes two Wind River Range overview maps (one for the northern part of the range, and another for the southern portion). These are handy for seeing the entire range, possible alternate routes or emergency exit points. Our route skips Gannet Peak & the Dinwoody Glaciers. A superb addition if you want. But difficult, time consuming, and potentially technical, requiring at a minimum ice axes and crampons. And for all but the fittest alpine travelers, adding this section would put the route beyond a weeks vacation. Less convenient trail heads? No easy shuttle? One could go higher and stay closer to the divide in some sections. E.g. the alpine lakes section detours around douglass peak via Camp Lake and the route also skirts around Mt Bonneville. 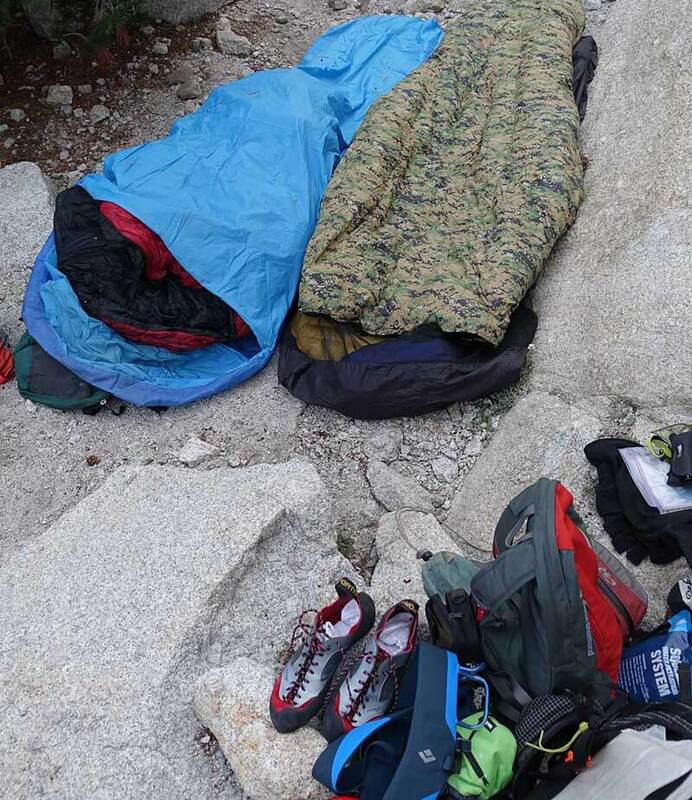 Technical Peak Climbing Yosemite Backcountry: Mt. 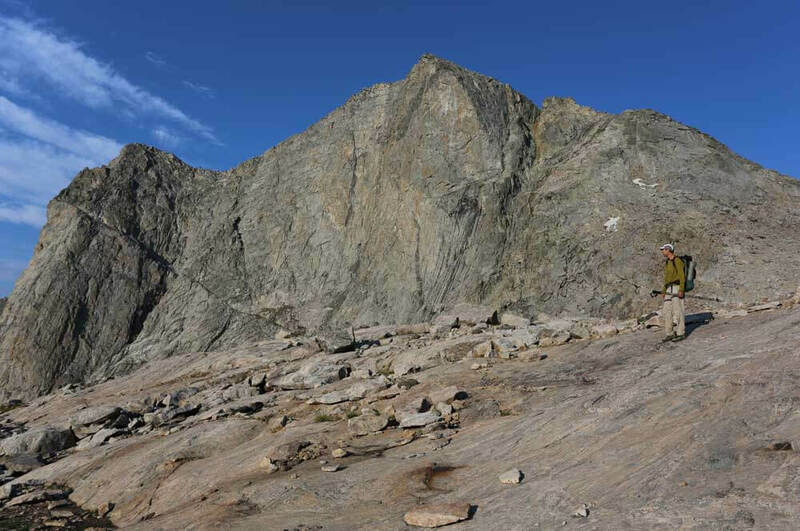 Conness – West Ridge. 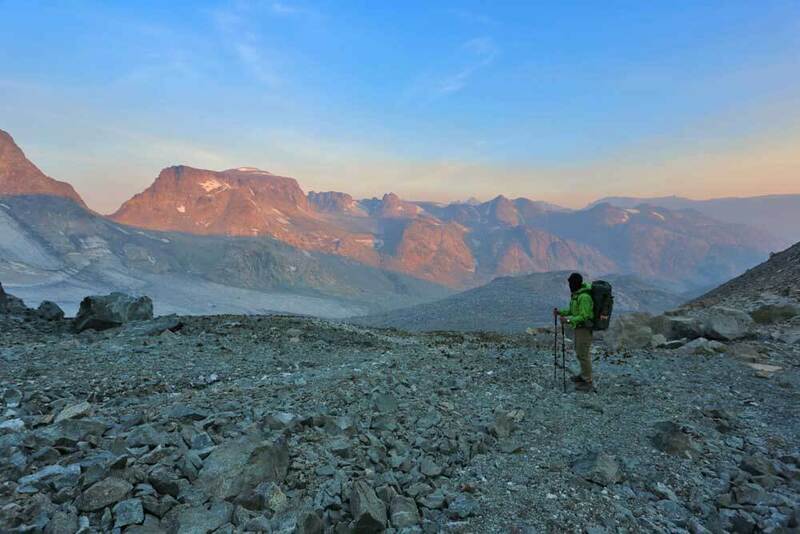 The third peak of our trip and one of the finest alpine routes in the Sierra Backcountry. The route follows the obvious ridge which forms the sun/shade line. This summer, after years of “no-rope trips” together, we switched gears to do some technical alpine climbs in the Yosemite Backcountry. 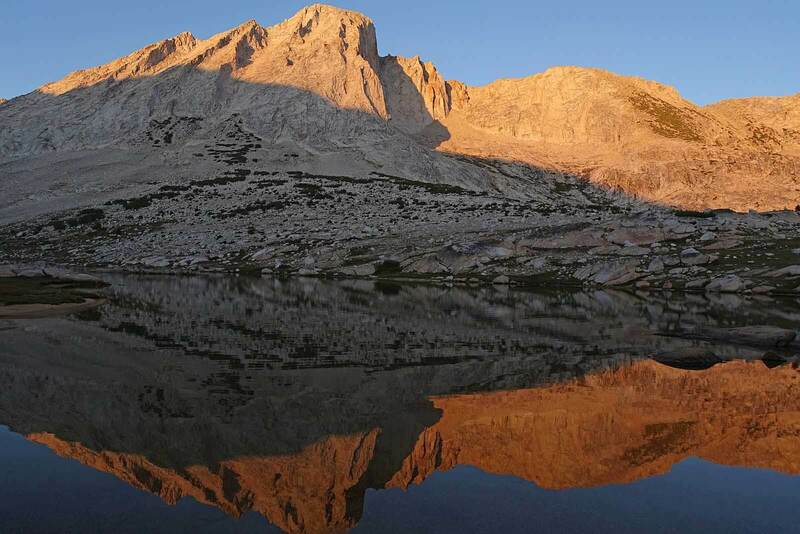 We decided to do two Tuolumne alpine classics, the Southeast Buttress of Cathedral Peak and the West Ridge of Mt. Conness. Our last alpine summit was Mt. 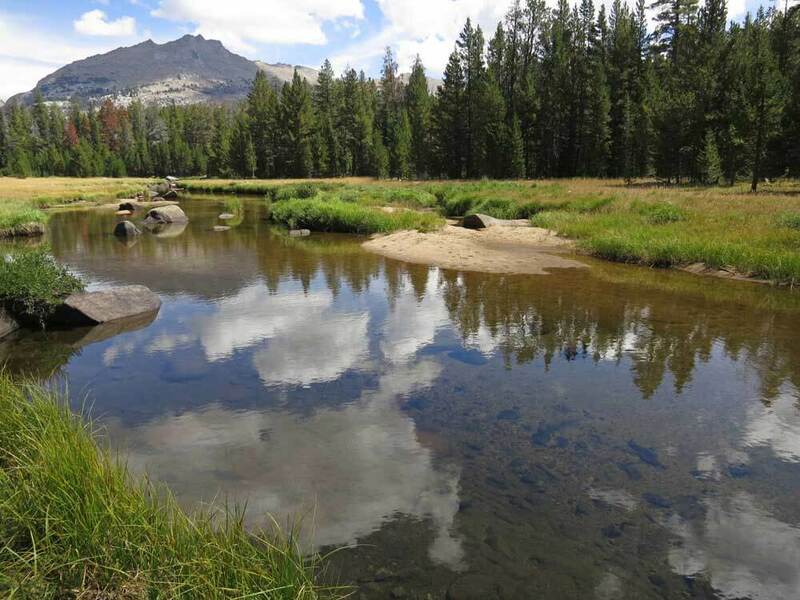 Lyell, the highest peak in Yosemite National Park (more later on the reasons for choosing Mt. Lyell). Fun: All of these peaks are moderate technical climbs. Our goal was to not stress out—just enjoy being in the Sierras on some of the finest alpine climbing in the world! This trip report of our climb of the Cathedral Peak’s Southeast Buttress, is the first of the series. It’s good to switch it up. Do different things. Take an alternate approach. 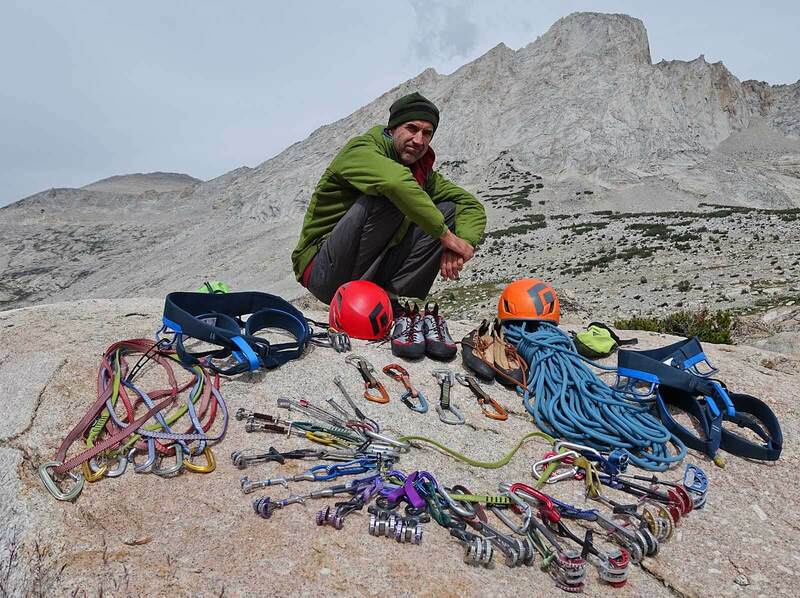 After years of traversing the Sierras without a rope, Don and I carried some hardware with us to so some technical climbing. Fun! Weather was a major factor for all our climbs. The Sierras had entered into a long-term pattern of unstable and violent weather a few weeks prior to our trip. Rain was so heavy the week before that a huge landslide closed one of the major roads into Yosemite. Almost 3 weeks later, it had yet to be dug out. When you get hail this big pinging off your helmet you know you are in for some serious sh-t! We already had cloudy skies and spitting rain the afternoon we hiked in to Cathedral Peak. The serious rain was supposed to start around daylight the morning of our climb. We did everything we could to get started as early as we could and summit as fast as we could. That evening we climbed the first pitch before dark and fixed a rope. A look up at the bottom face of Cathedral Peak. That evening we climbed the first pitch before dark and fixed a rope to make a faster start the next morning. We settled into our bivy sacks a bit after dark. We slept fitfully worrying about the weather. During the night the sky continued to get darker and more threatening. About 4am raindrops on our face woke us—a light rain shower passing over. We looked at each other and said “Screw this! lets get go climb.” It only took us about 10 minutes to suit up, pack up, and hang our backpacks in the trees away from marmots (no food in our packs!). Little room on a ledge below the climb. Getting ready for a cramped and rocky bivy. All our gear is laid out to put on in the dark. We both used MLD Superlight Bivy sacks, I used a Hammock Gear Burrow +30 Quilt. And we both shared a MLD Grace Duo Tarp in Cuben Fiber in case of overnight rain. We were grateful for a fast start after fixing the first pitch the evening before. We quickly hit a rhythm, and climbing in the dark under headlamps knocked off the first 2 pitches before light began to seep through the clouds. As stated above, the Southeast Buttress of Cathedral Peak is an incredibly classic line. Perfect rock, good protection, moderate 5.6-5.7 climbing, face, cracks, chimneys – it’s got it all.